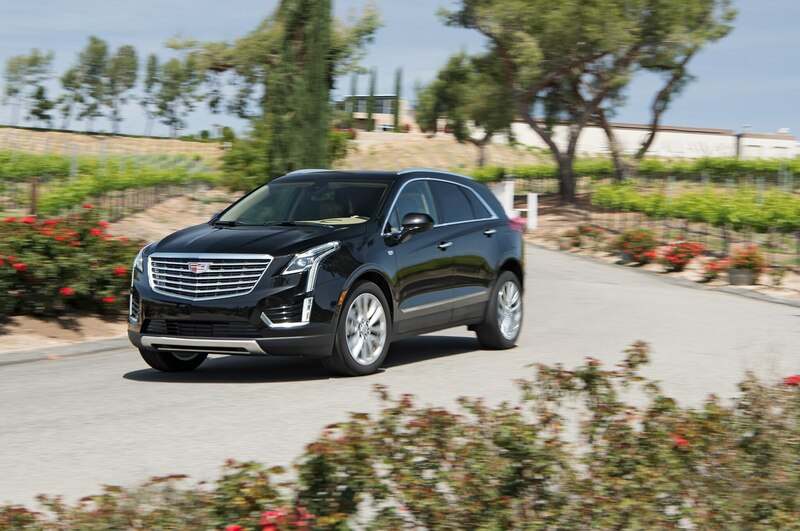 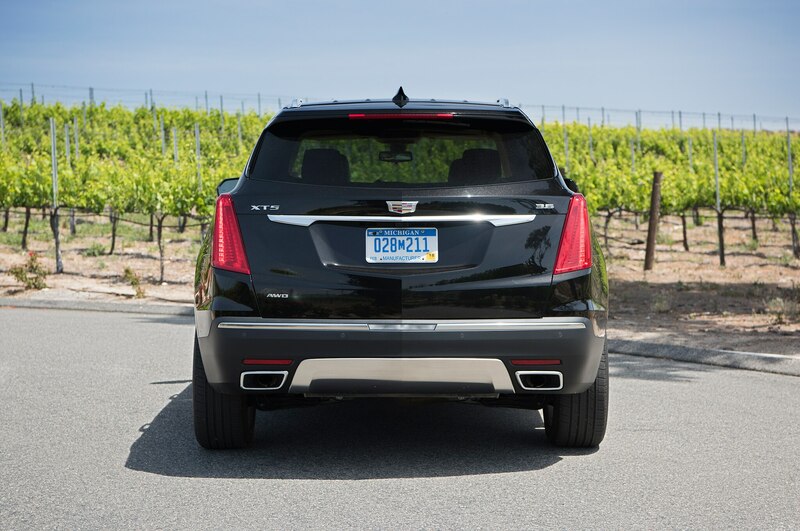 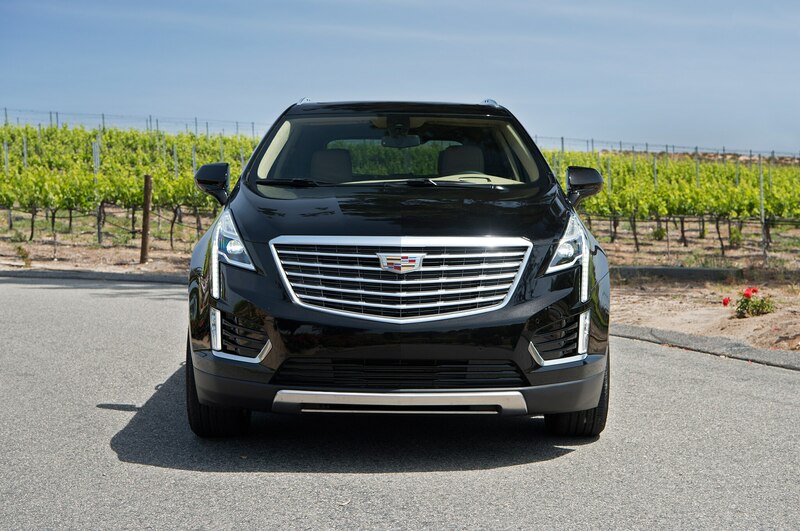 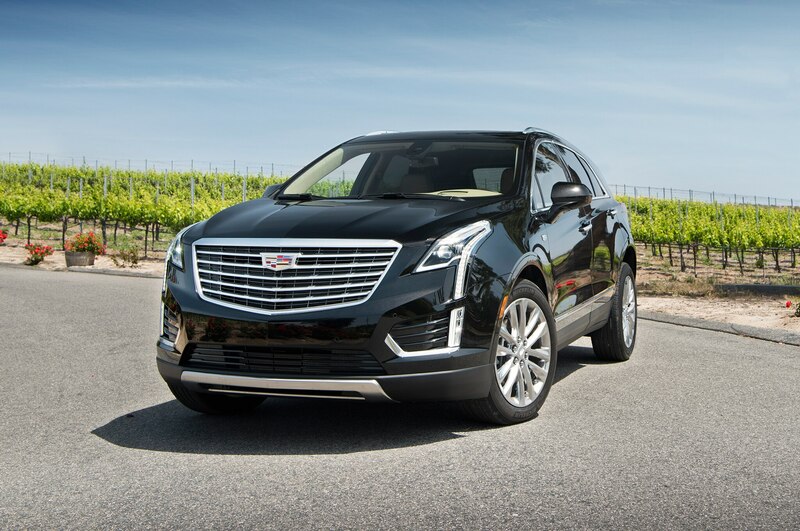 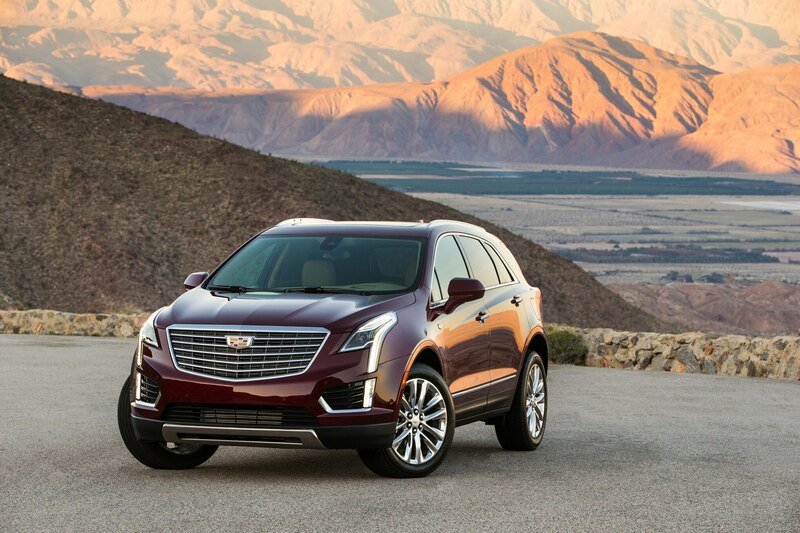 DANA POINT, California — The latest fashion in resort wear is the Cadillac XT5, a crossover that turns every drive into a tour of Tuscany. 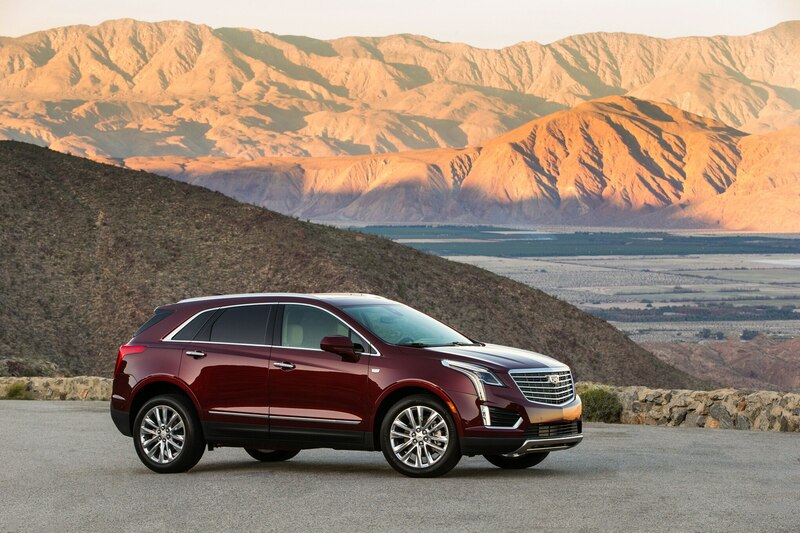 Or, you know, California. 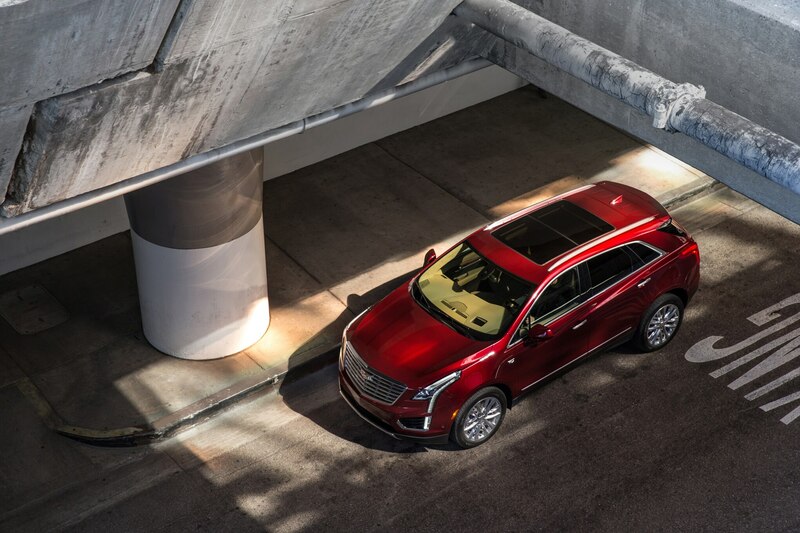 So when you burst through the lobby doors and come out beneath the big roof of the hotel’s porte cochére, you’ll always be happy to find a Cadillac XT5 waiting for you. 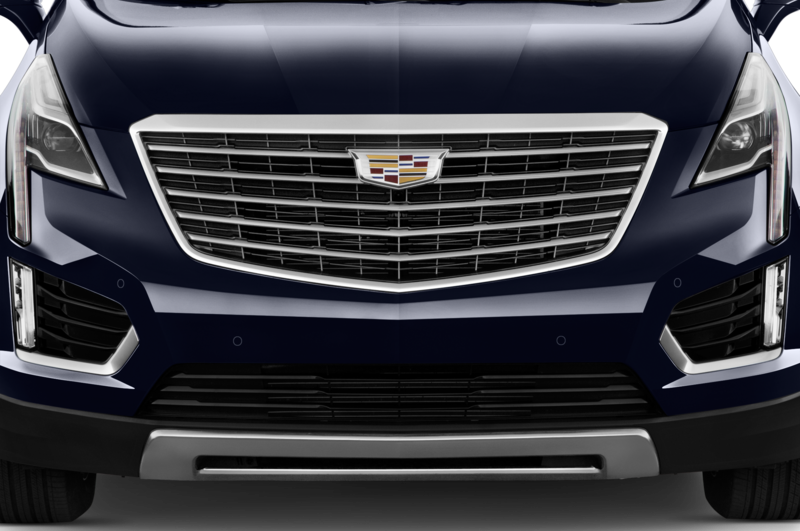 Why not, since everyone else seems pretty pleased to see it, too? 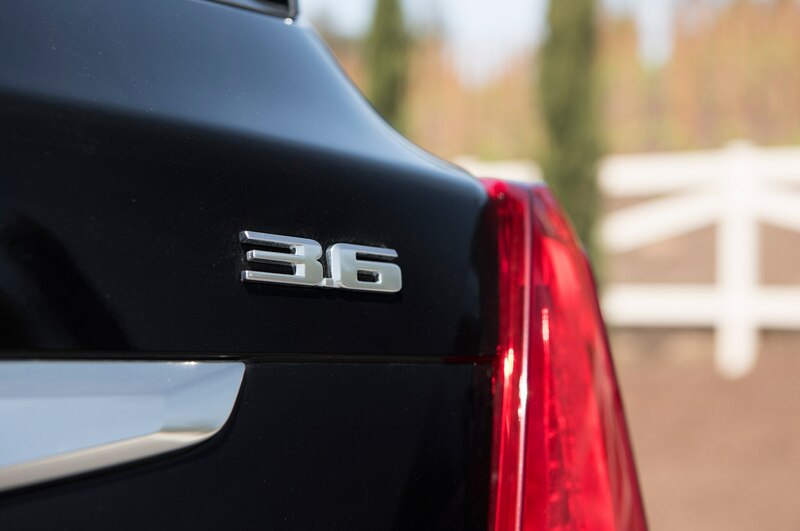 This isn’t the usual German-brand crossover, and you’re not the usual sullen, self-important person that you meet too often at fancy resorts like this. 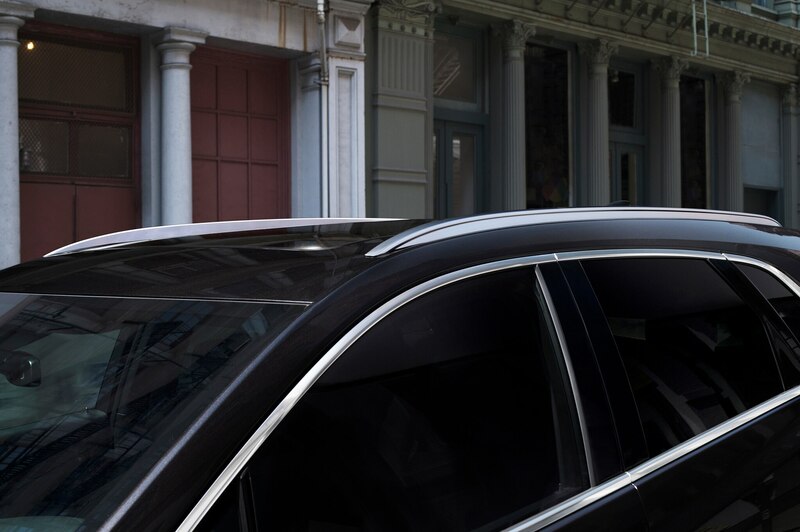 The hotel staff turns toward you expectantly, since you’re clearly a little different from everyone else. 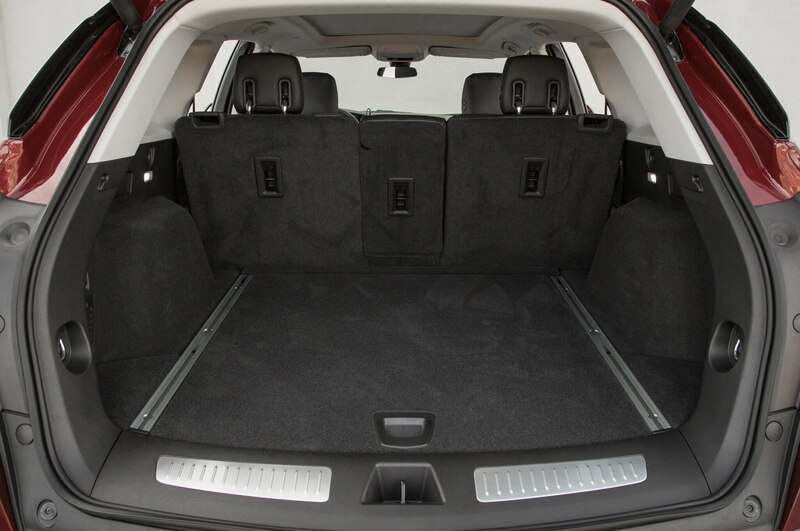 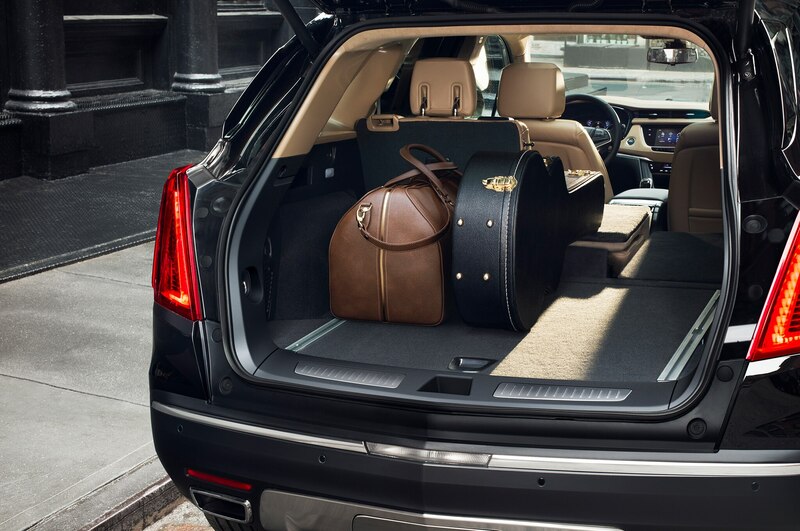 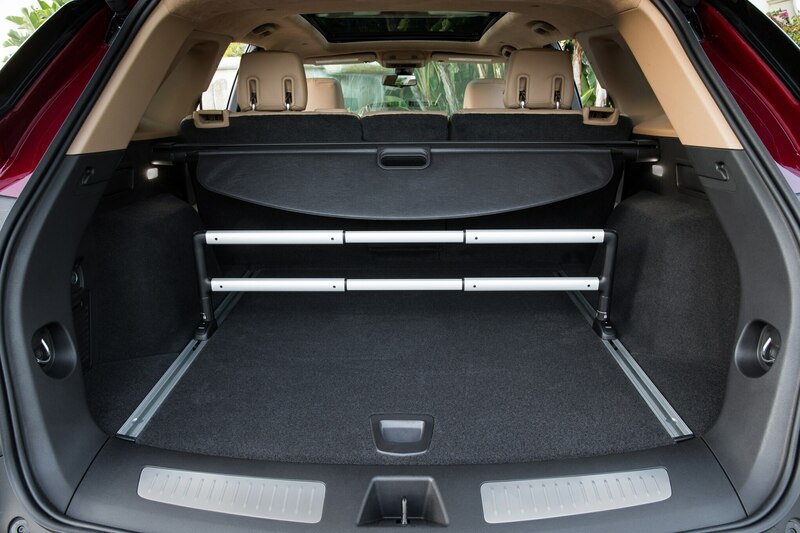 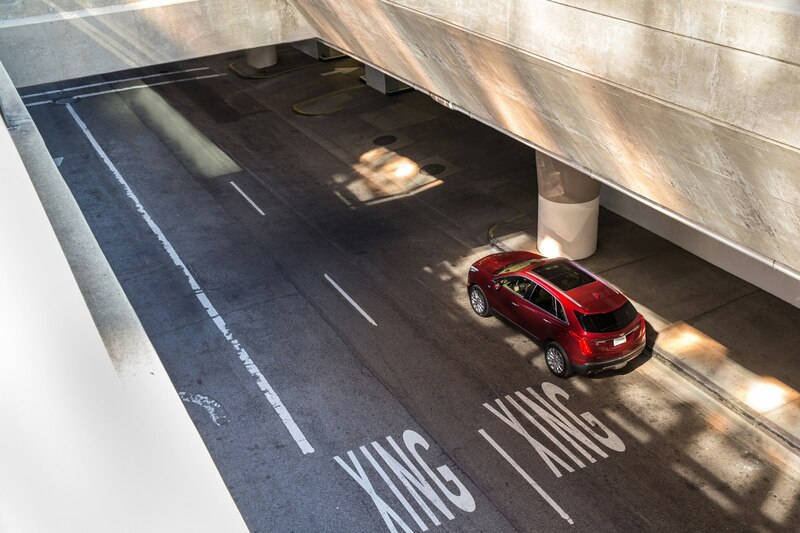 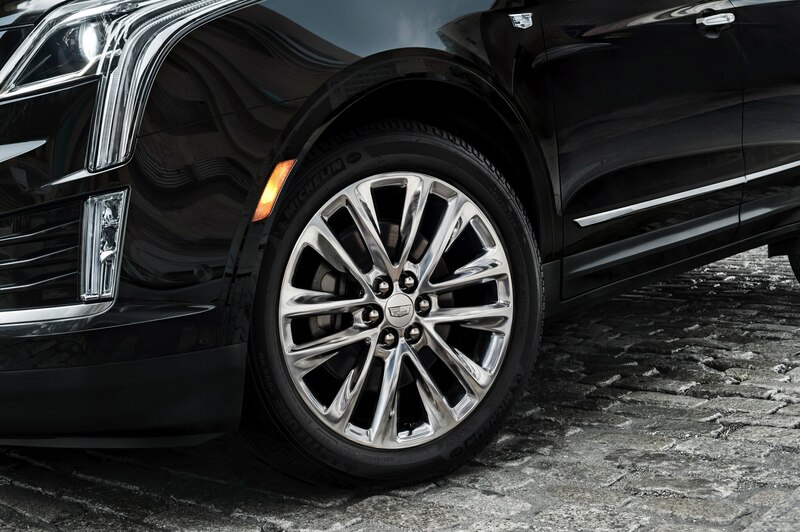 Of course, the other reason the valet and bell staff seem happy to see you is because they know the process of loading up the XT5 with family and bags and vacation stuff will go swiftly and smoothly, and you’ll soon roll out of the way so they can keep things moving on a busy morning. 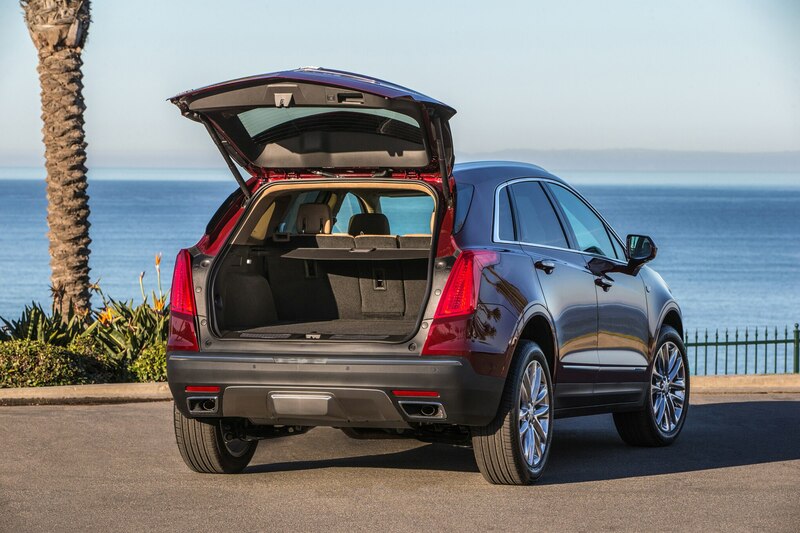 Make no mistake, a crossover’s primary business is to carry stuff, and this Cadillac crossover’s wide doors, useful storage cubbies, 40-20-40-split folding rear seat, and flat cargo floor all make the loading process far less tortuous than what we’re used to, which is usually kind of like packing for the Oregon Trail, only with plastic grocery bags. 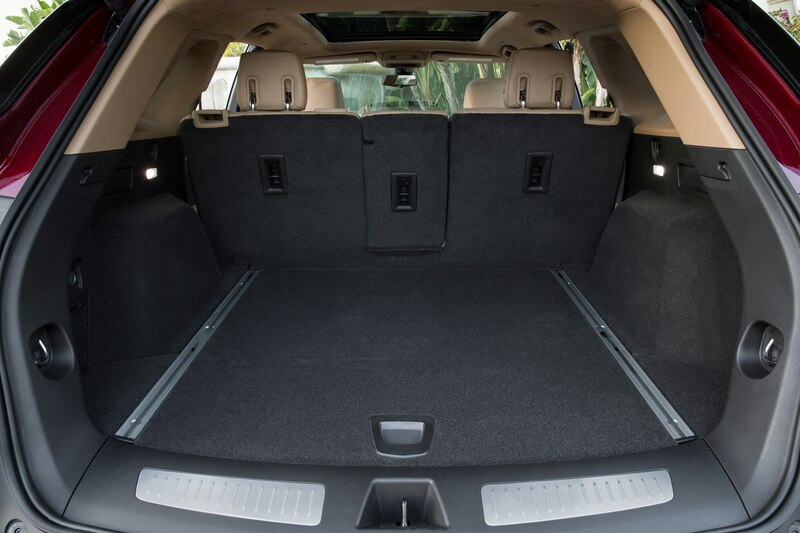 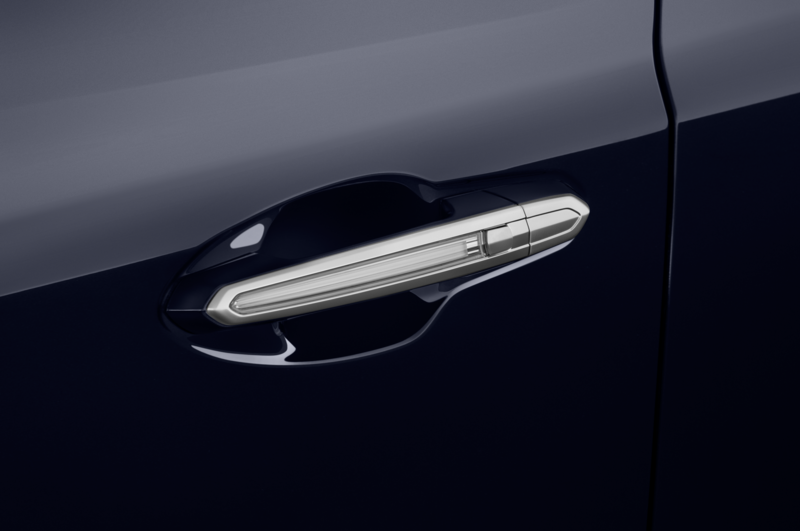 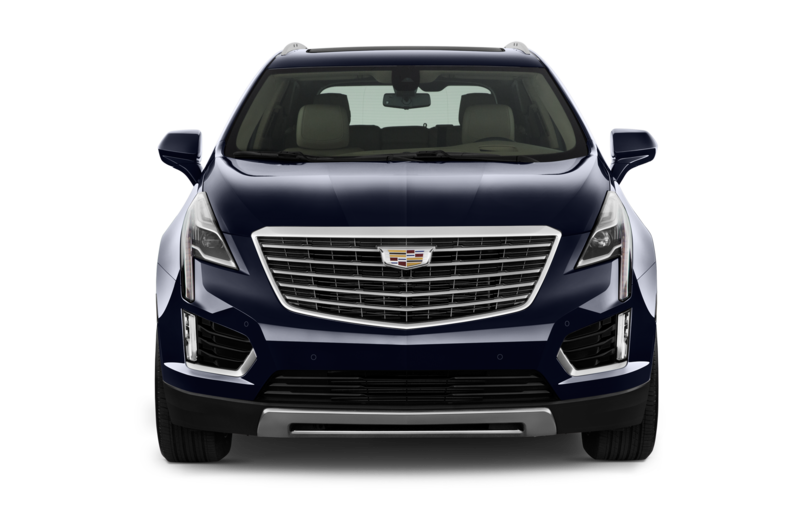 The 2017 Cadillac XT5 occupies the same size space on the ground as the former SRX, only it’s as if the old, frumpy SRX was kidnapped by aliens and this beautiful artifact was left in its place. 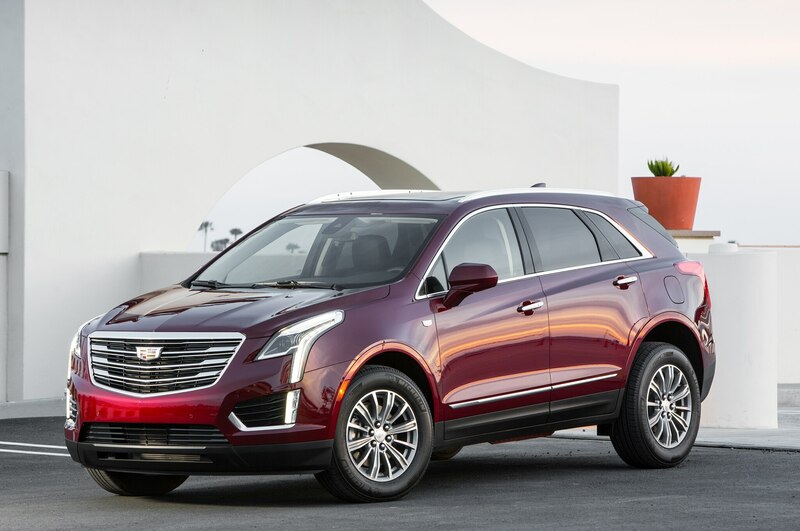 After the all these years since designer Kip Wasenko introduced Cadillac’s Art & Science styling vocabulary with the 1999 Evoq show car, his angular, aggressive look has been softened and refined, and now it gives the XT5 a surprisingly beautiful composure. 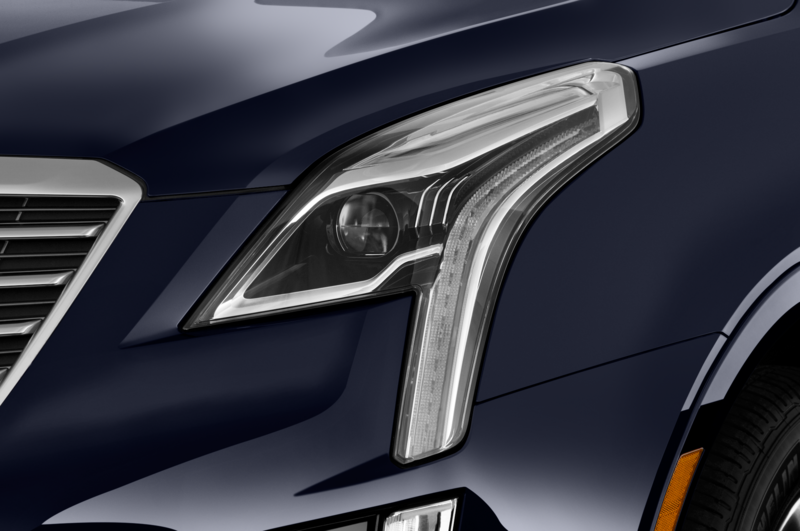 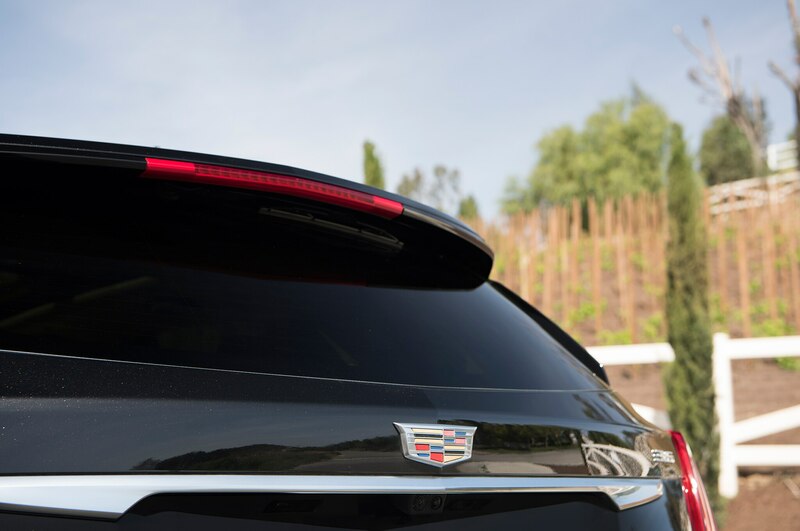 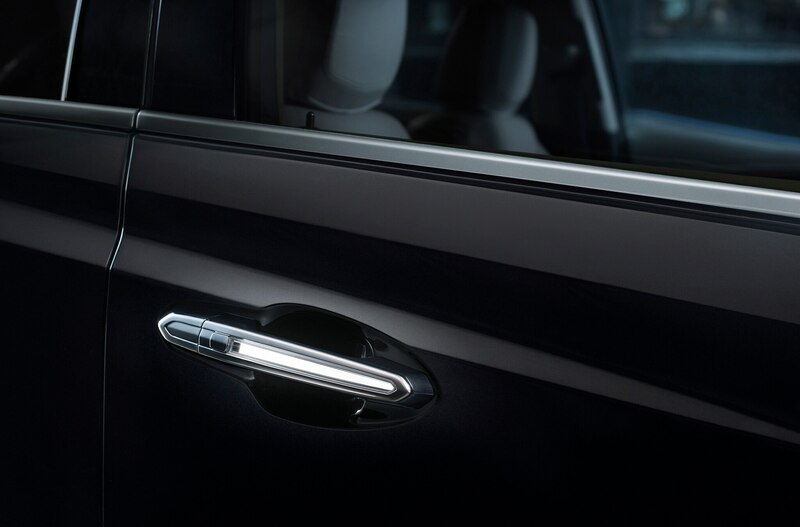 We love the vertical theme for the front fenders, which also allows the array of front lights to stack upright instead of horizontally, and when the sky darkens you’ll find the LED’s nighttime glow makes the XT5 look purposeful instead of mindlessly garish. 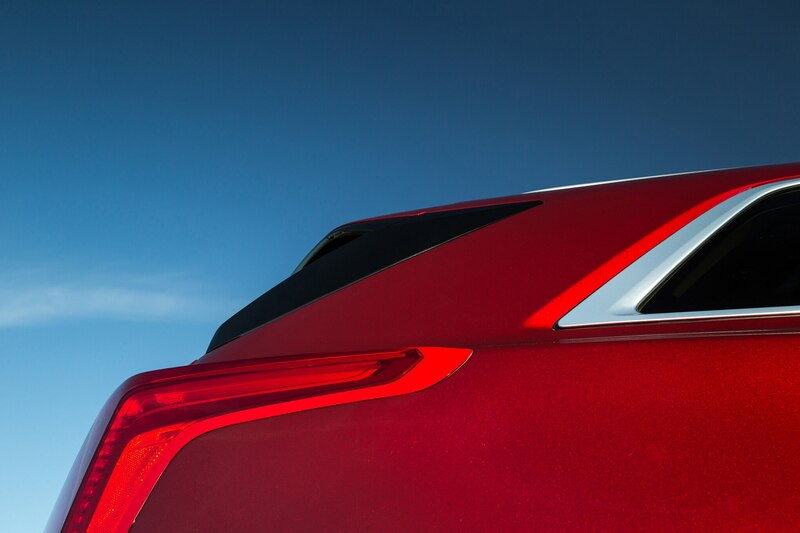 Beneath the sheetmetal, you’ll find a new, lightweight vehicle platform. 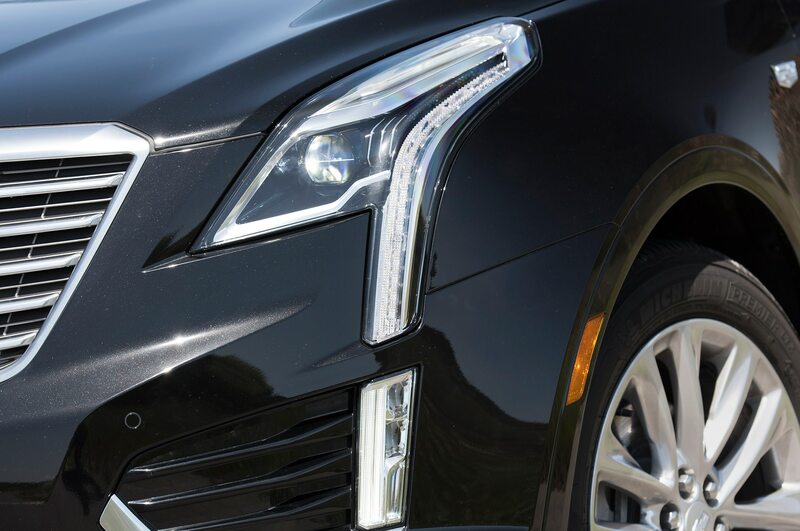 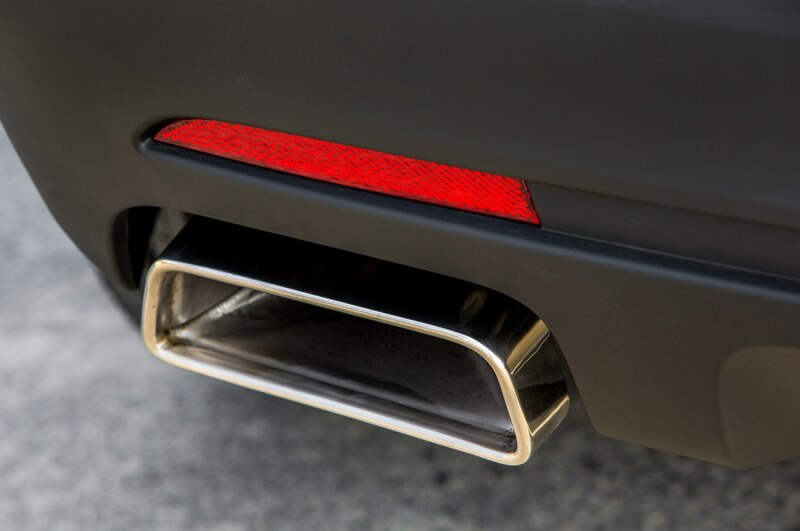 We expected Cadillac engineers to tell us a story about using exotic lightweight materials from distant continents to accomplish this, but with some embarrassment they admitted they just decided to think really, really hard and use computerized analysis instead. 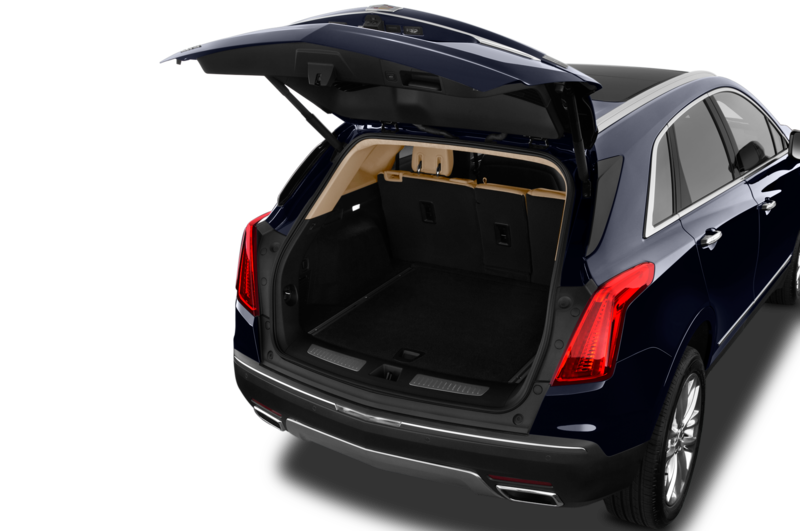 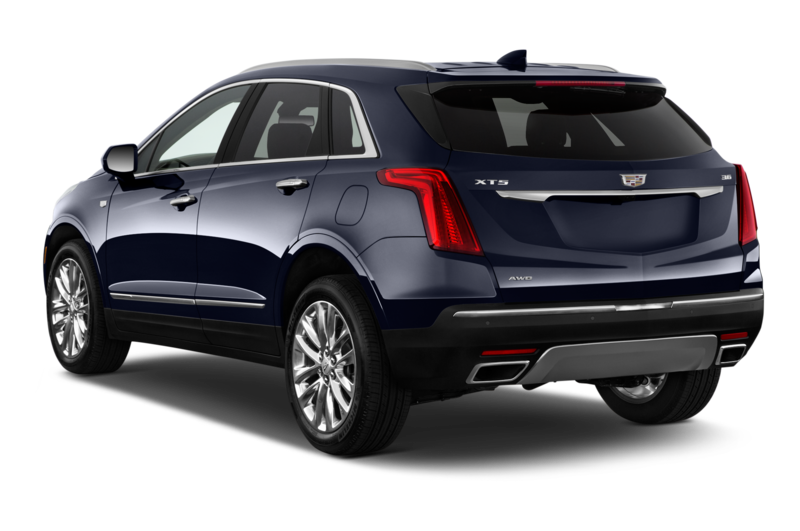 As a result, the XT5 is 185 pounds lighter than the SRX it replaces, and it doesn’t even have to use an expensive aluminum hood to do so. 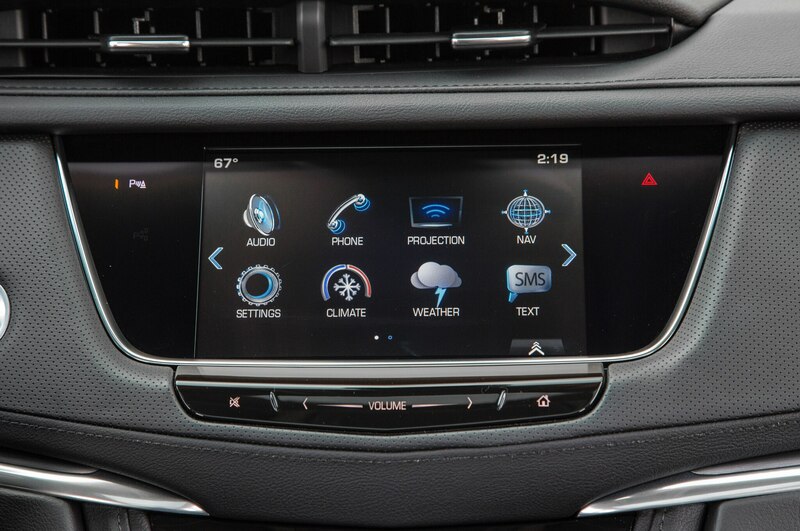 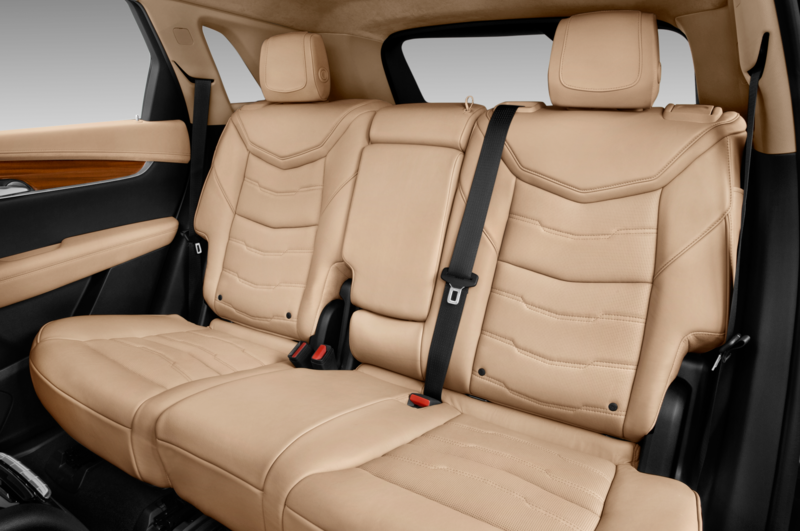 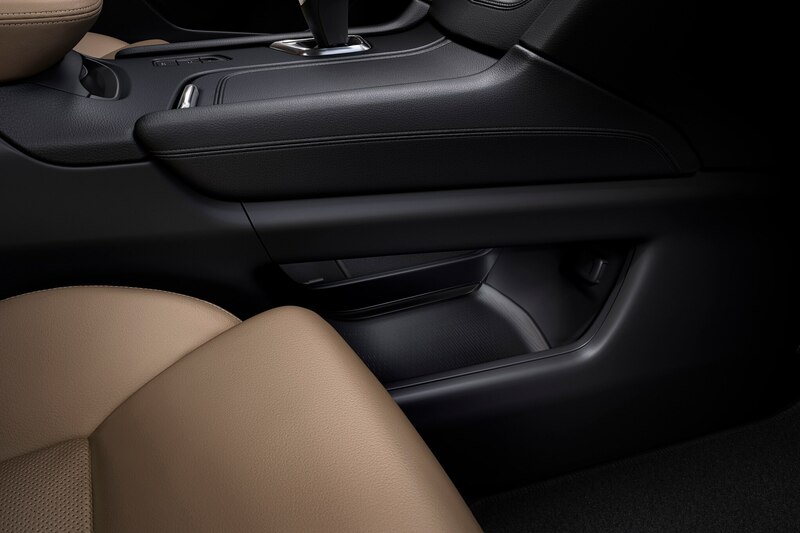 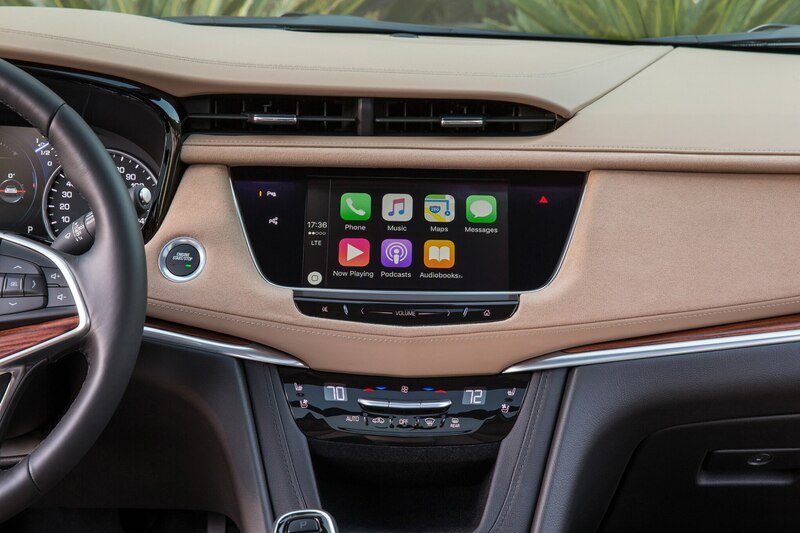 More important for us is the space within this new interior package. 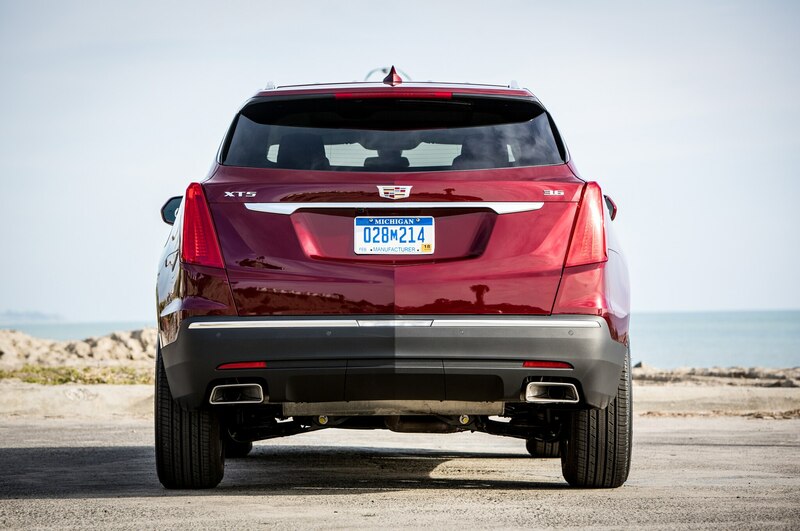 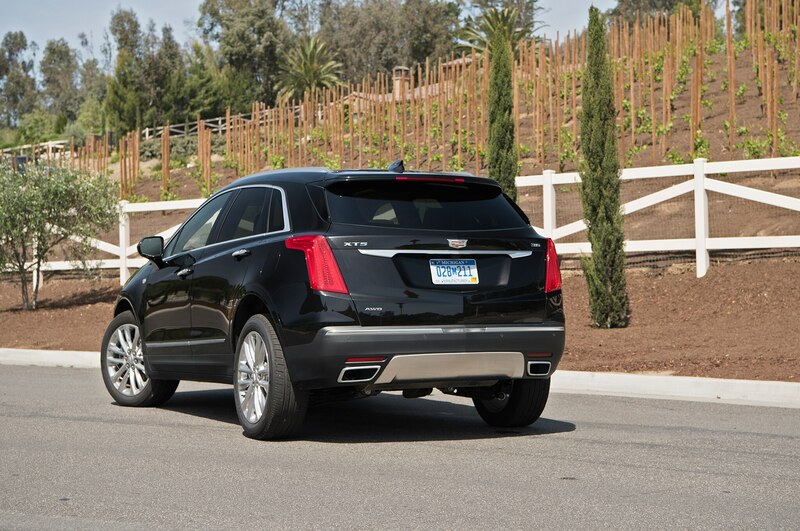 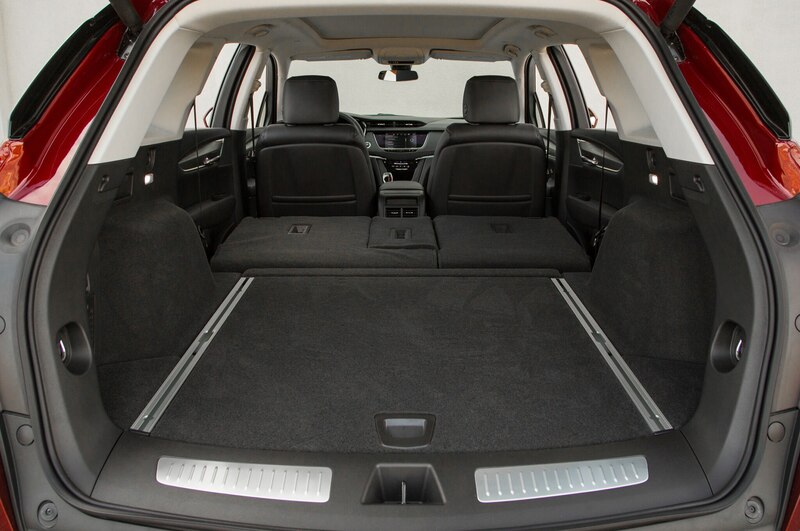 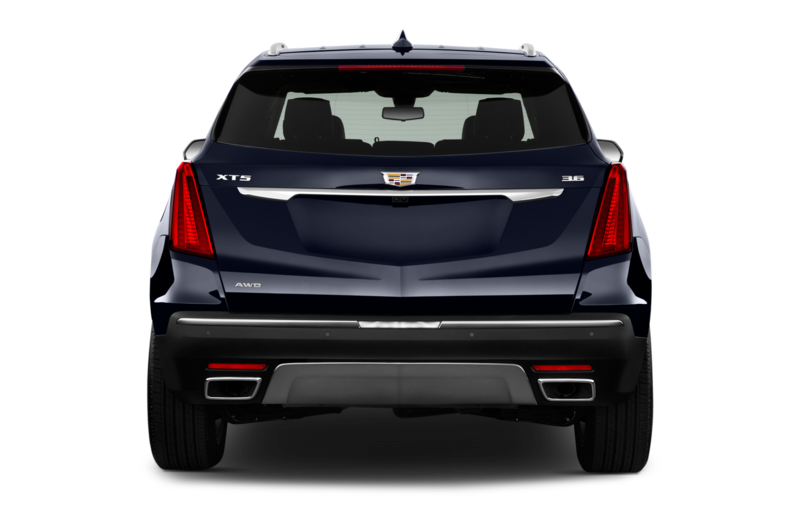 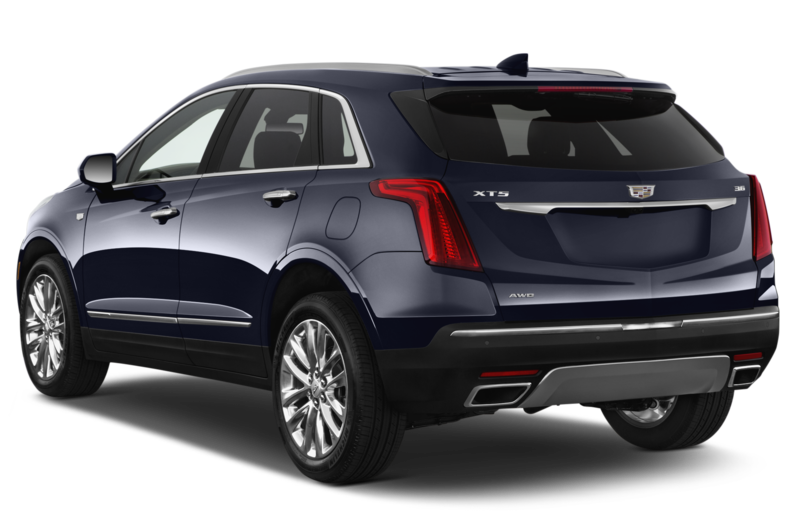 The XT5’s overall length is virtually identical to that of the SRX it replaces, yet the new crossover’s wheelbase is stretched 2.0 inches. 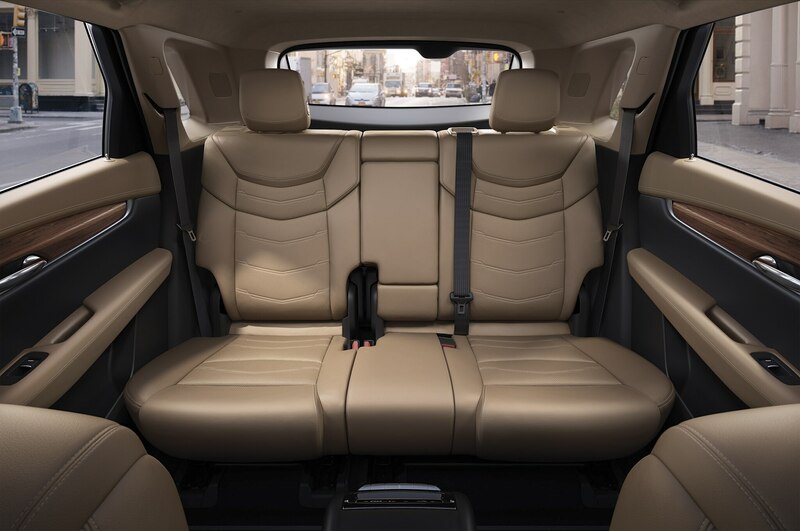 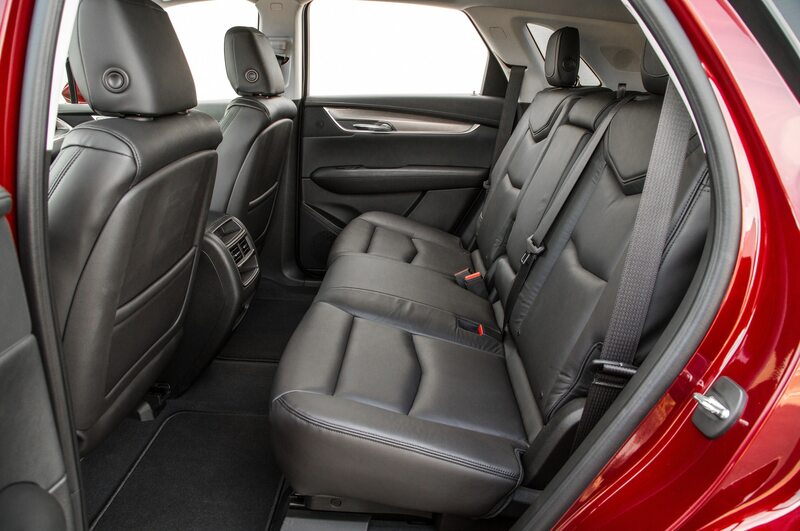 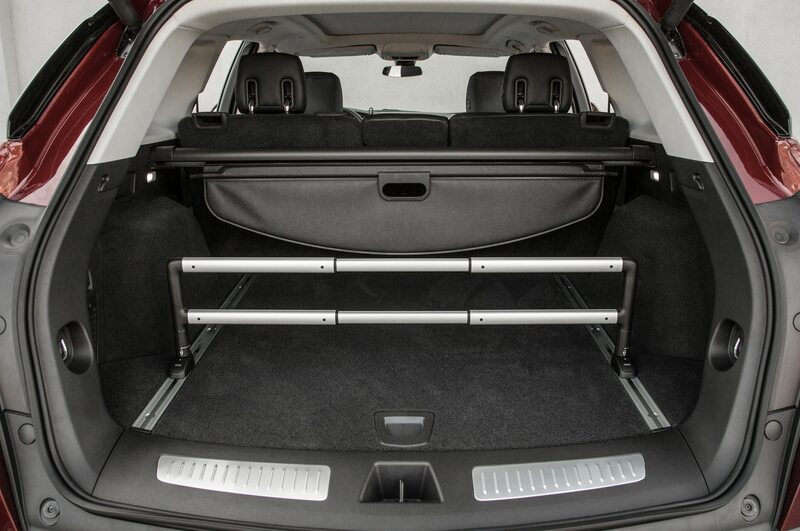 Moreover, all of this stretch is behind the front seats, so it benefits rear-seat passengers with 3.2 inches more legroom. 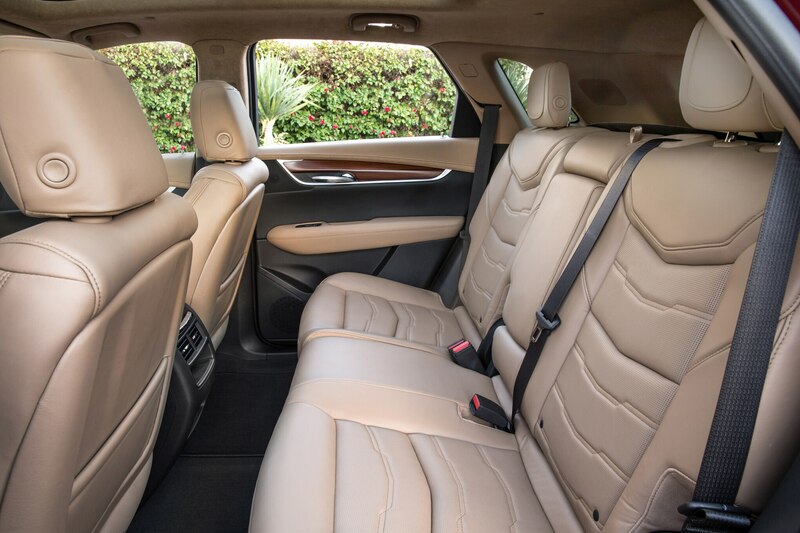 The rear seat also reclines and slides rearward, though not by much, affording better living quarters for the kids, though without dedicated ventilation ducts. 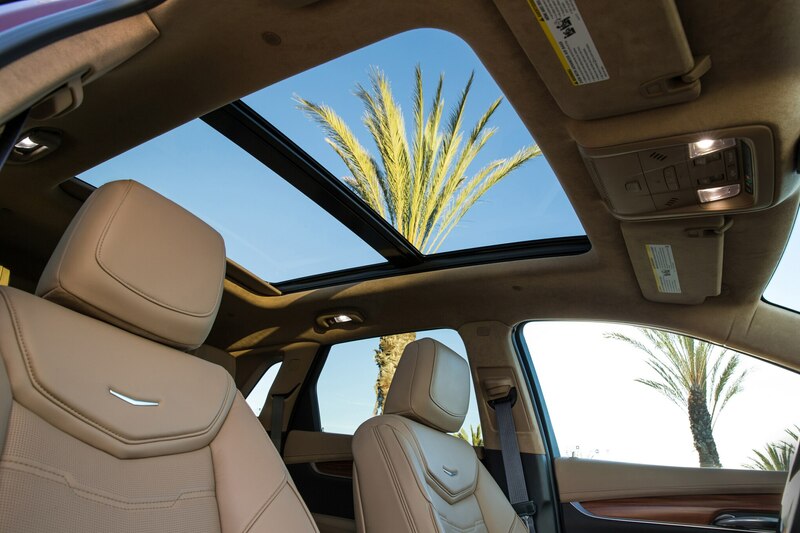 Altogether we’re liking our drive today, even though the view through the glass is not Tuscany but instead the faux Tuscan architecture of Southern California. 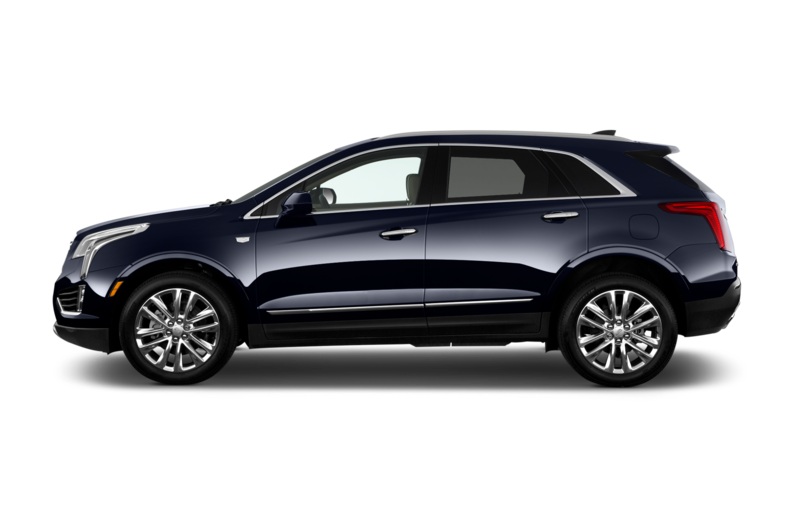 (It’s like a plague, isn’t it?) 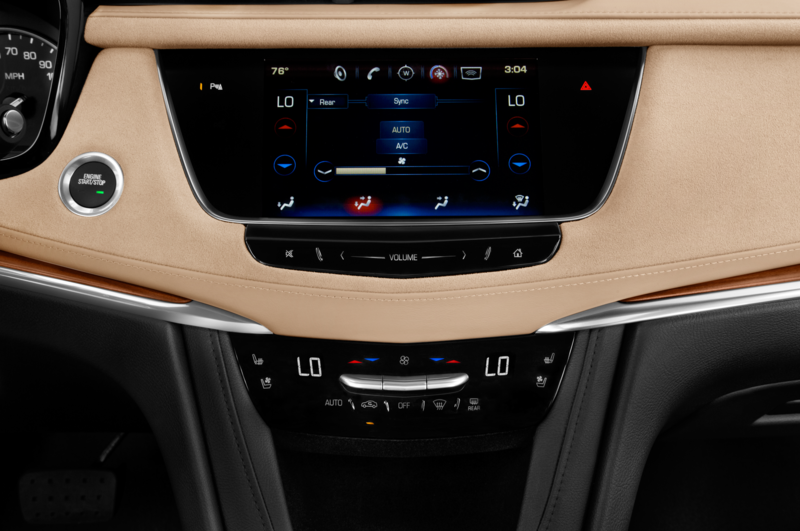 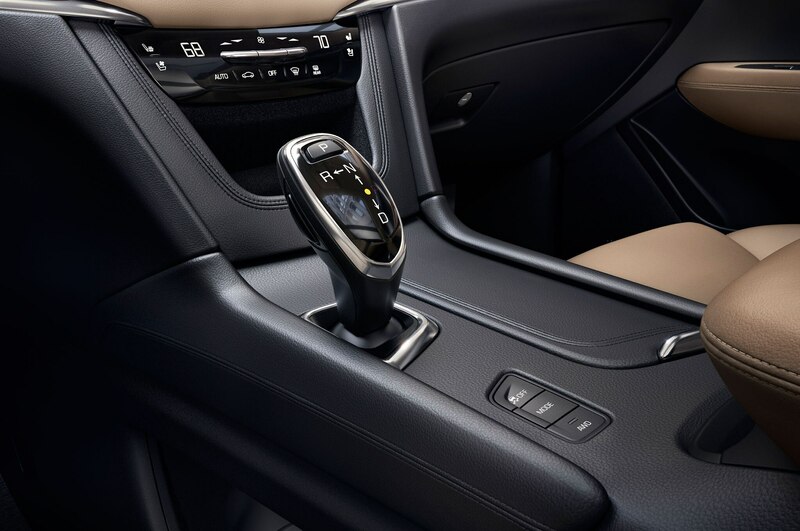 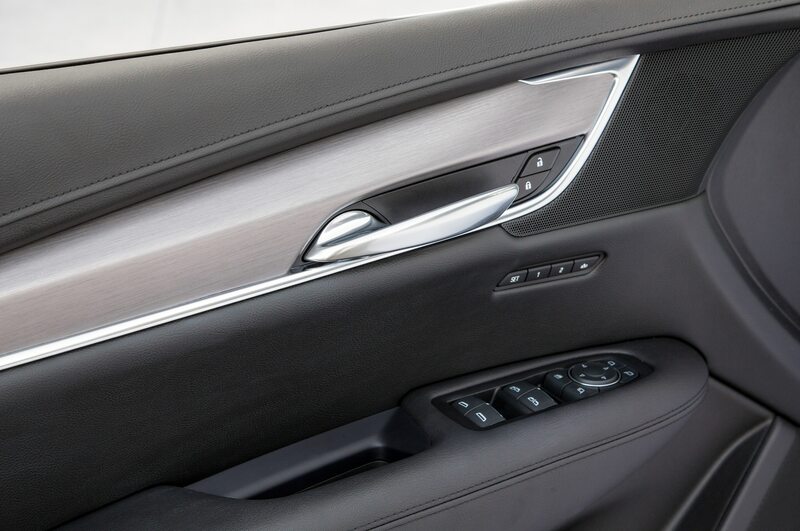 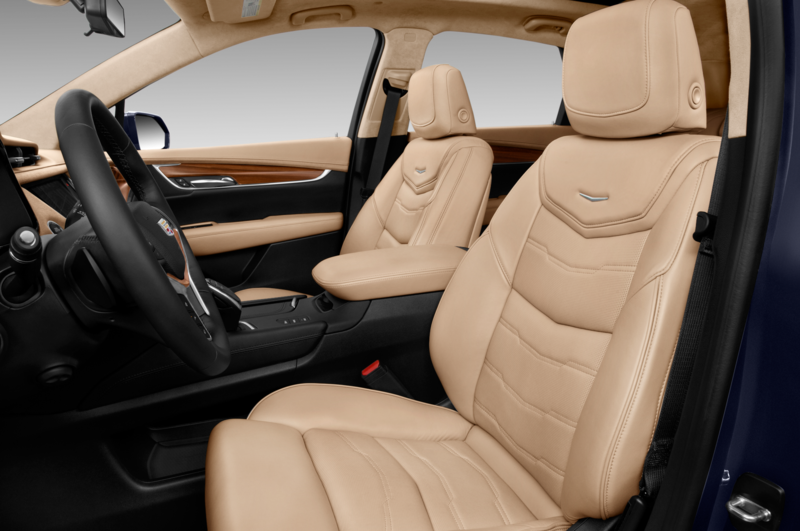 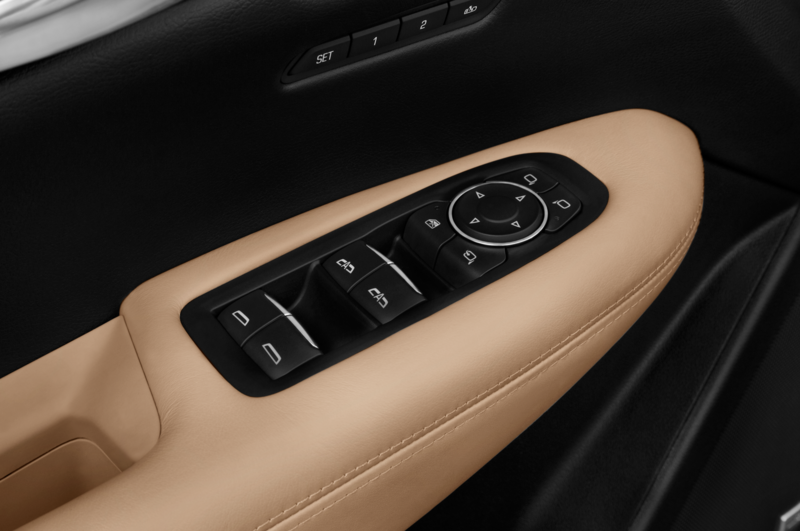 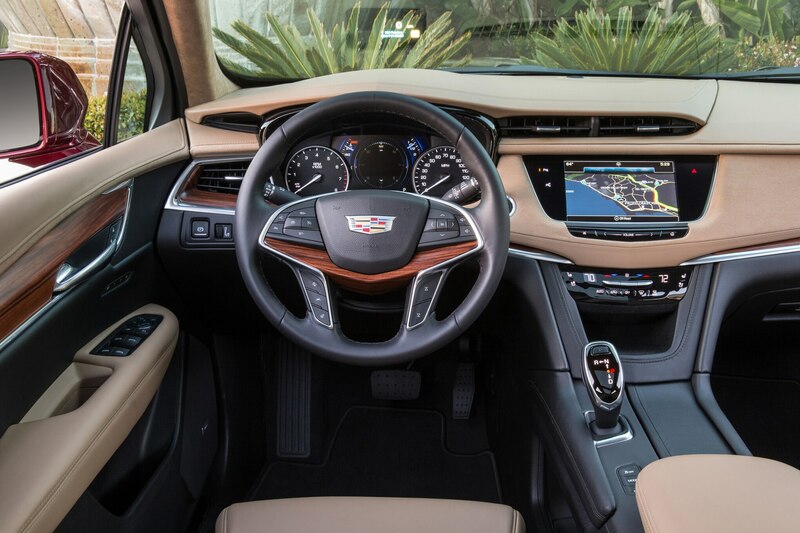 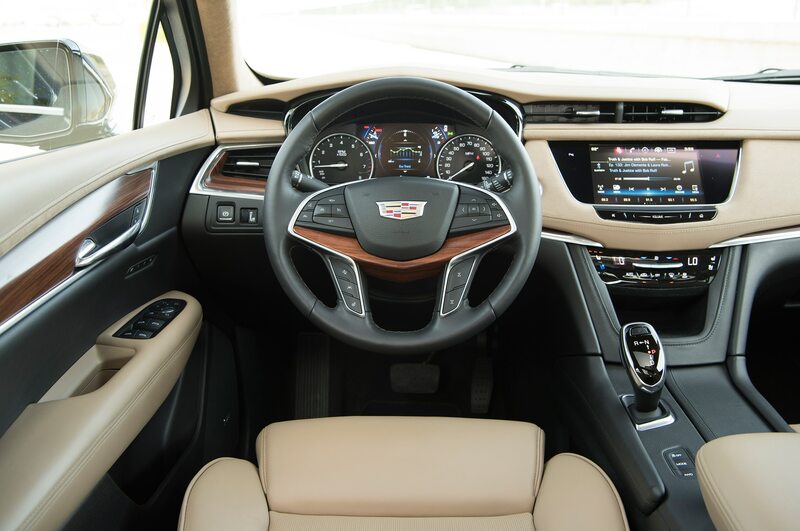 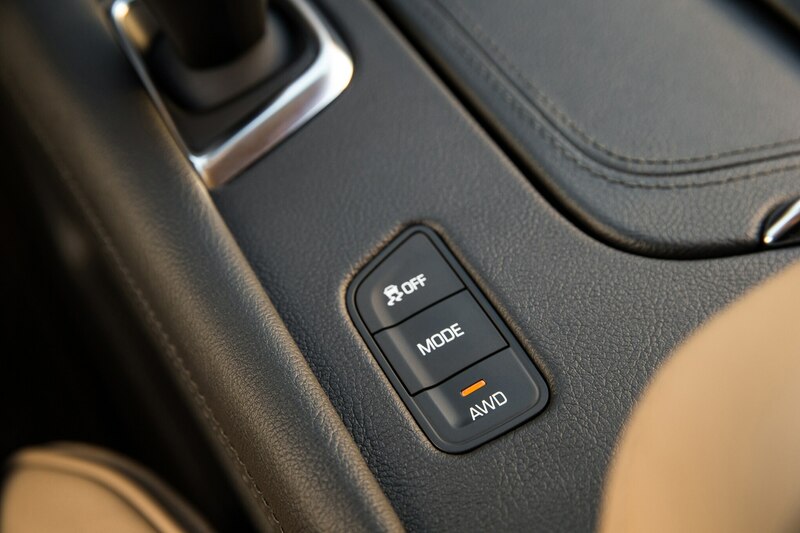 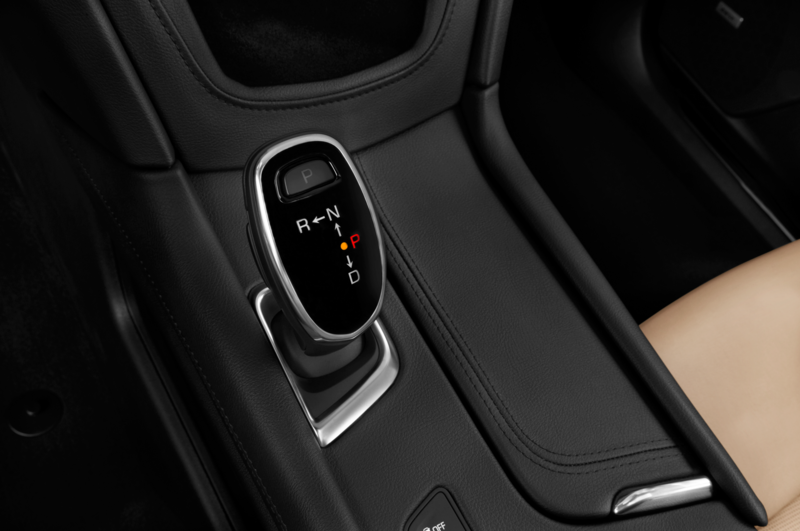 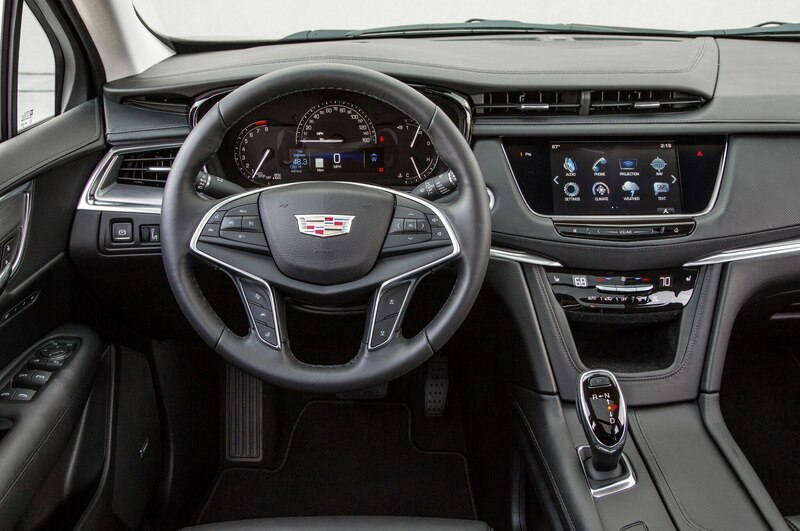 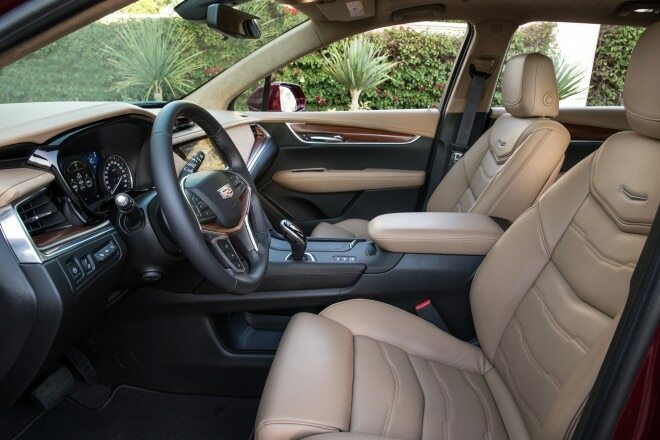 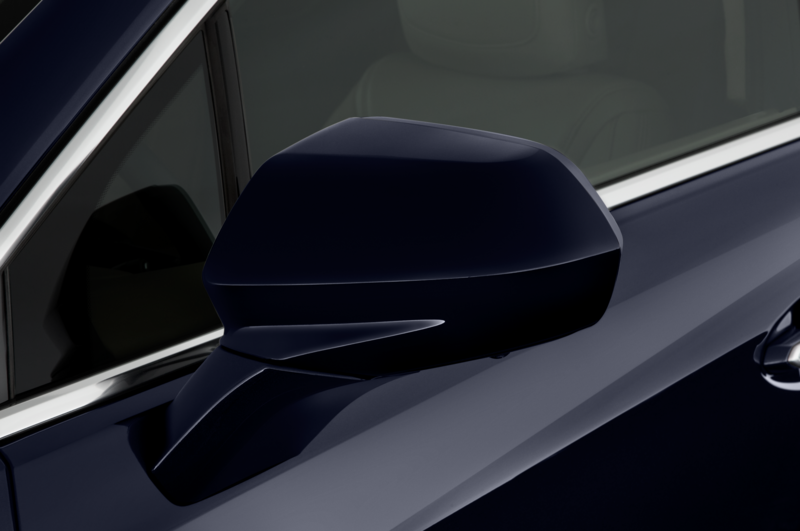 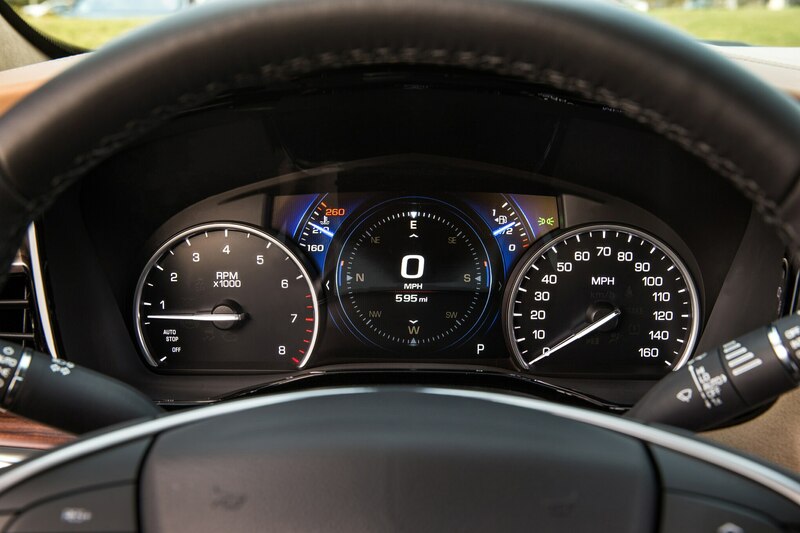 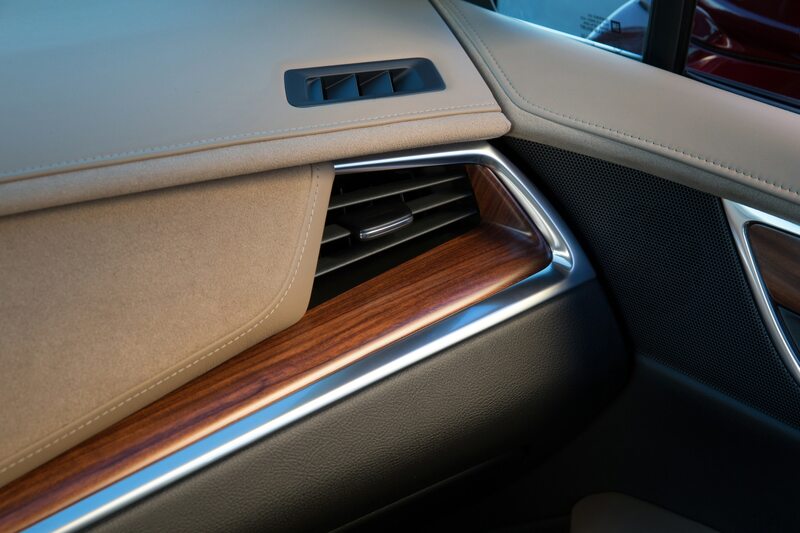 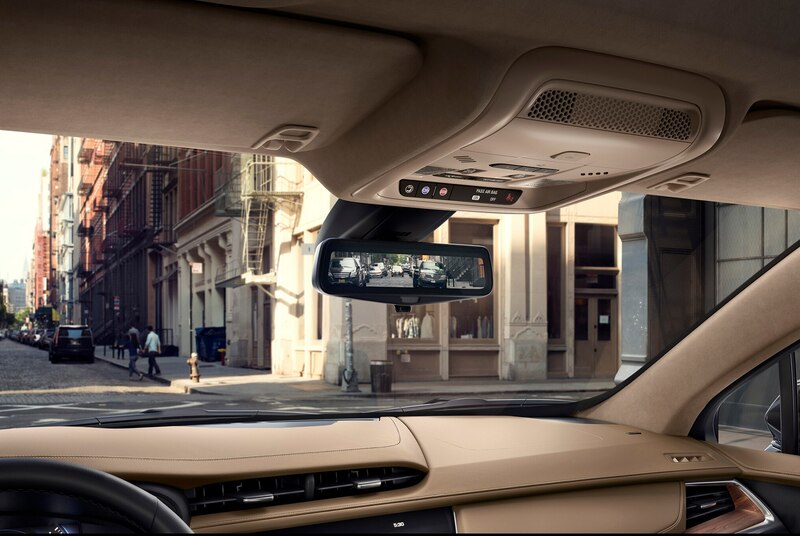 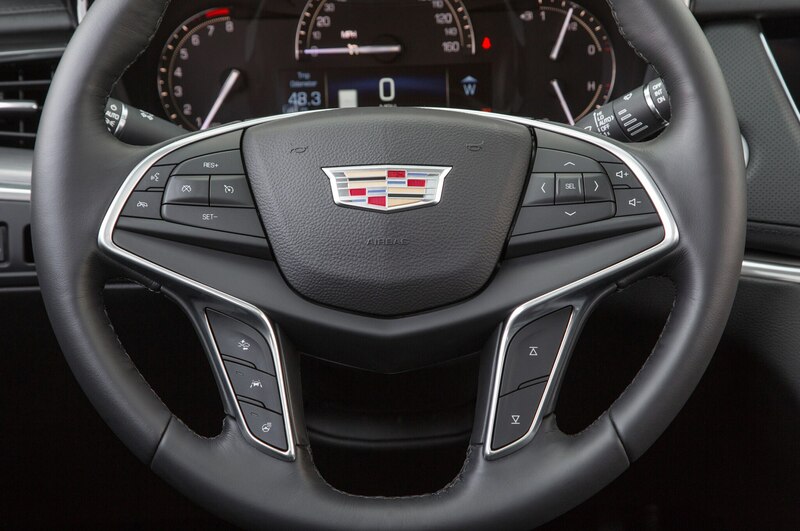 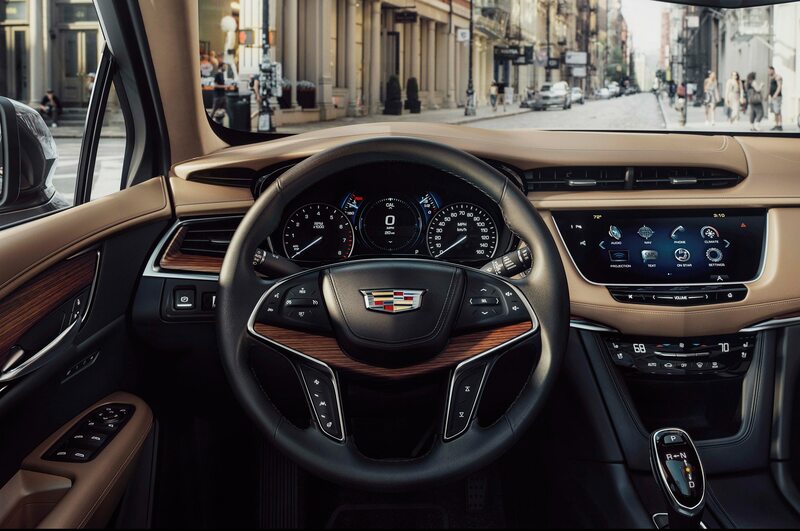 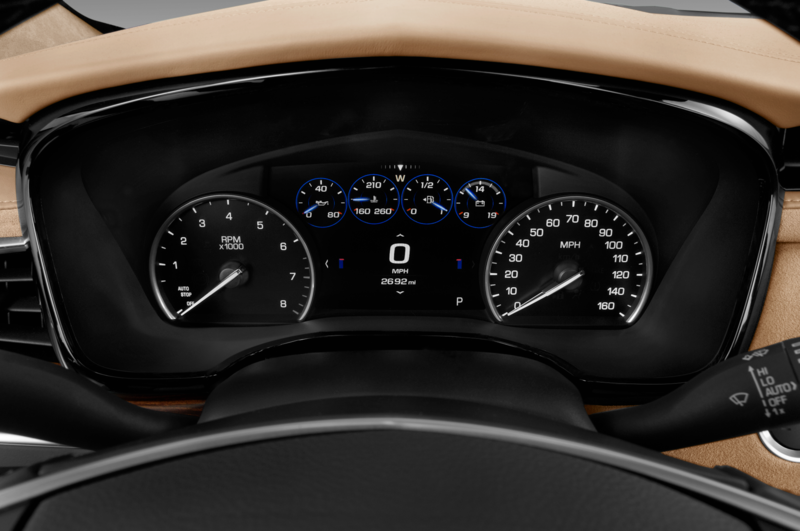 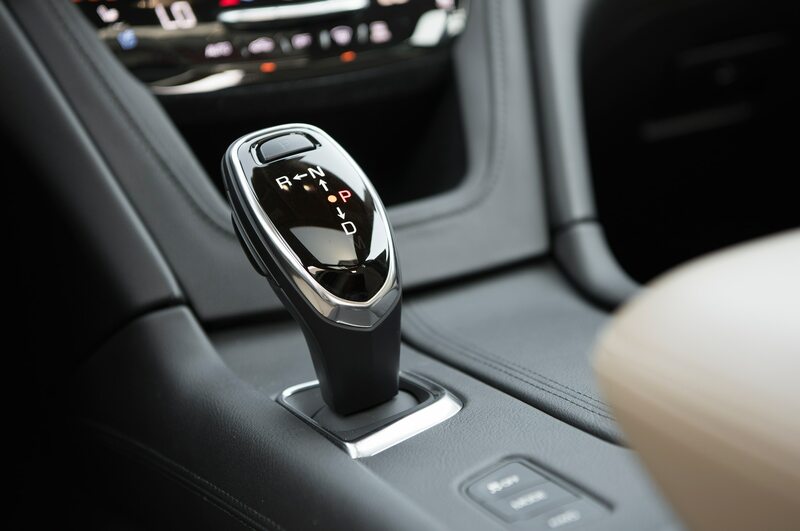 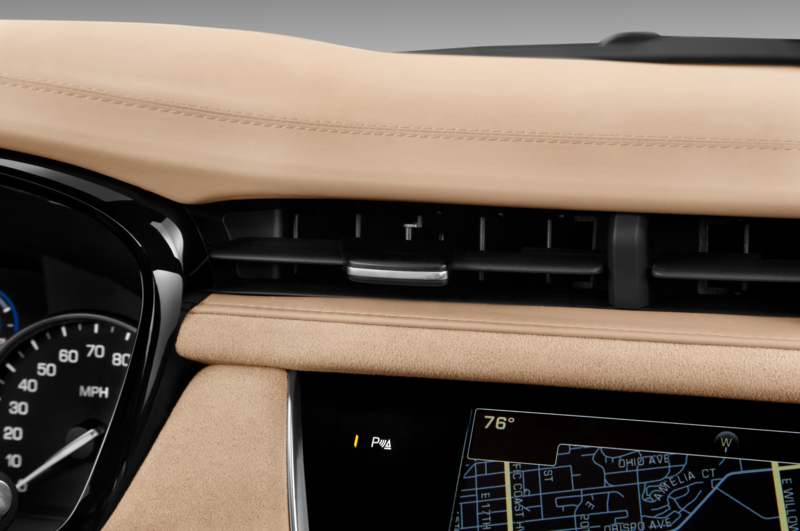 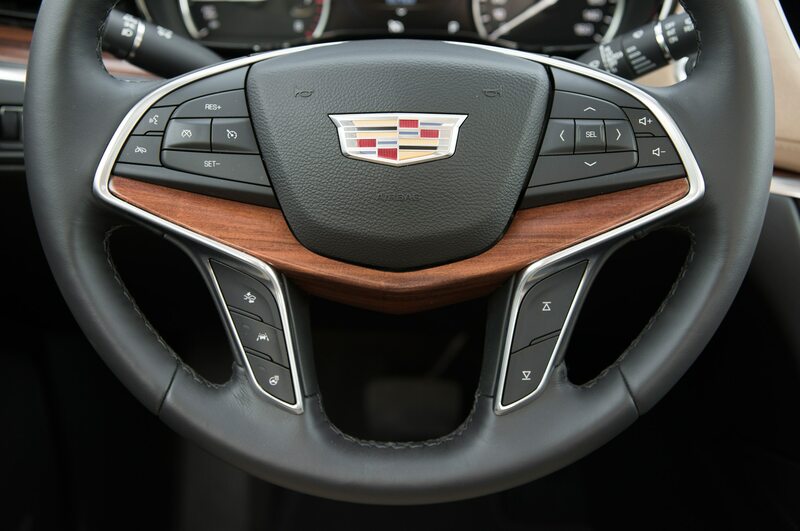 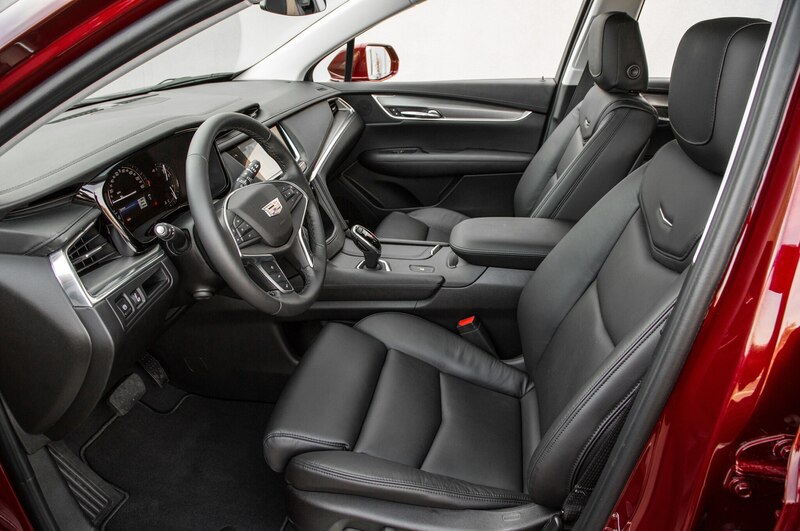 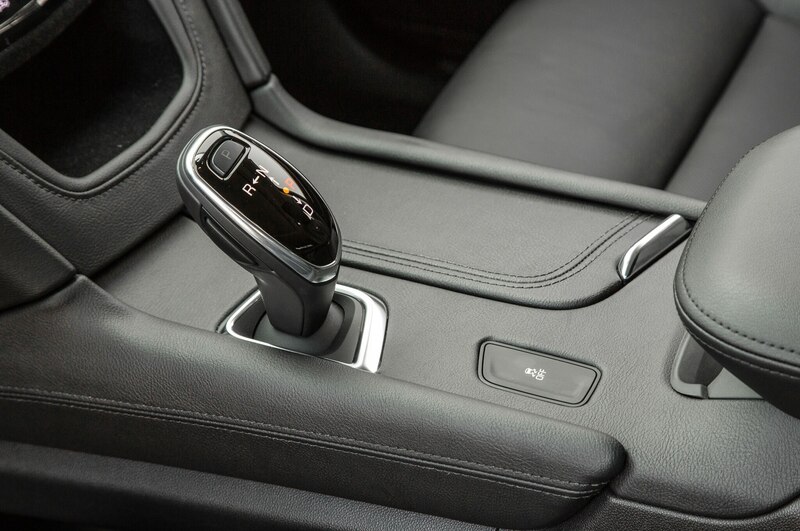 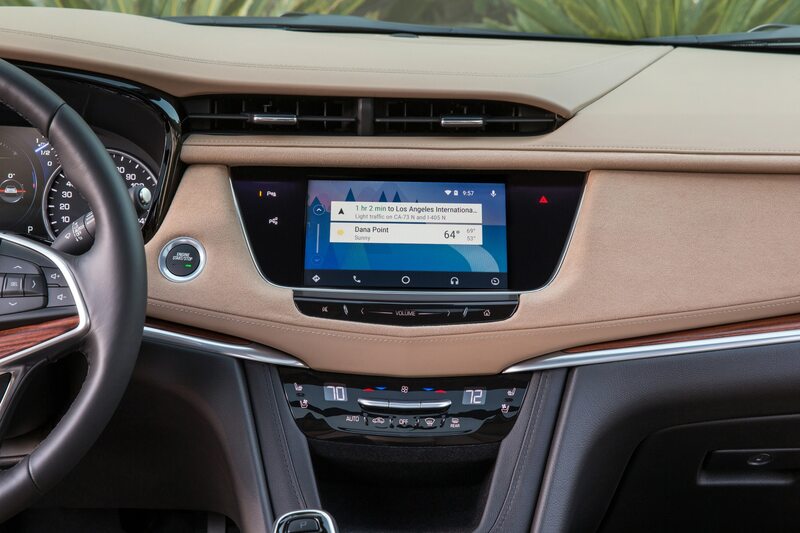 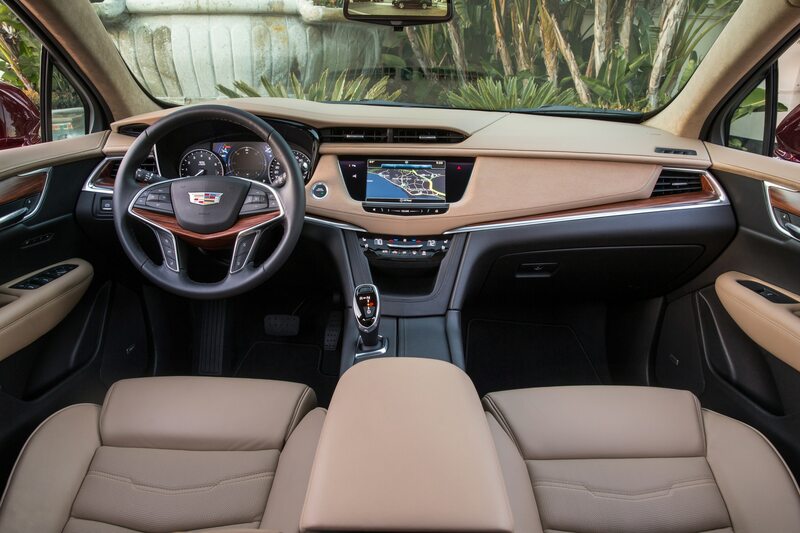 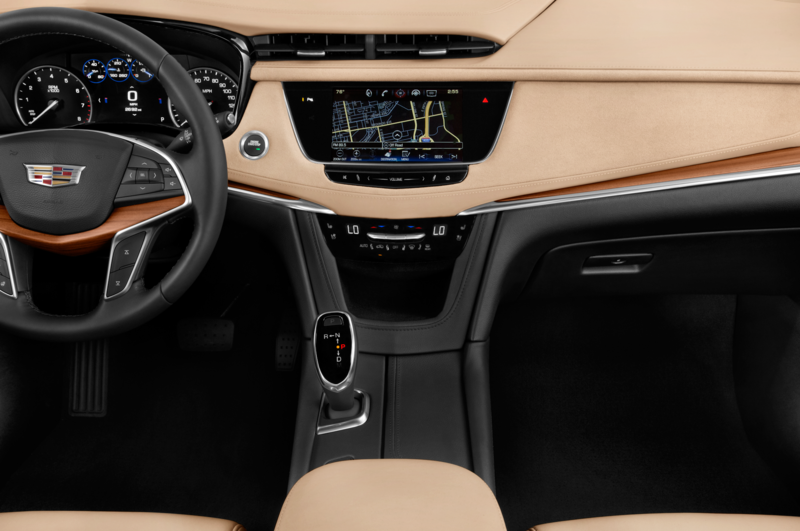 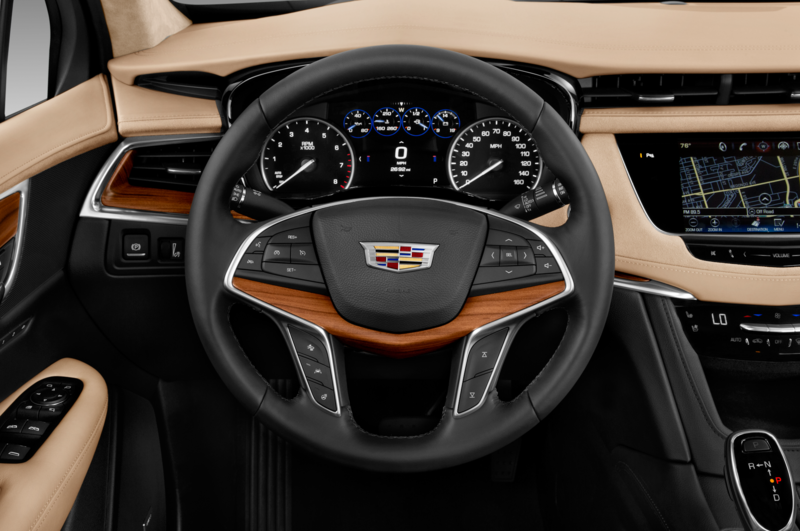 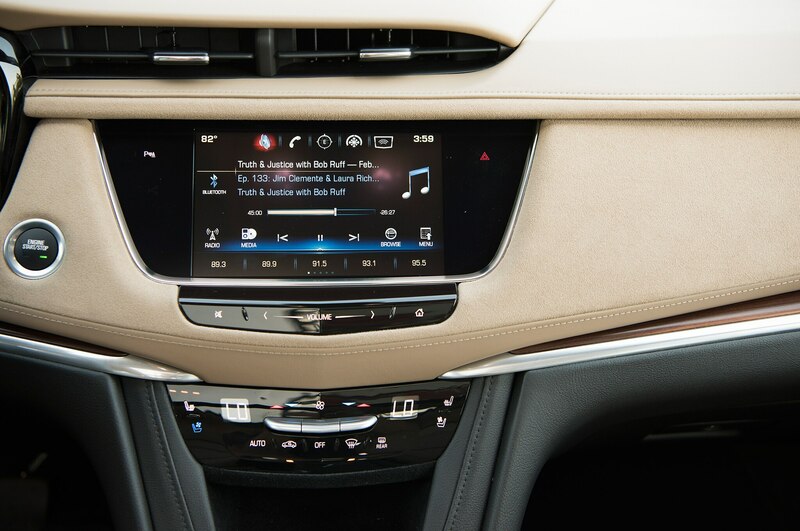 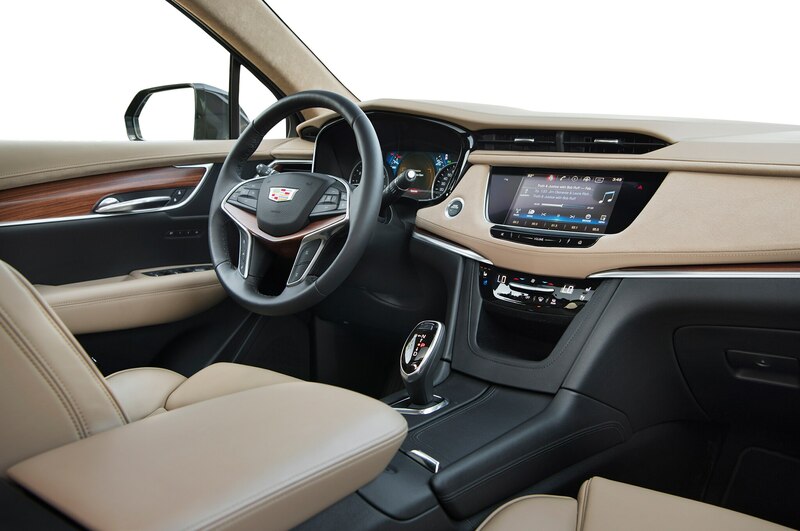 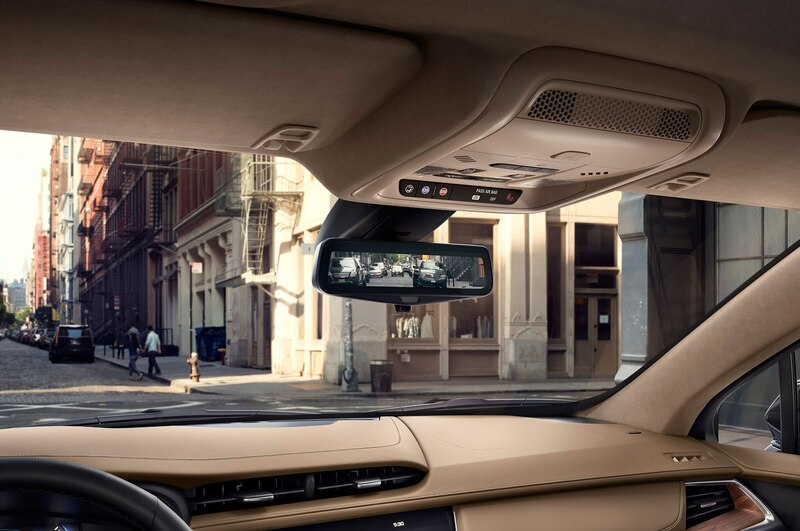 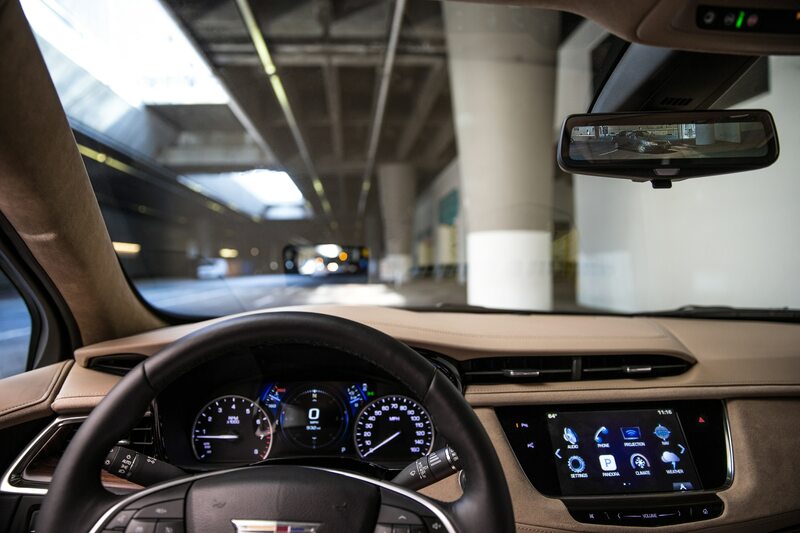 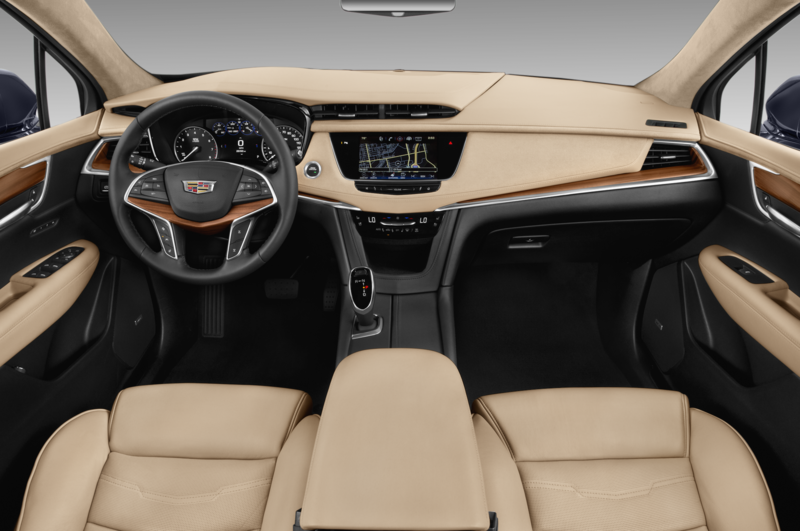 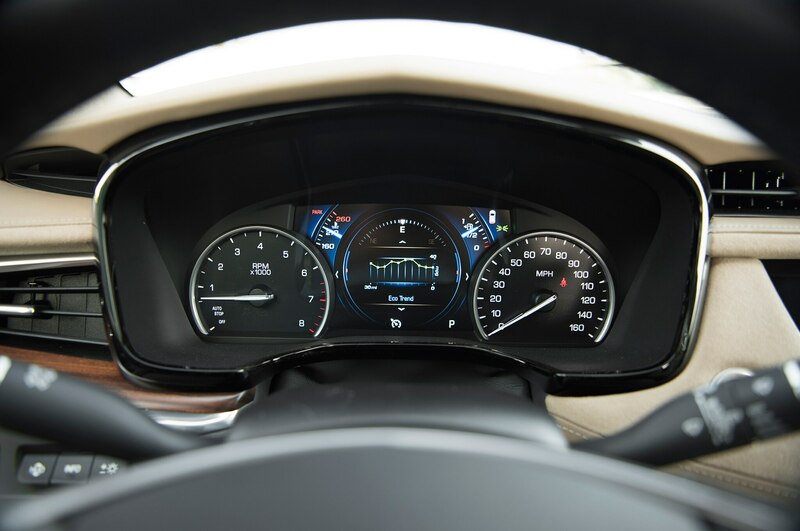 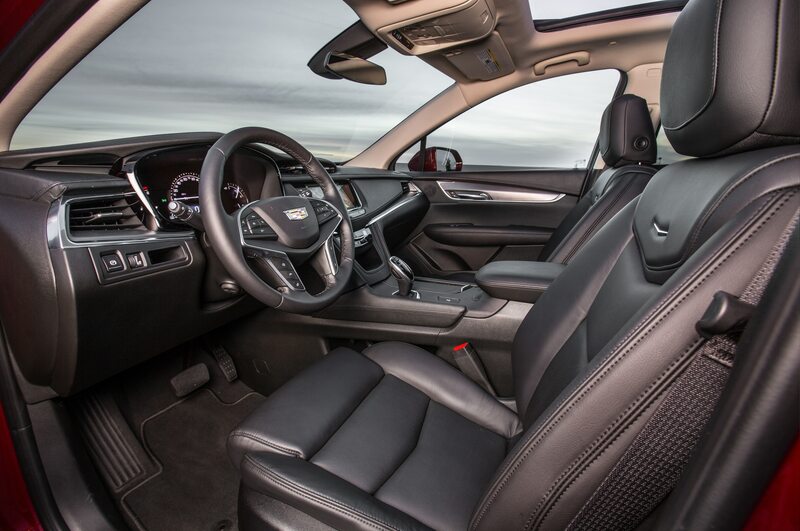 The sweep of horizontal architectural elements across the XT5’s dash is a great relief from the cockpit-style interior of German crossovers, and the Cadillac’s mix of real cut-and-sewn leather upholstery, real aluminum flourishes, and real wood is impressive. 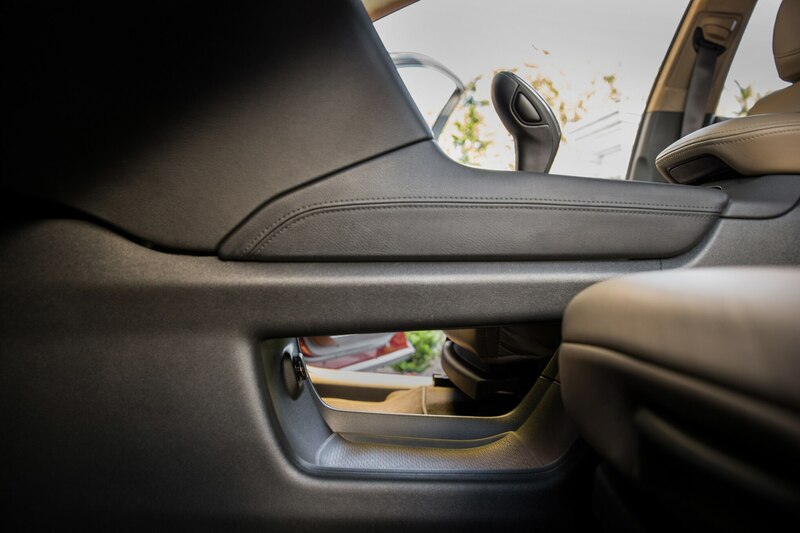 The front seats are meant to be sporty rather than squishy, but we wonder if they are large enough for a good number of potential drivers. 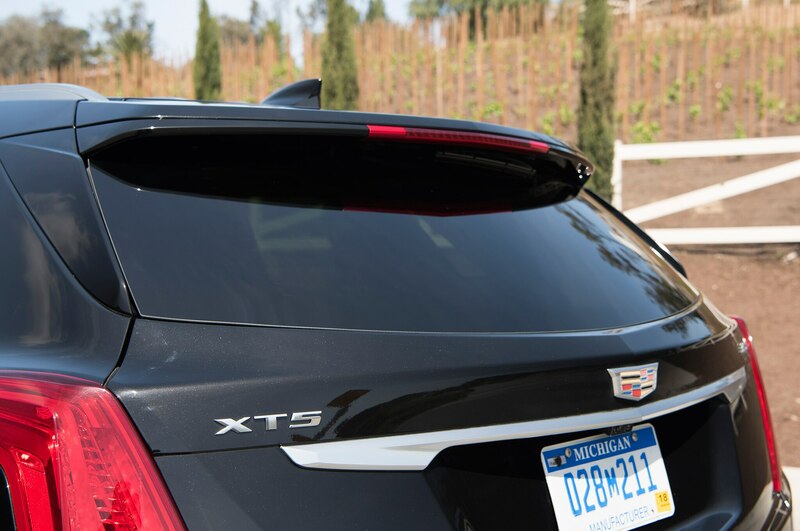 Finally we find ourselves beyond the city limits, heading for the little town of Julian on top of the mountains far above San Diego. 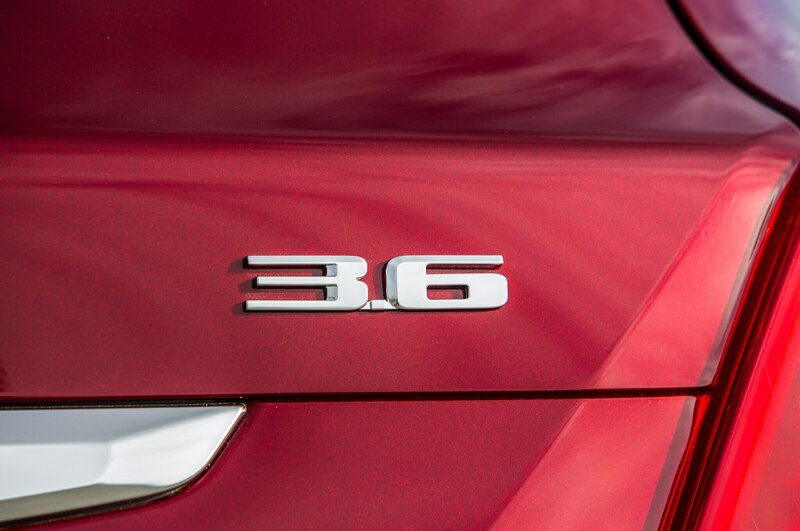 If we were in a German crossover, probably it would be one of the coupe-style ones, such as the BMW X6 or Mercedes-Benz GLE350. 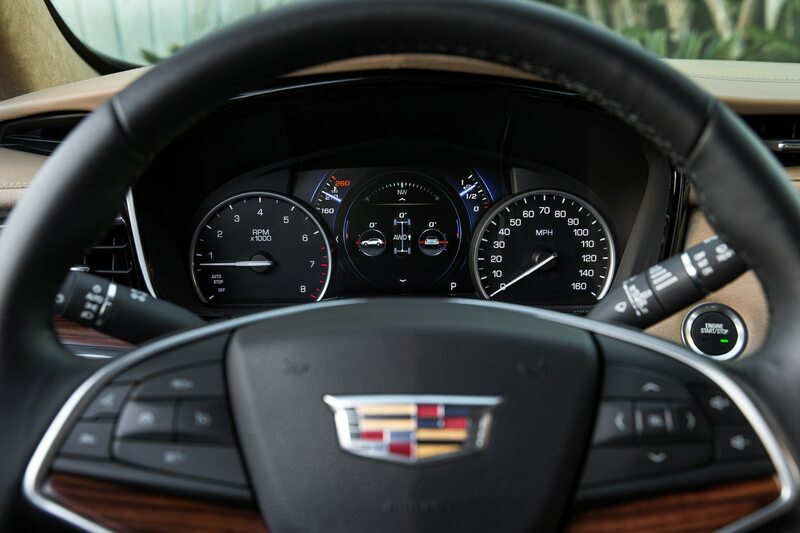 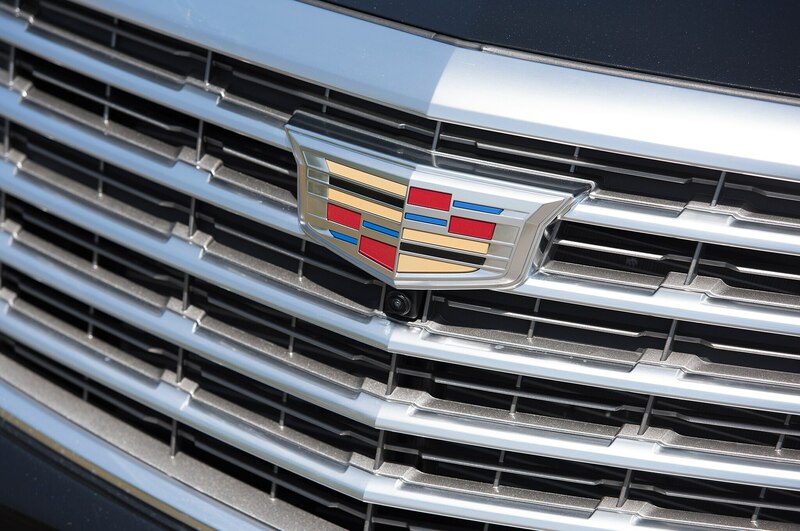 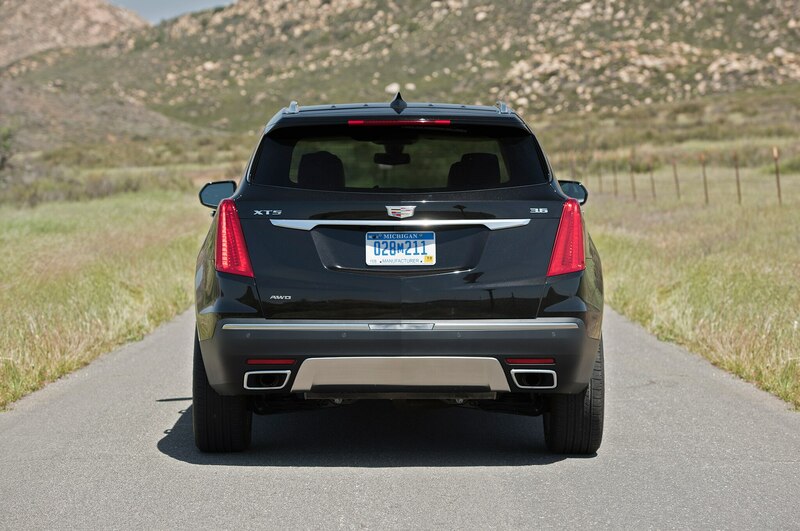 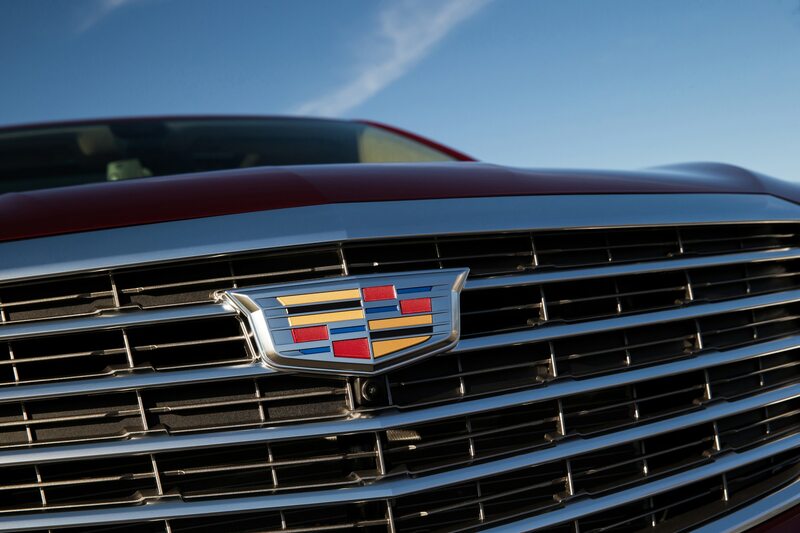 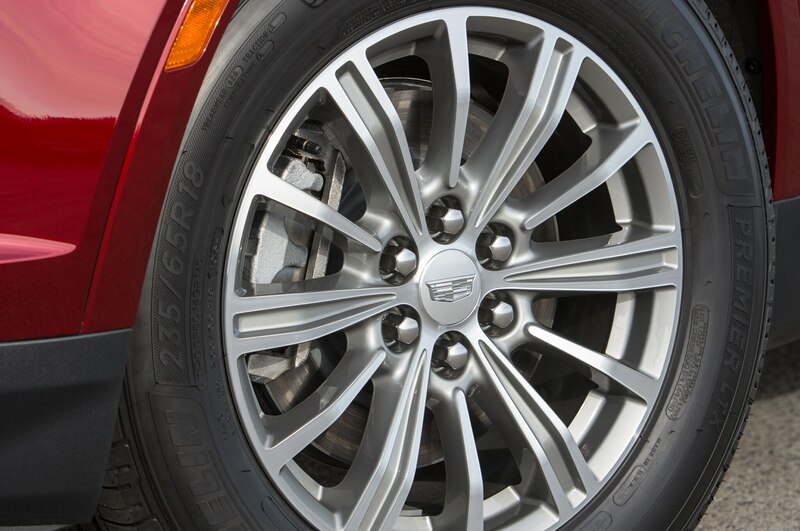 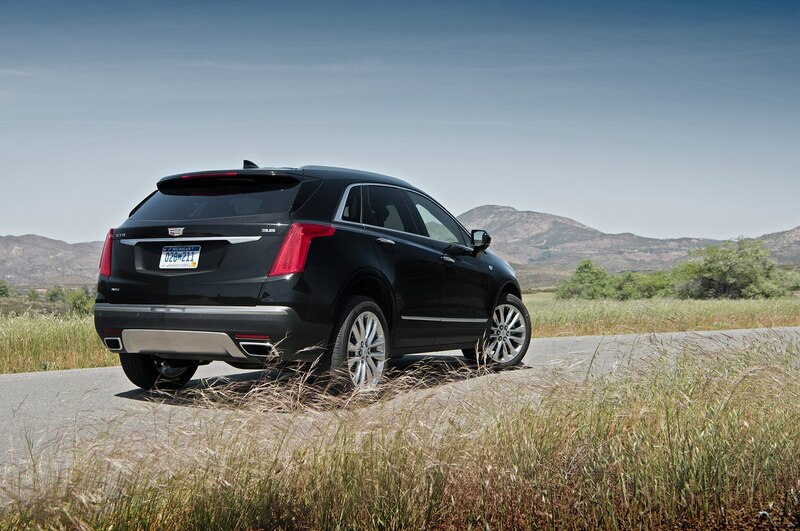 Yet the Cadillac already seems to drive with coupe-style speed and enthusiasm. 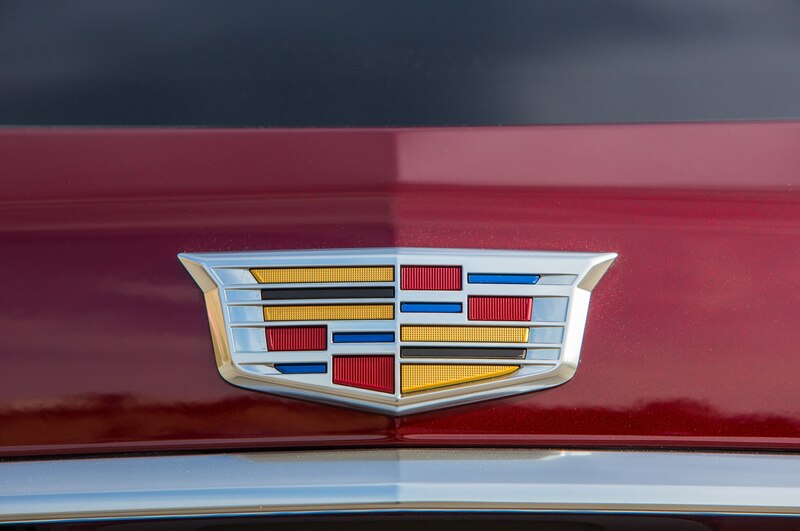 For this, we have to thank two things. 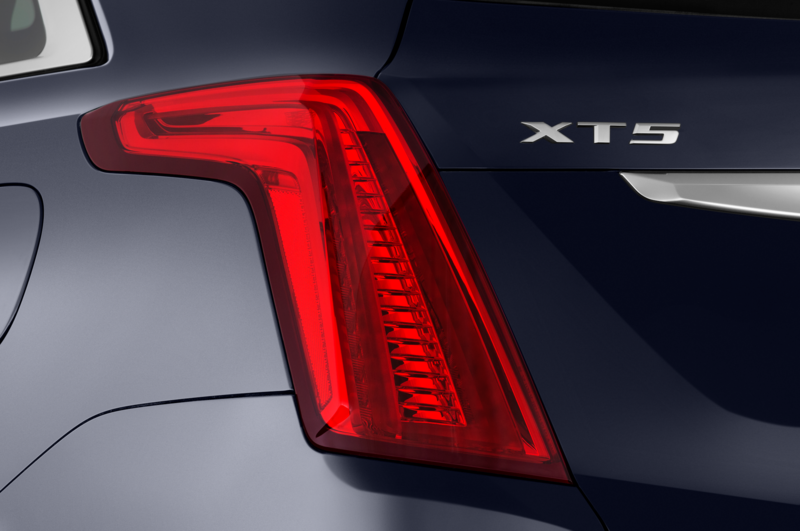 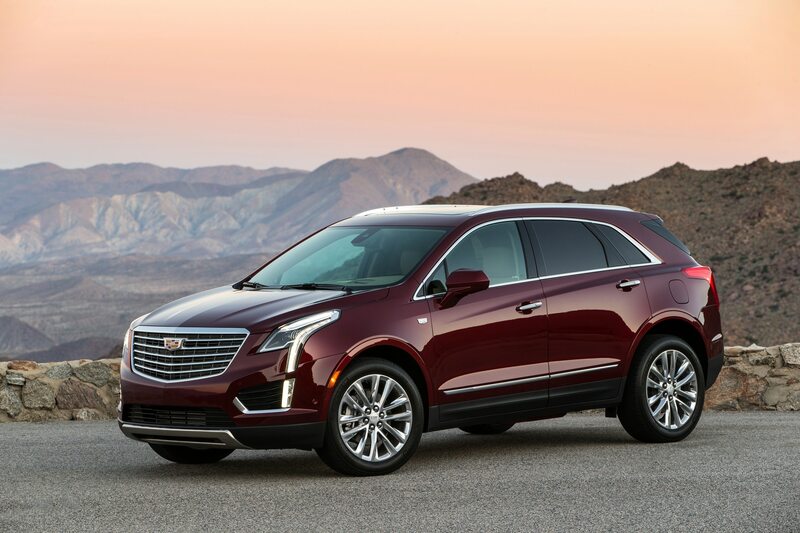 First, the XT5 weighs a lot less than a German crossover, some 3,985 pounds for the front-wheel-drive XT5 and 4,257 pounds for the all-wheel-drive model. 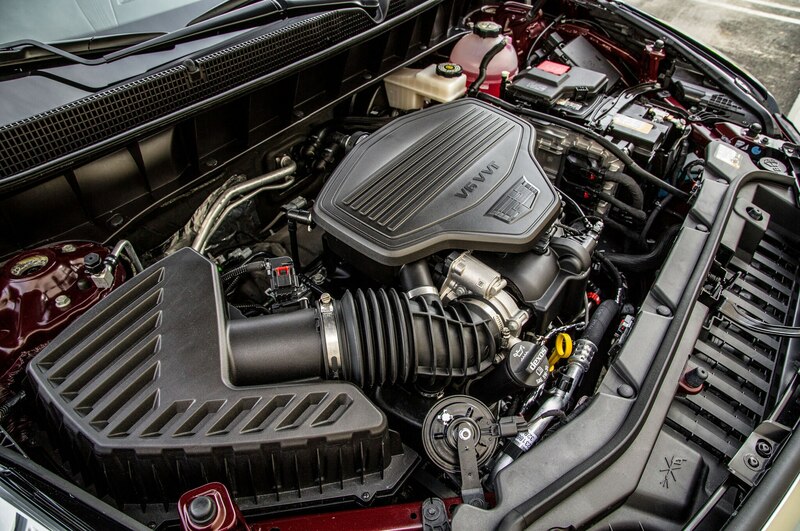 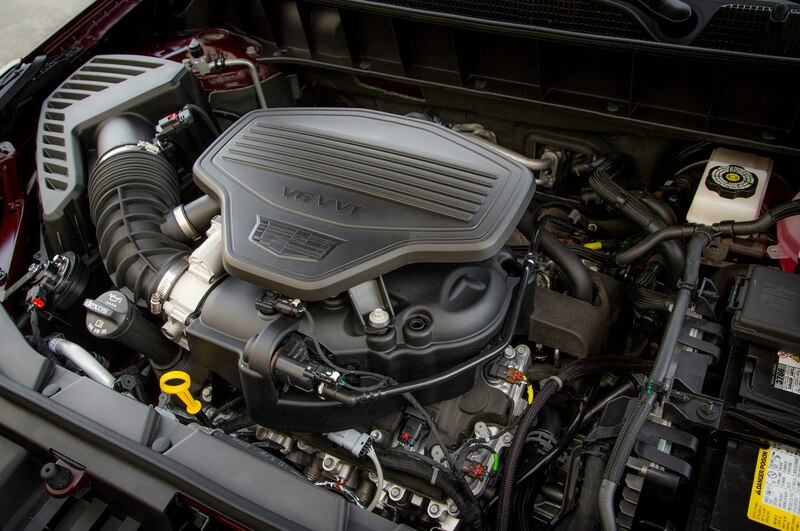 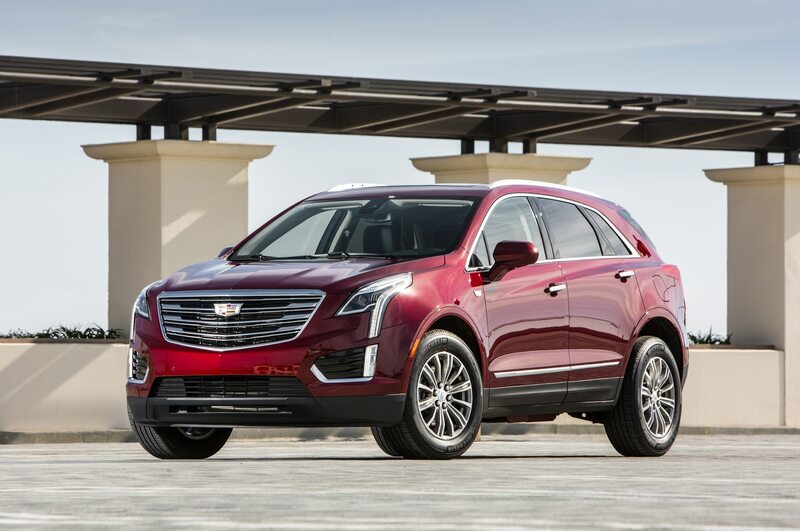 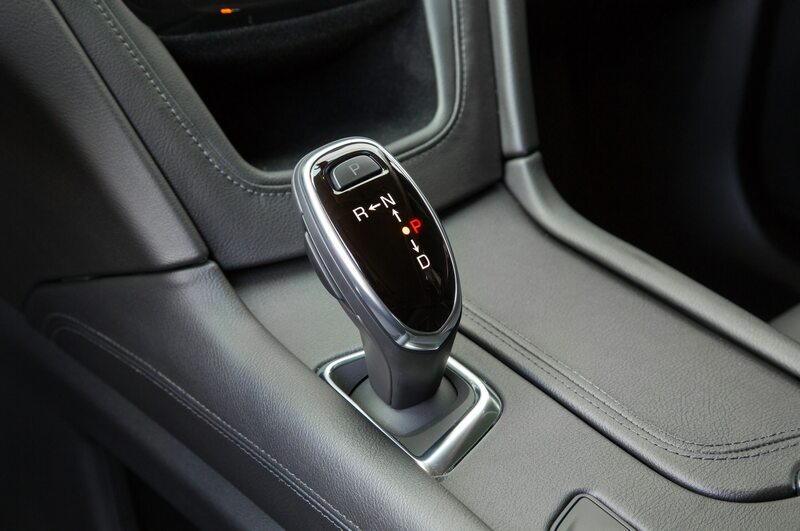 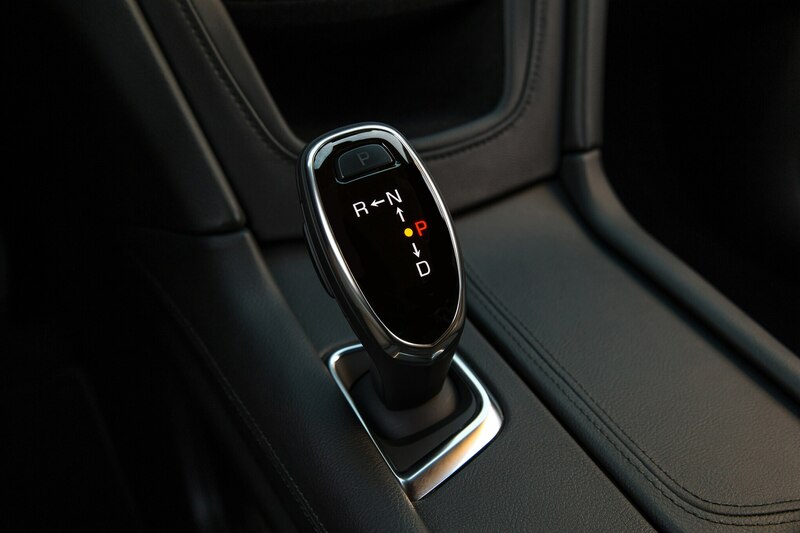 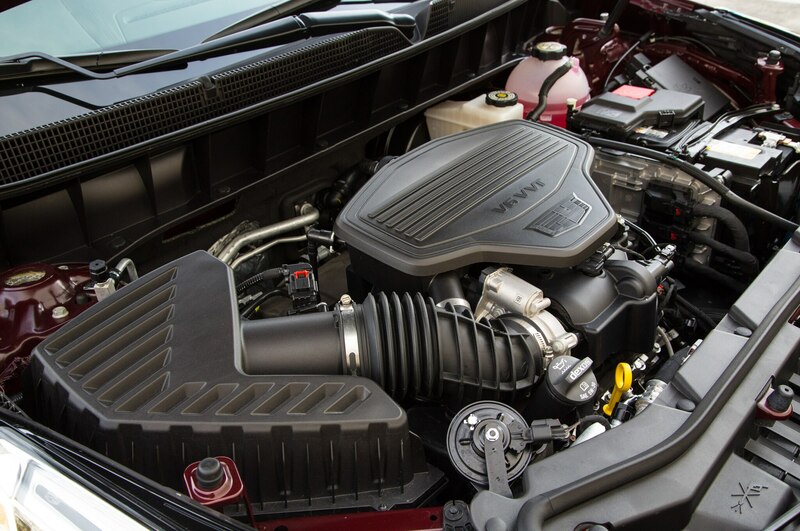 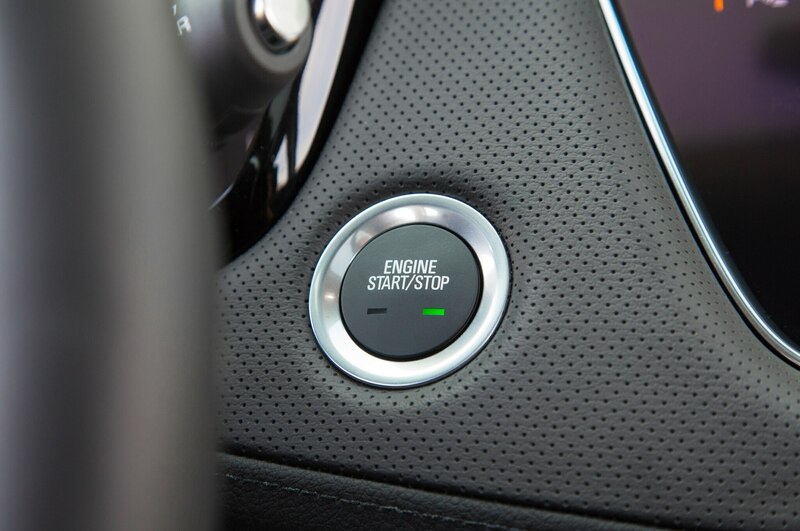 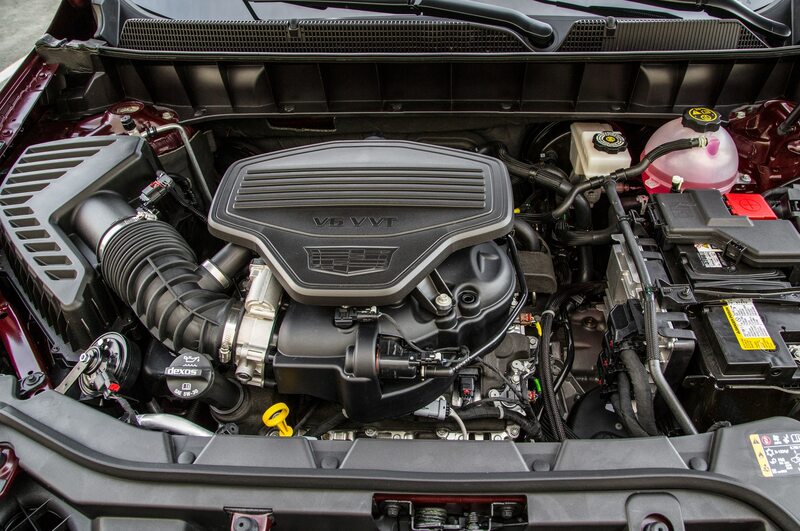 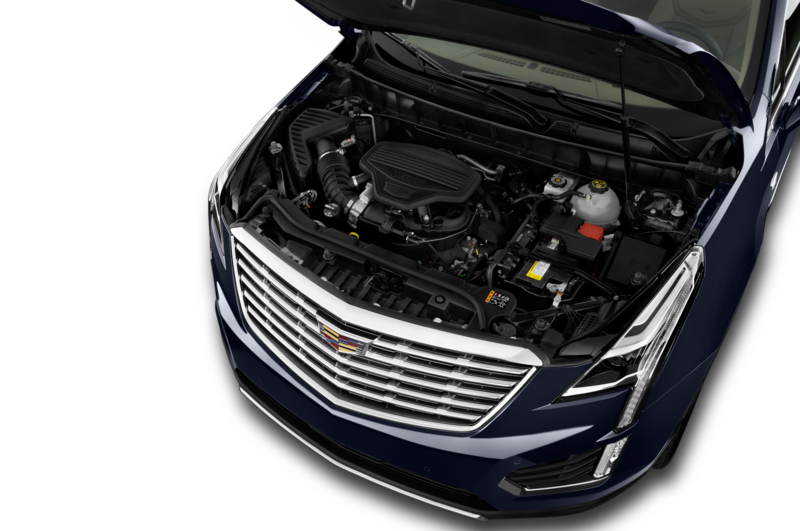 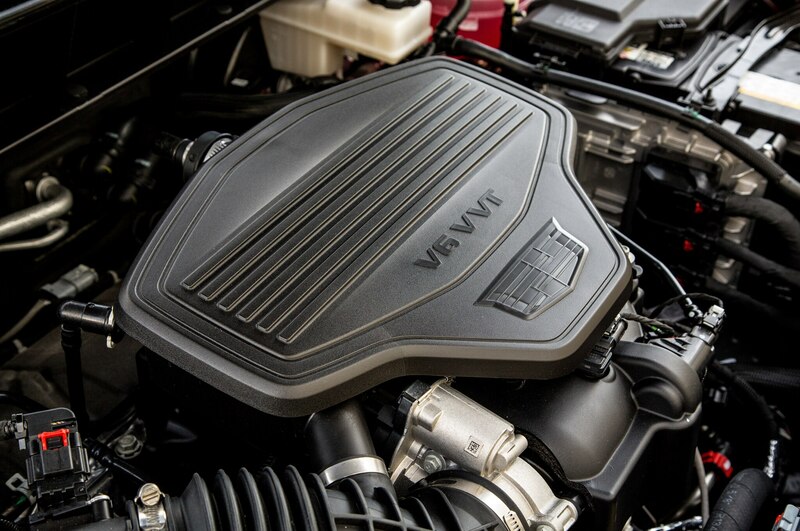 And second, the 310-hp, 3.6-liter V-6 revs toward its redline of 7,200 rpm through its eight-speed transmission with a solidity you don’t find in German crossovers, though we must say the manual-shift mode in the XT5’s new shift-by-wire transmission linkage swaps ratios with a trace of clumsiness. 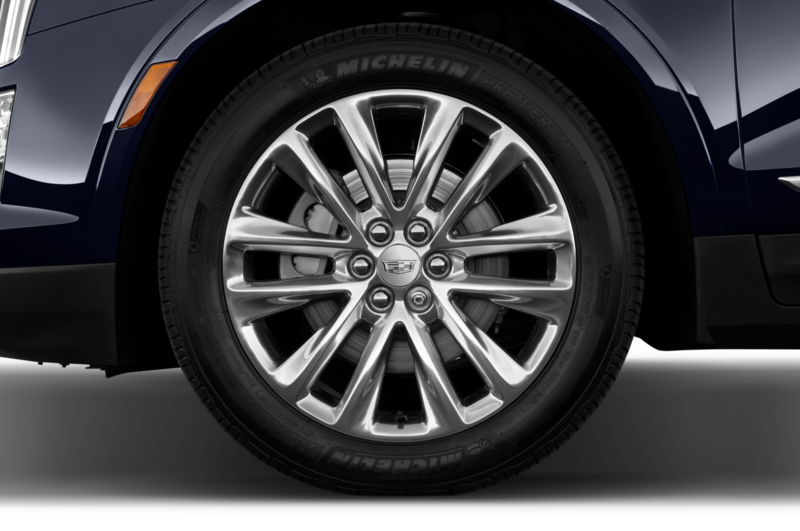 If you’re looking for the kind of cornering dynamics that give you a thrill, it’s easy to gravitate to the $63,495 all-wheel-drive Platinum model, since it’s got those P235/55R-20 Michelin tires, fast-acting ZF-built dampers, and even special rear suspension bushings to insulate you from tire harshness. 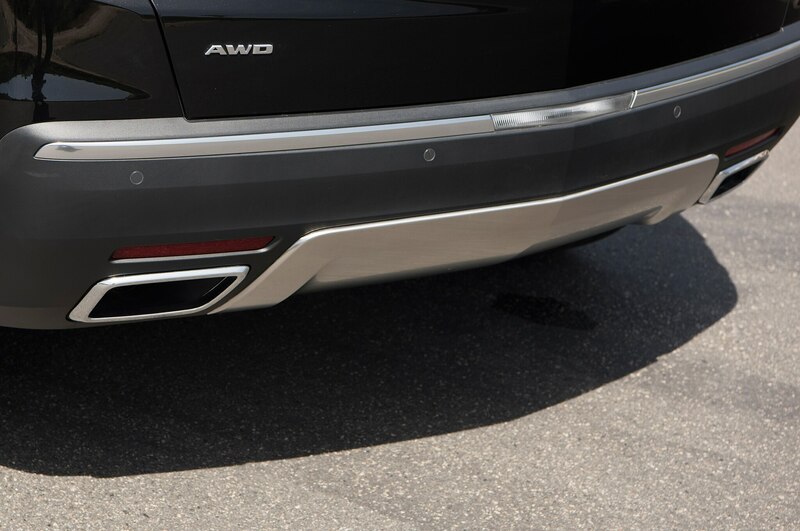 It didn’t snow in the mountains during our drive, but if it had, we could have called upon the AWD system’s GKN-built Twinster differentials at the rear (one at each wheel). 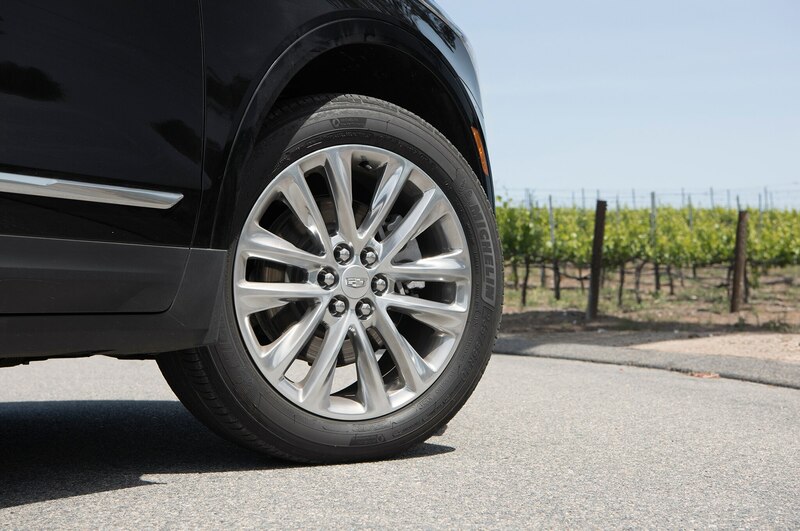 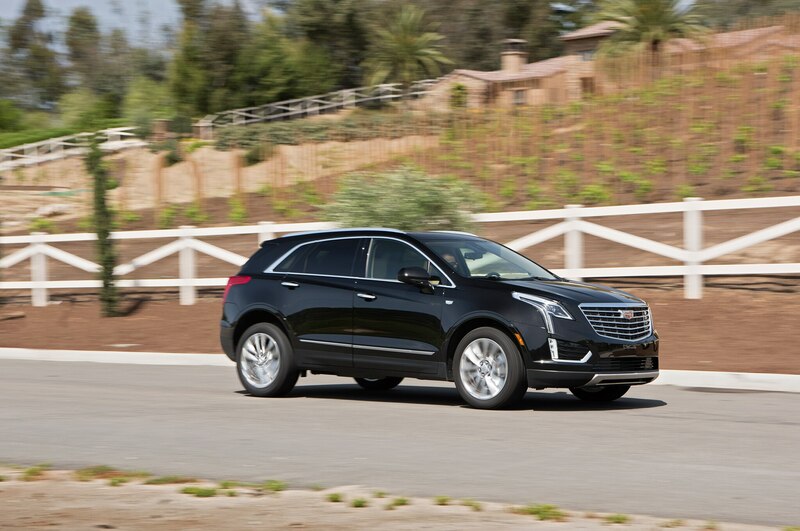 Nevertheless, we also really like the $39,990 front-wheel-drive XT5, as the P235/65R-18 Michelins deliver noticeably better ride comfort, while the XT5’s standard chassis-mode selector toggles the dampers between Touring and Sport with sufficient effectiveness to give you plenty of each. 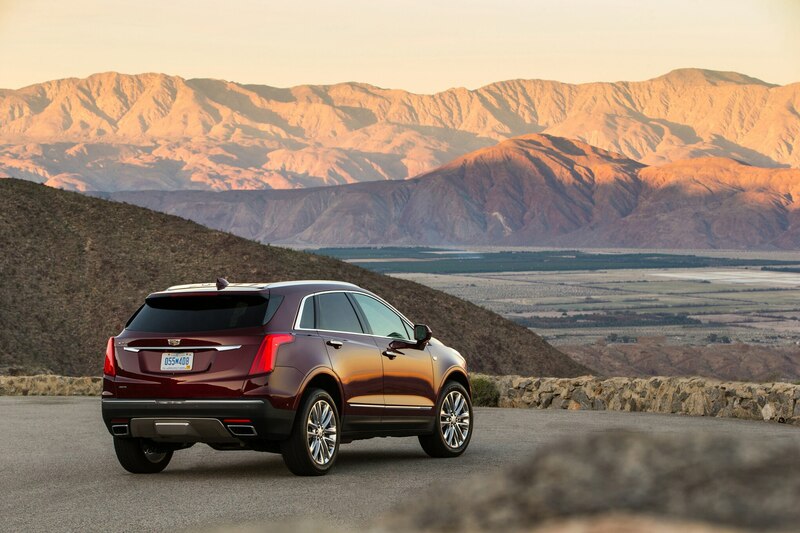 So we arrived in Julian, having made good speed and enjoying the drive for more than just the scenery. 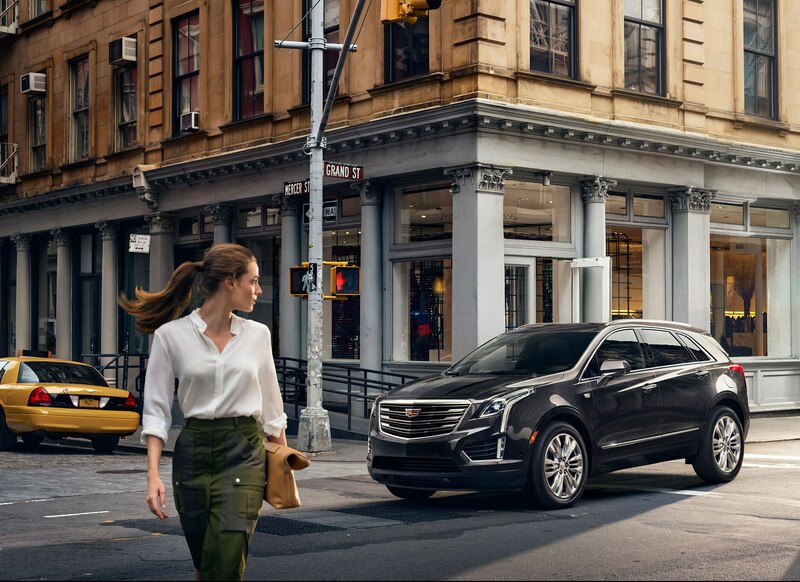 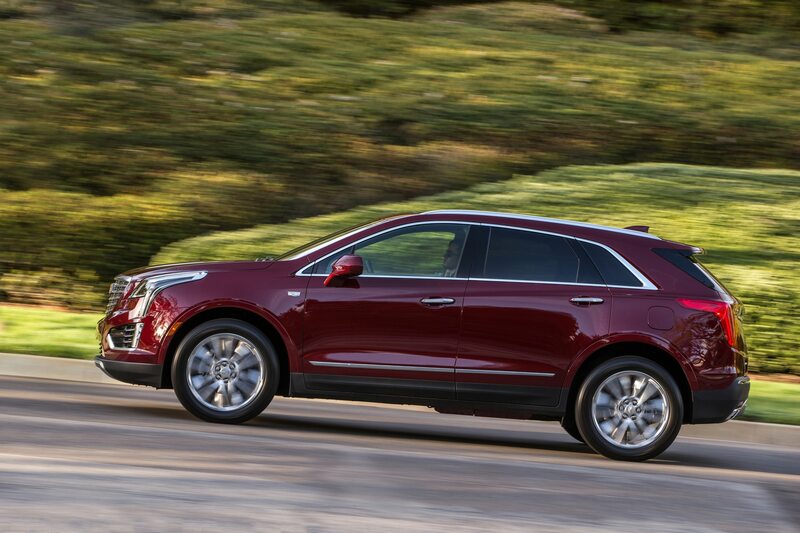 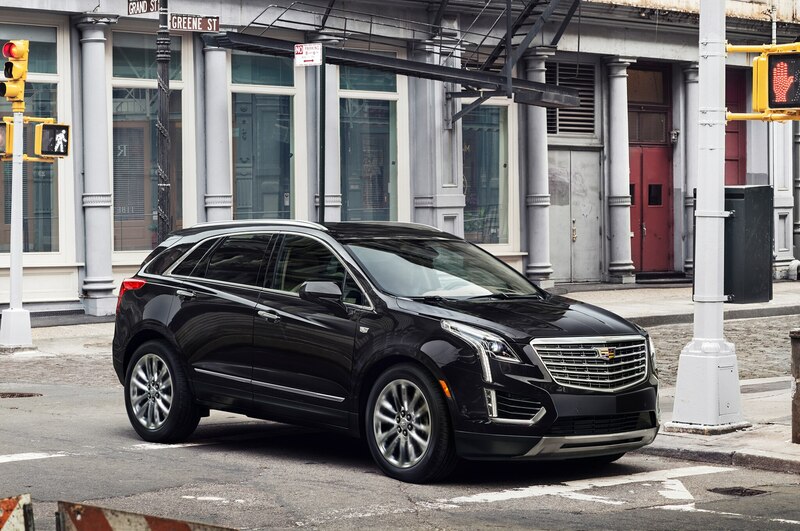 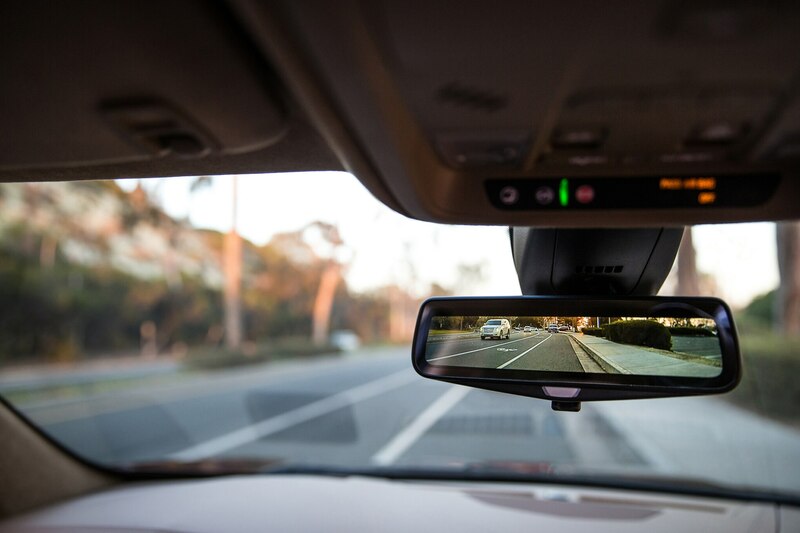 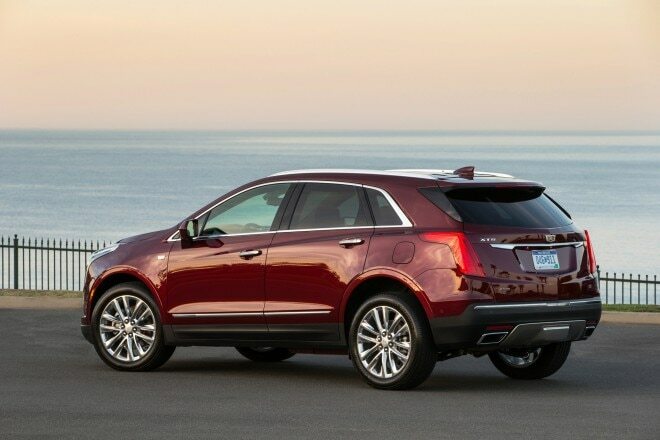 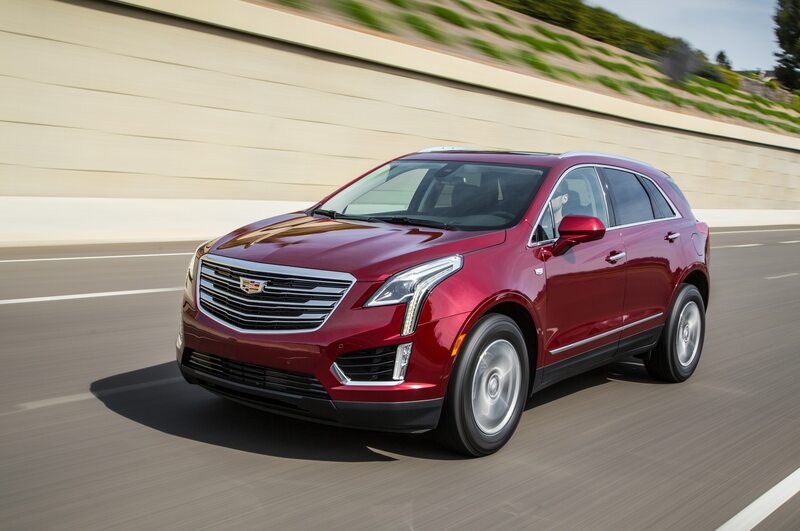 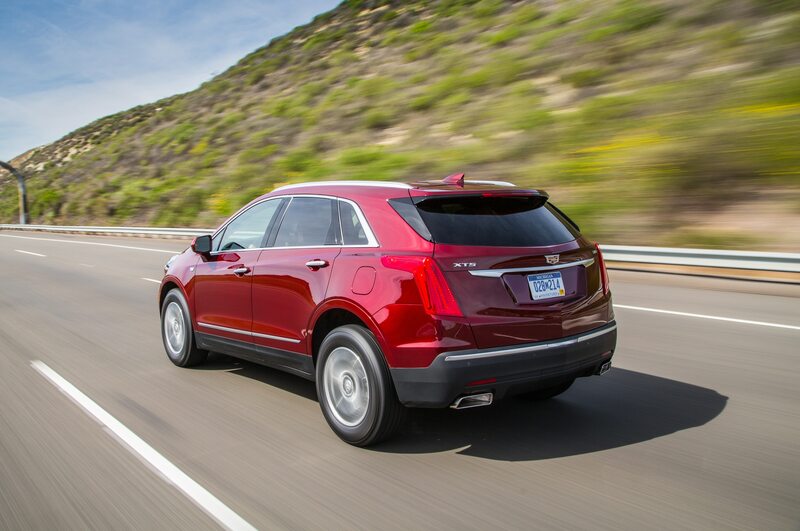 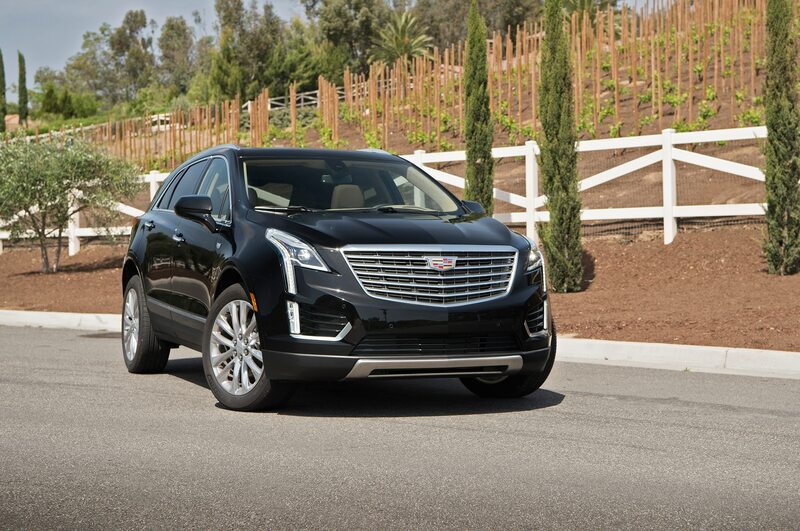 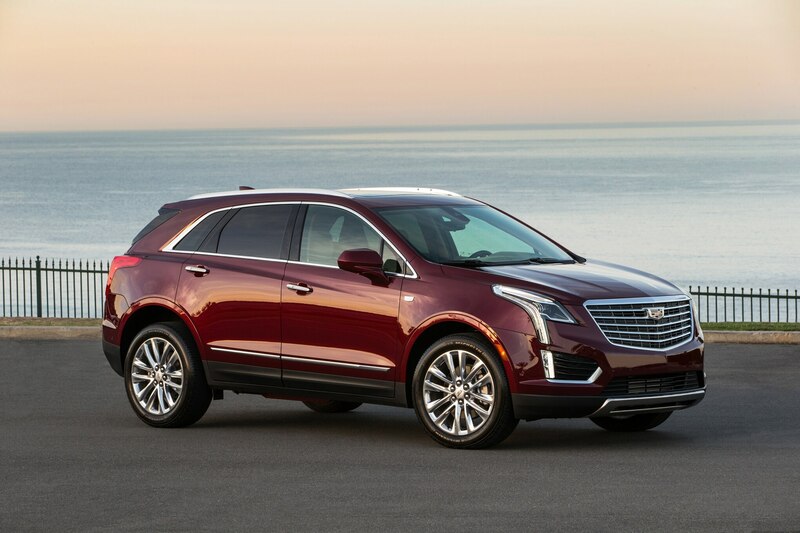 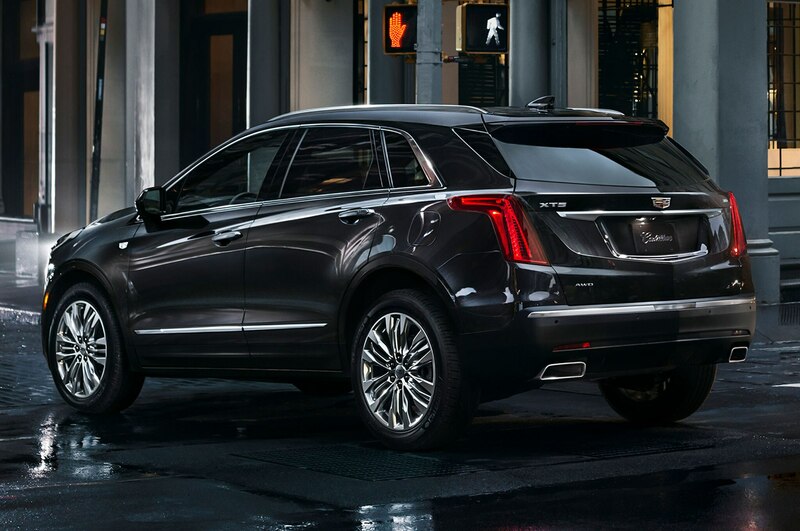 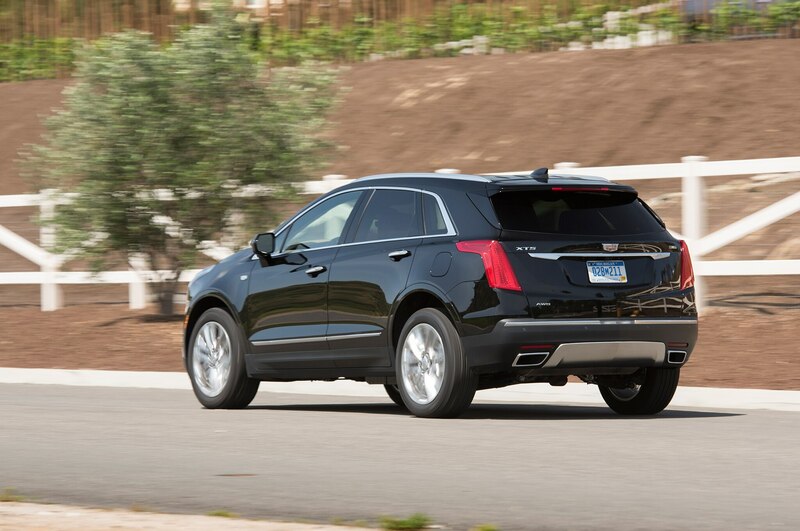 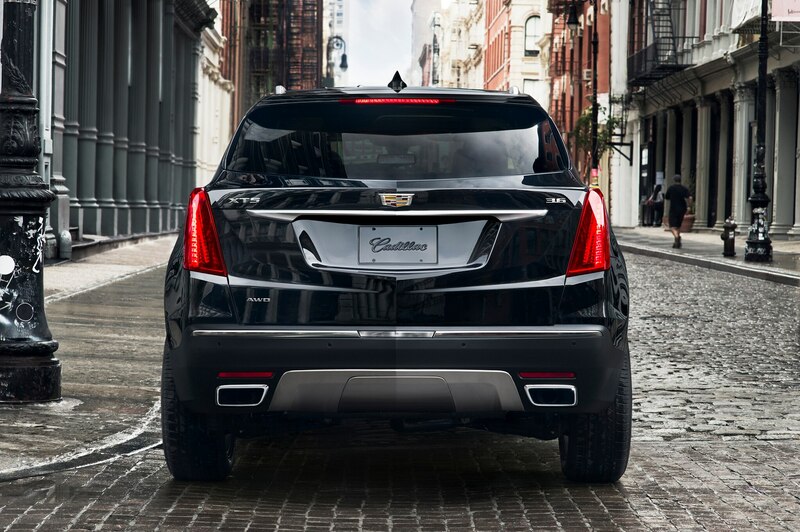 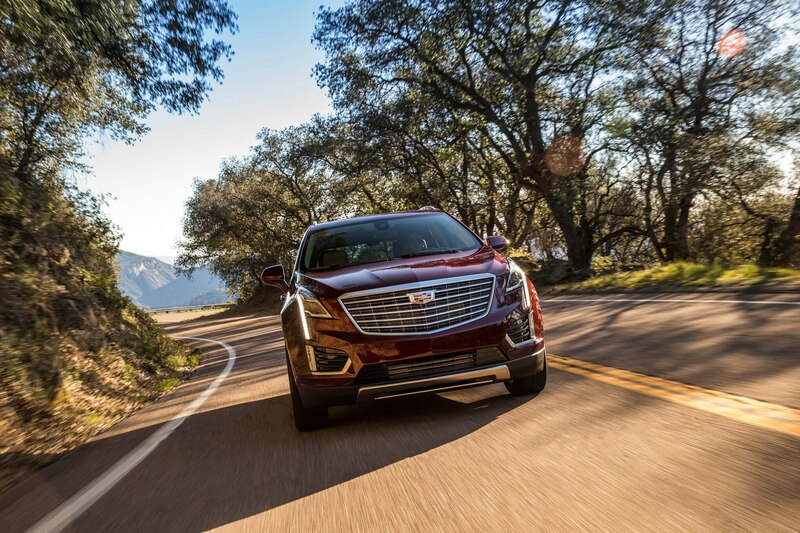 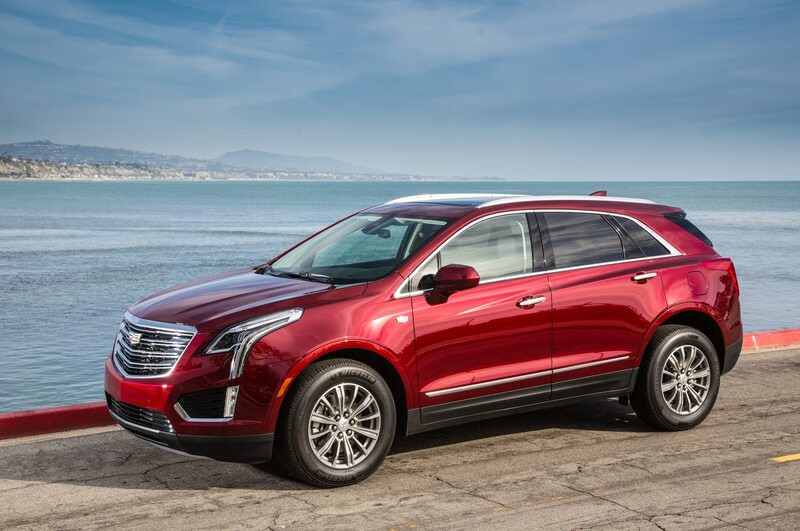 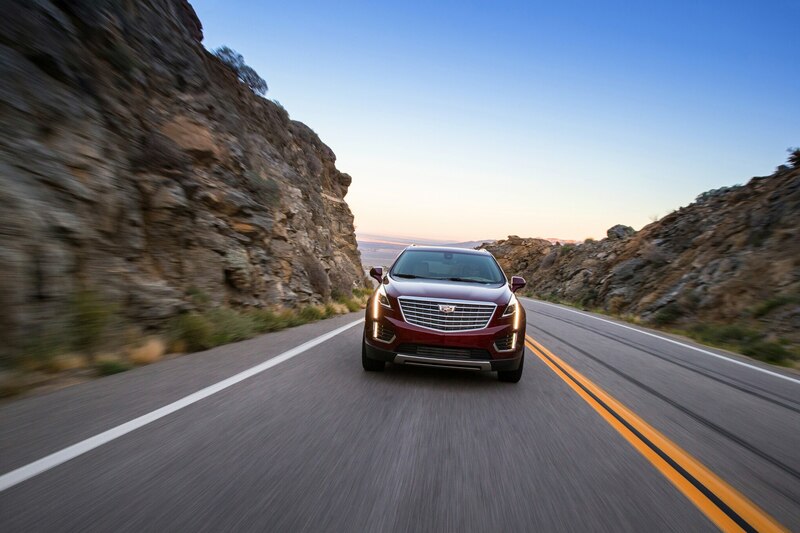 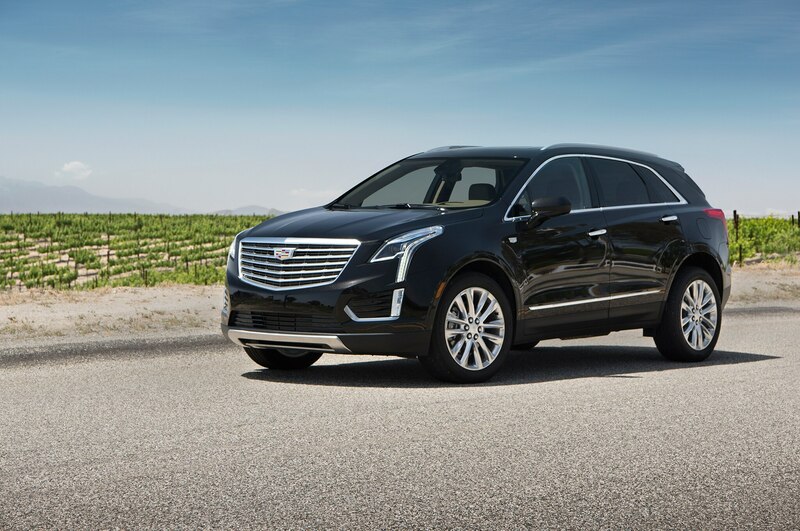 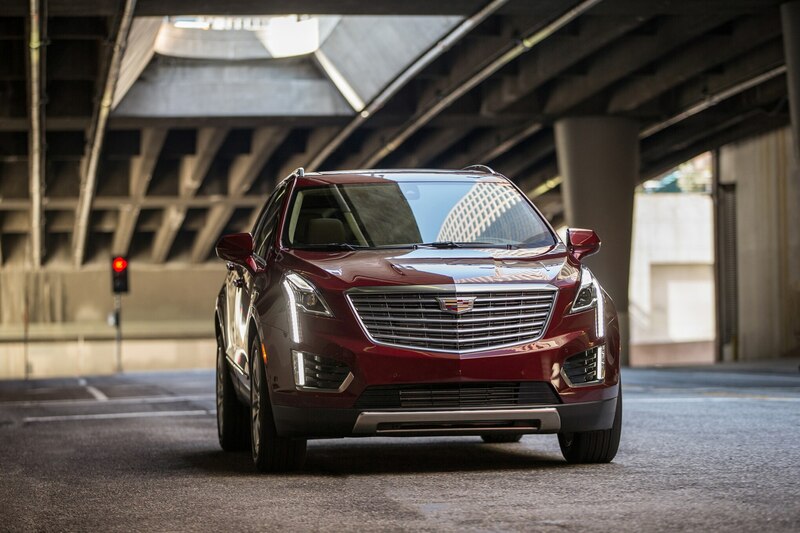 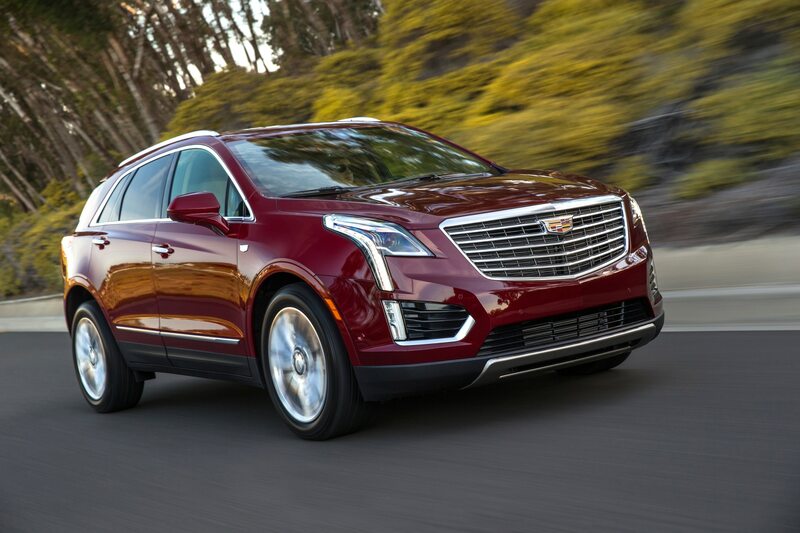 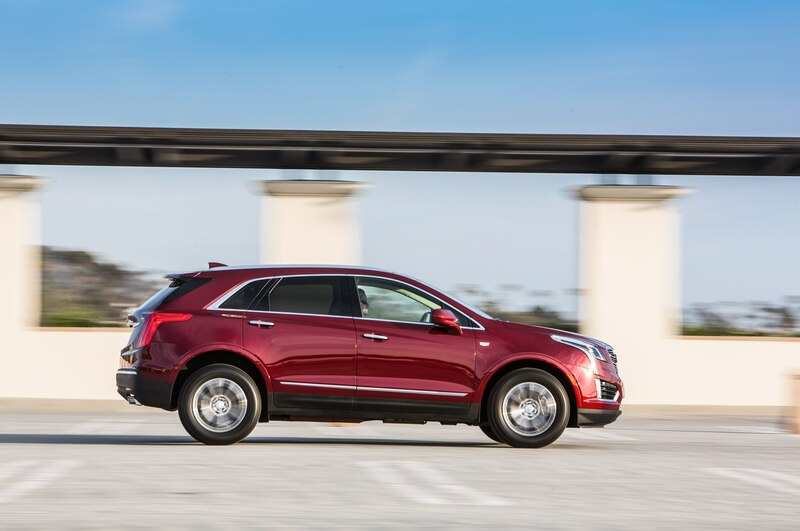 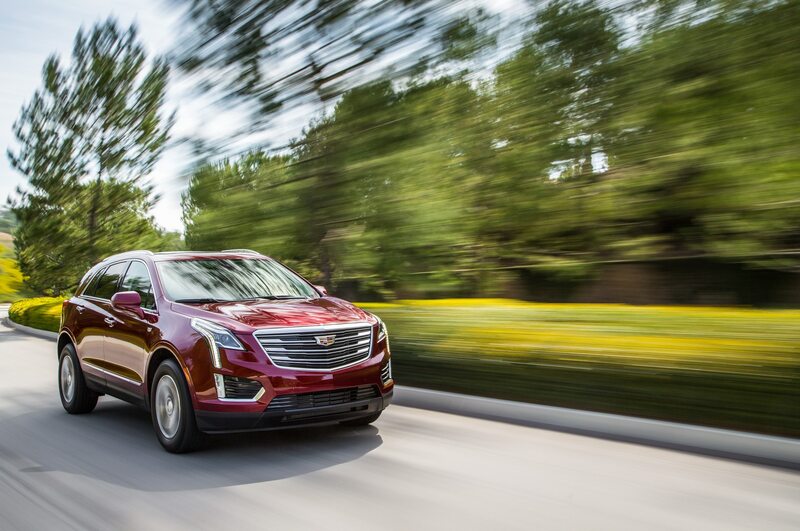 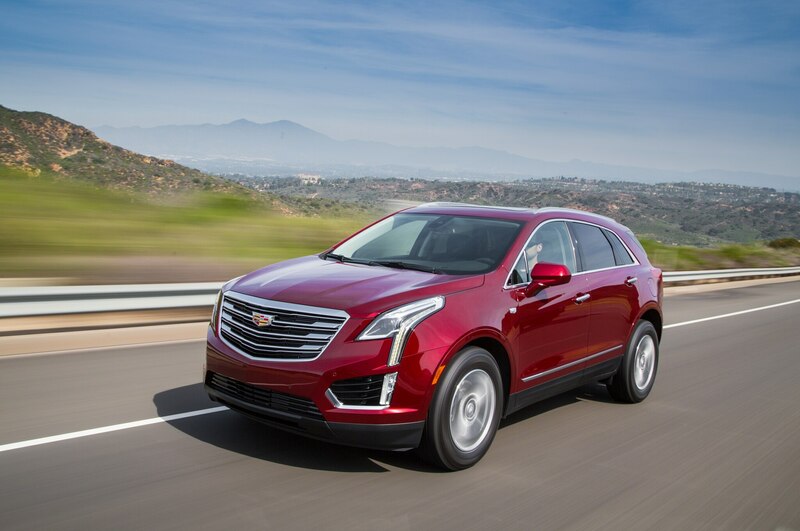 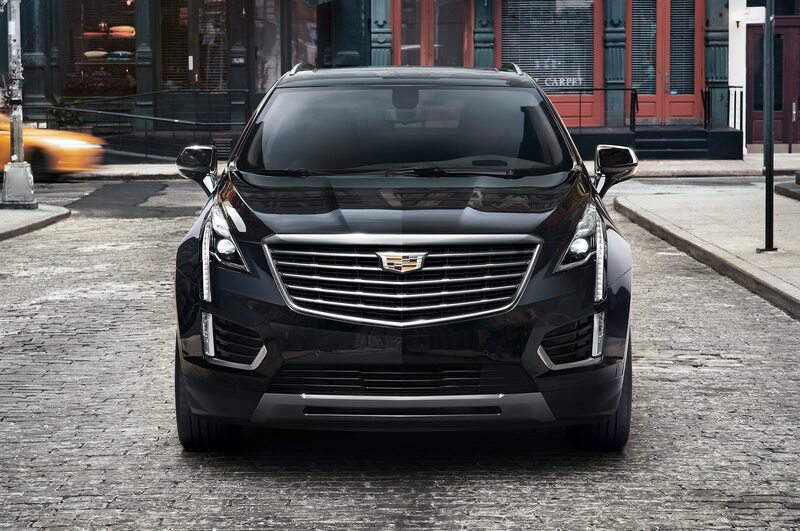 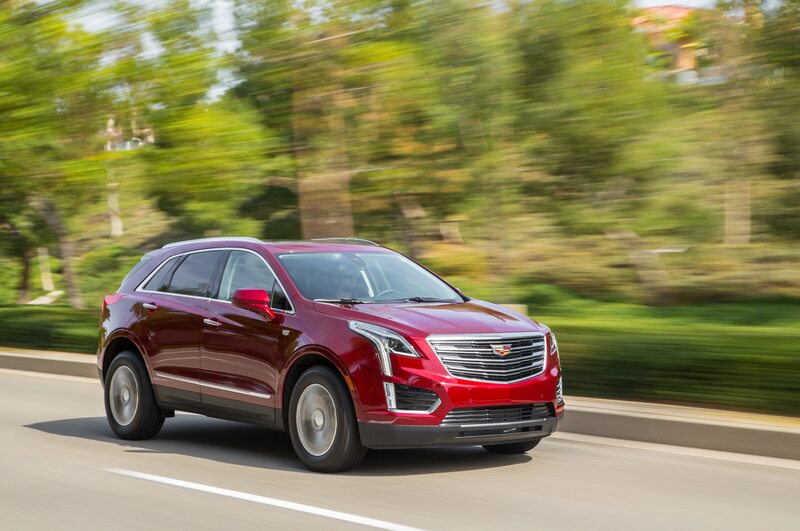 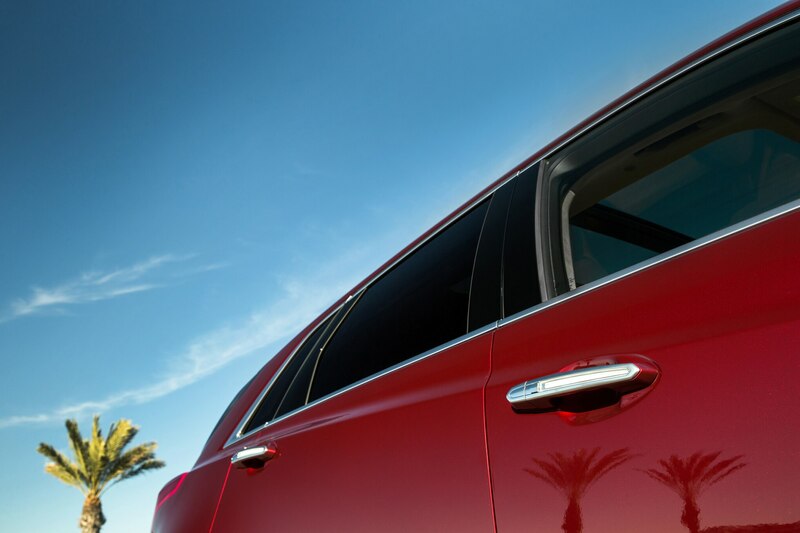 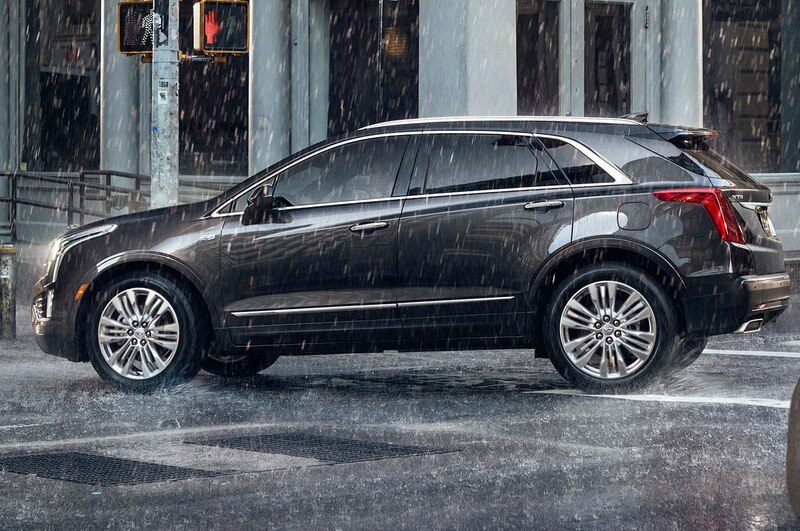 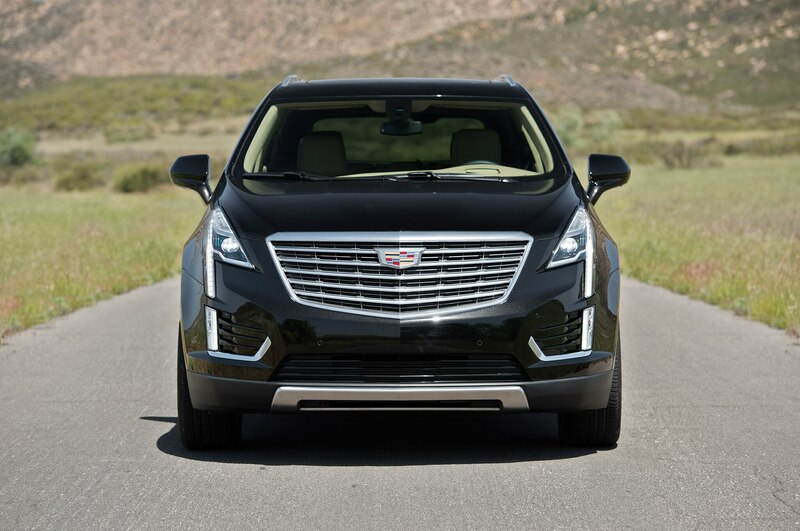 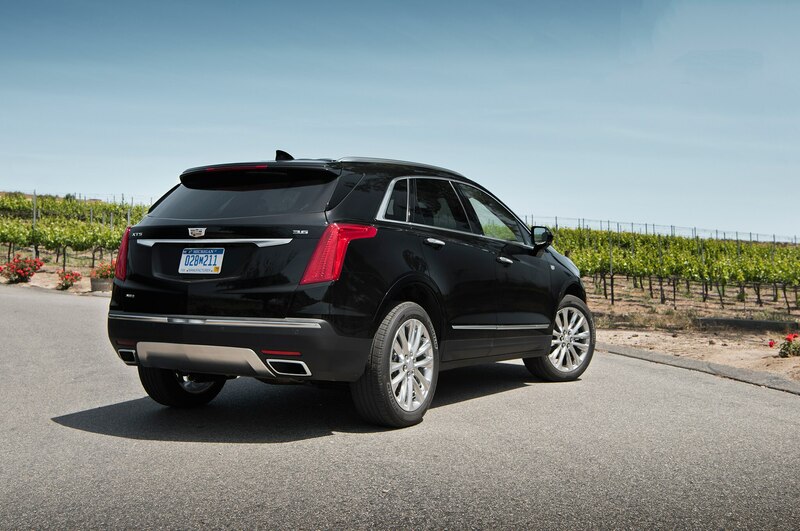 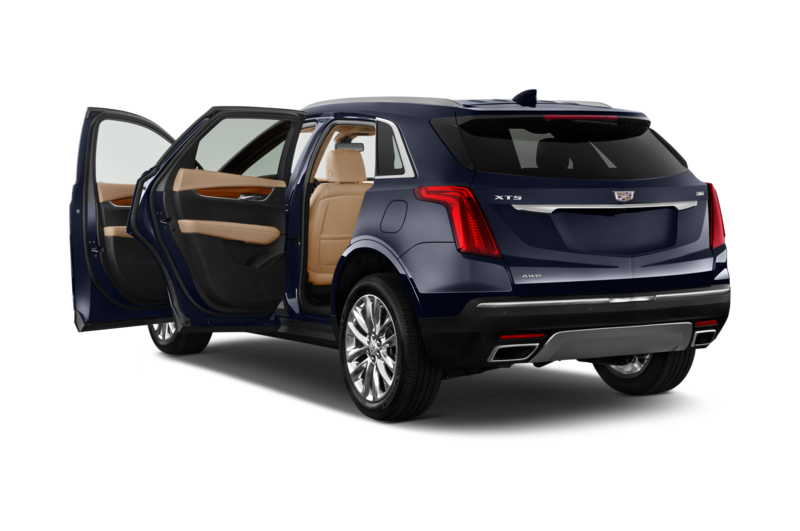 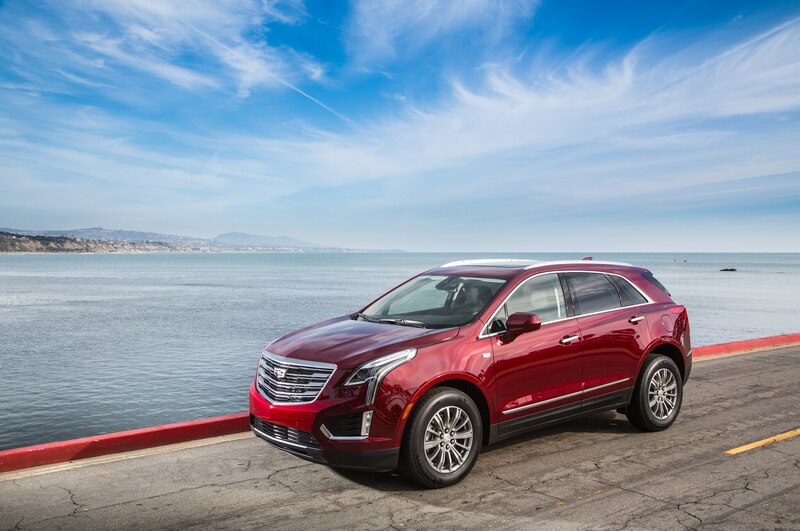 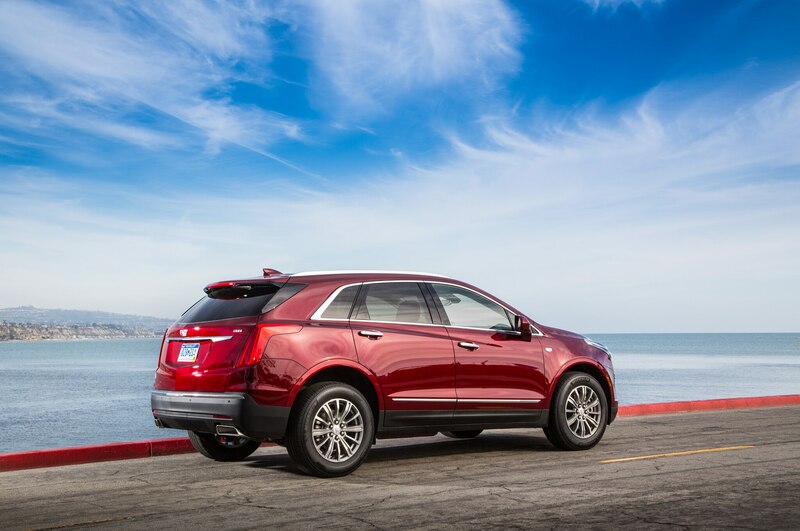 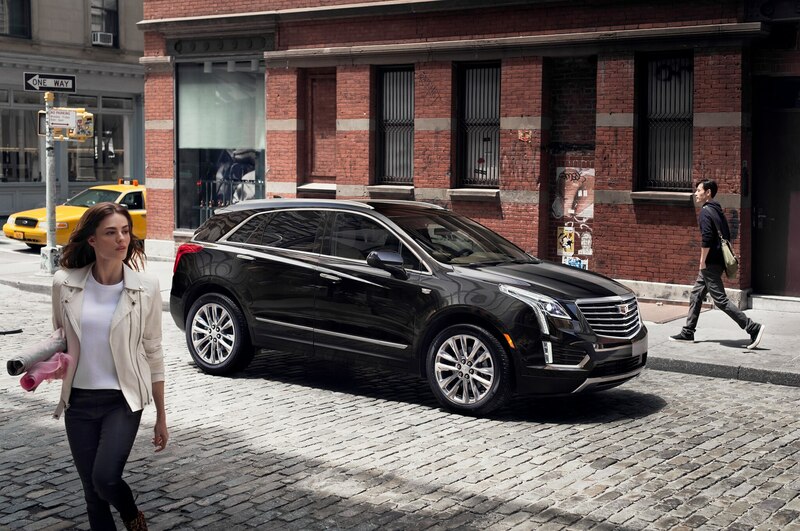 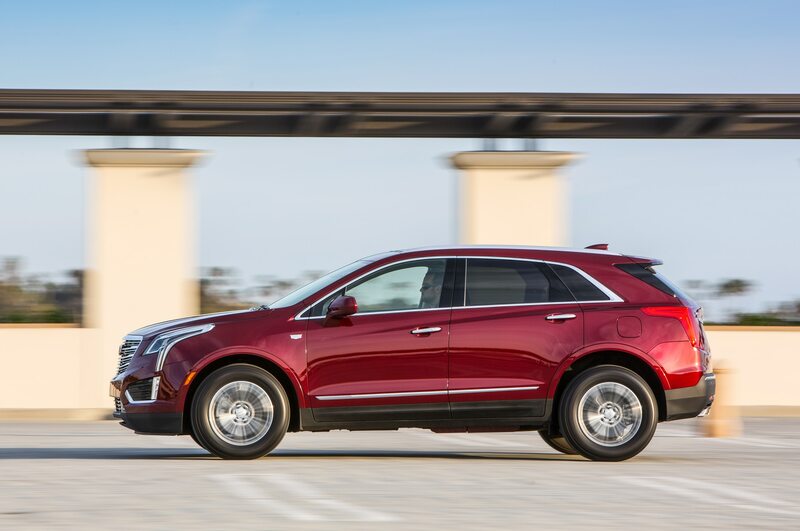 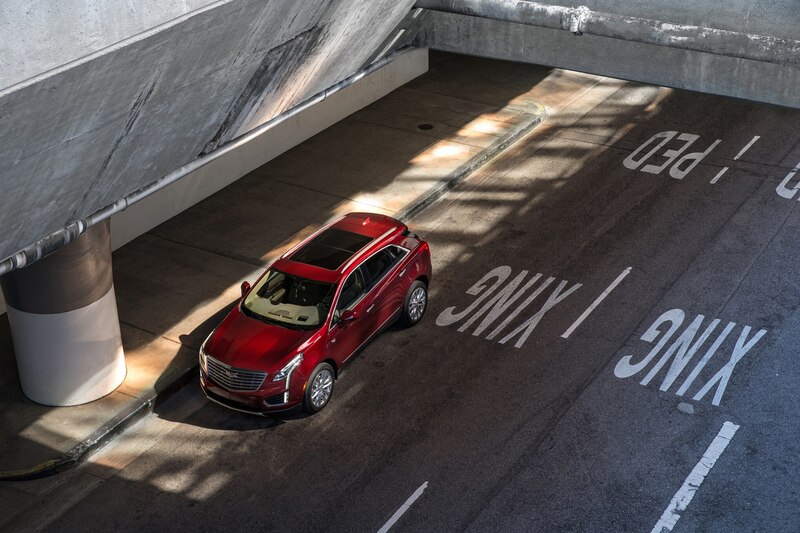 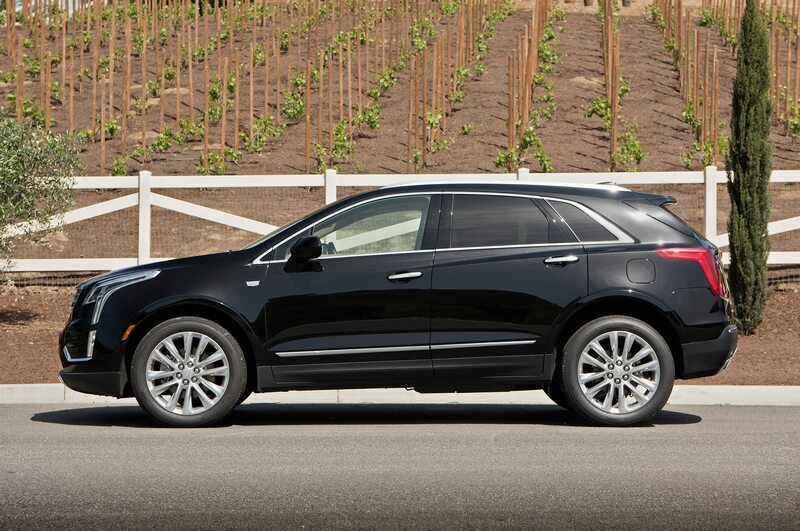 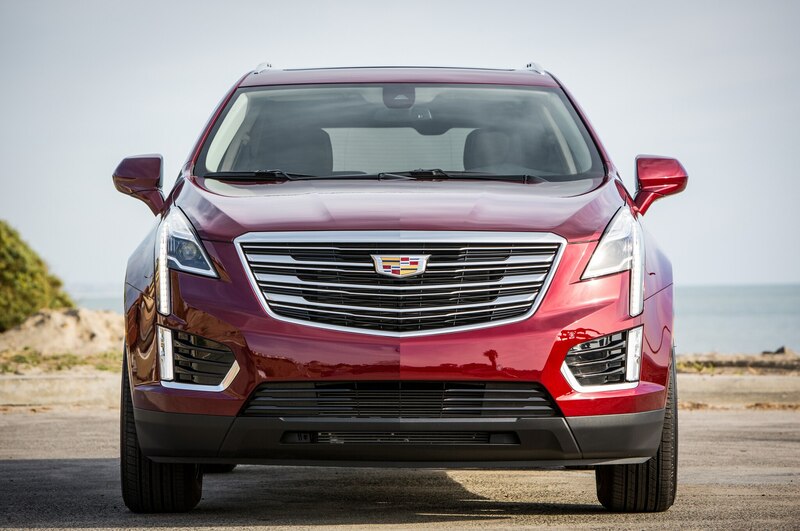 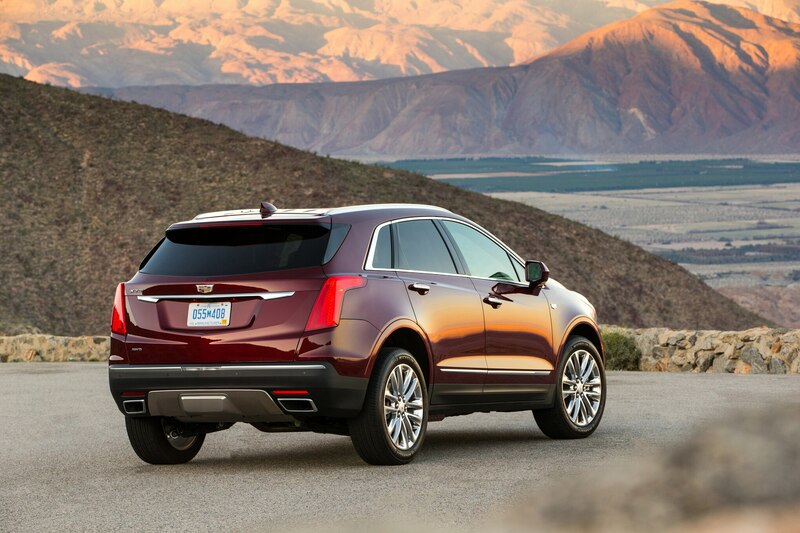 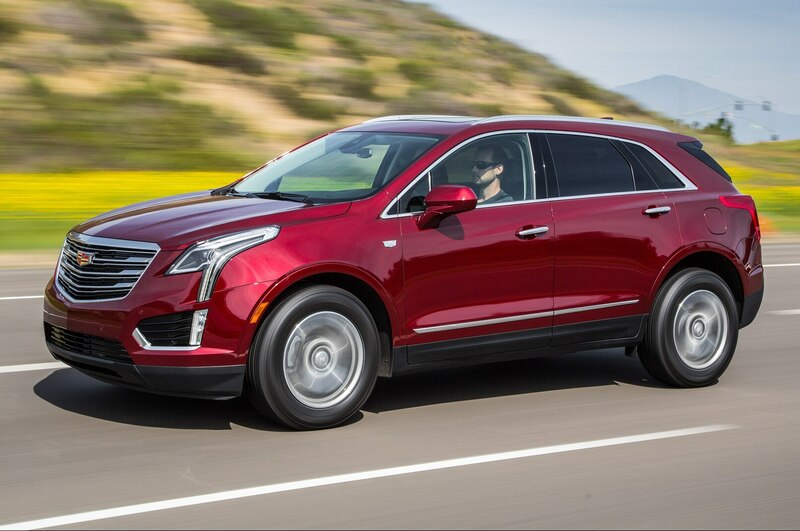 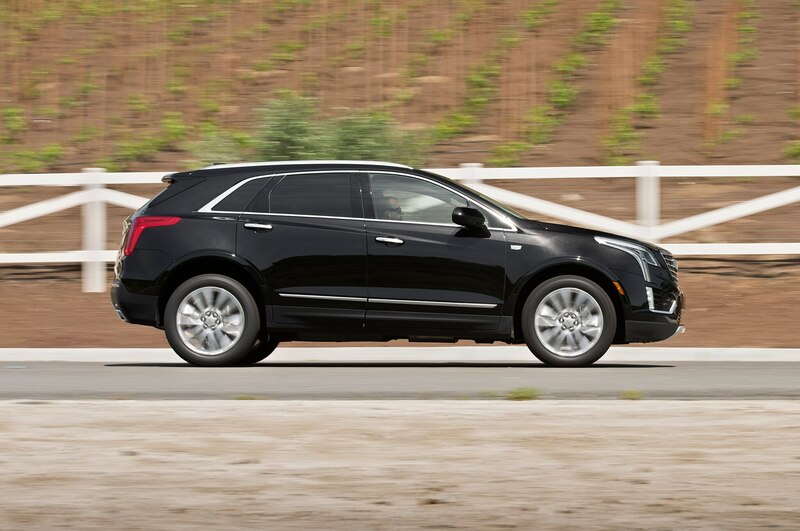 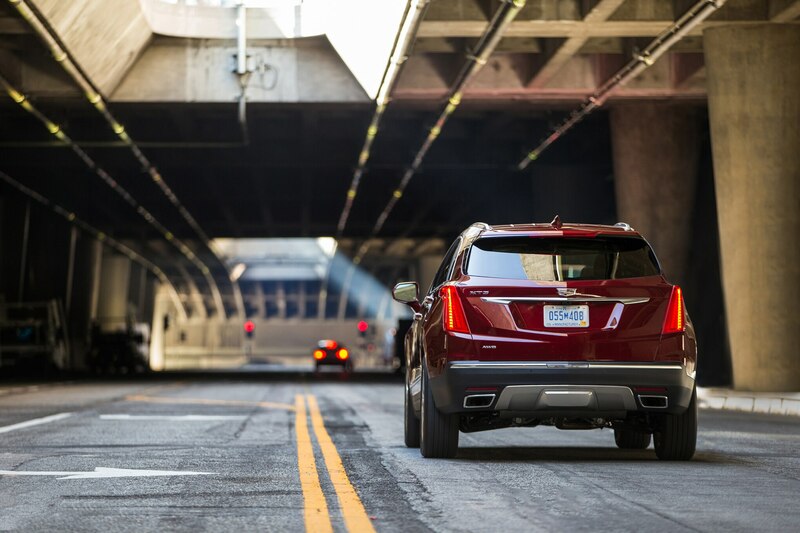 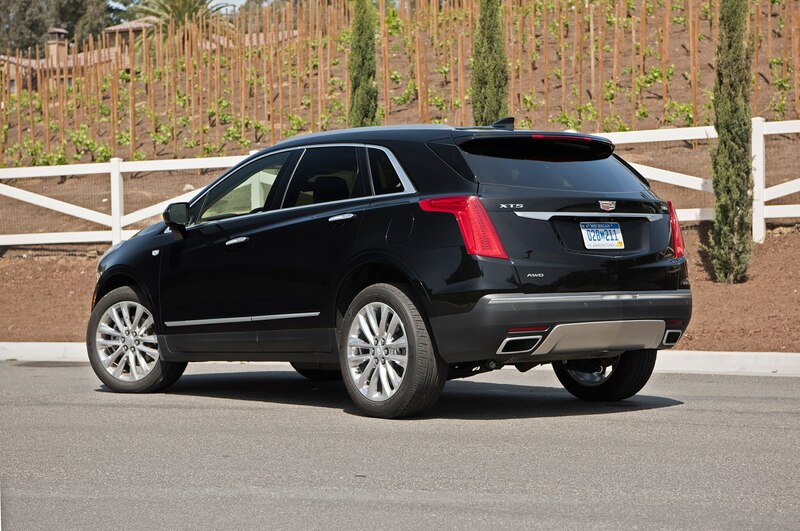 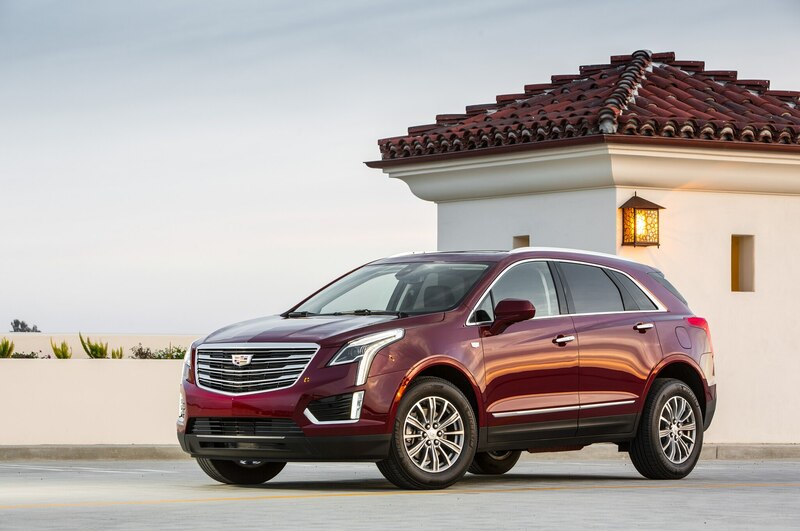 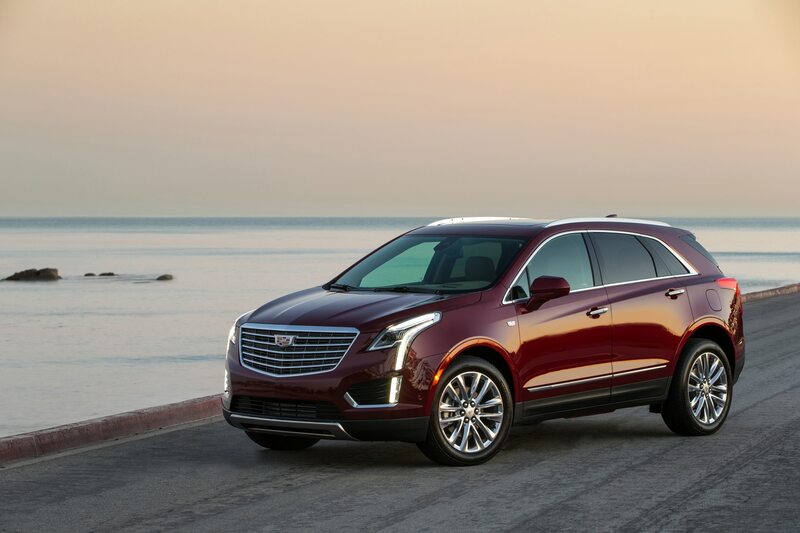 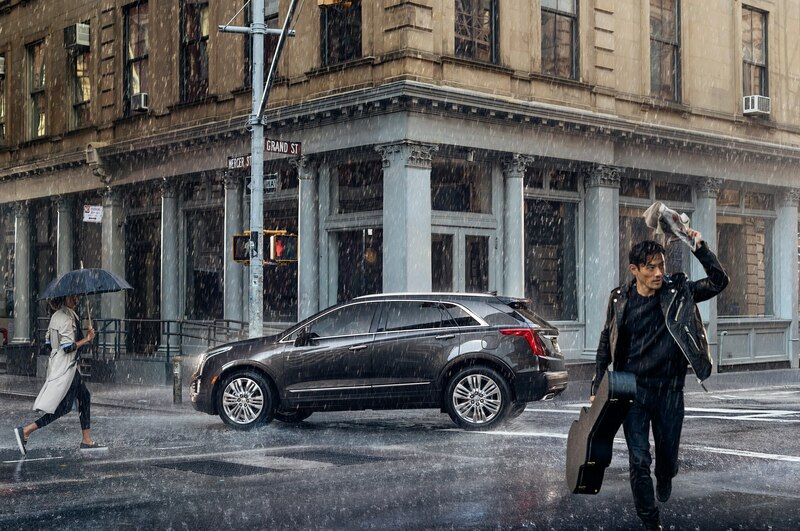 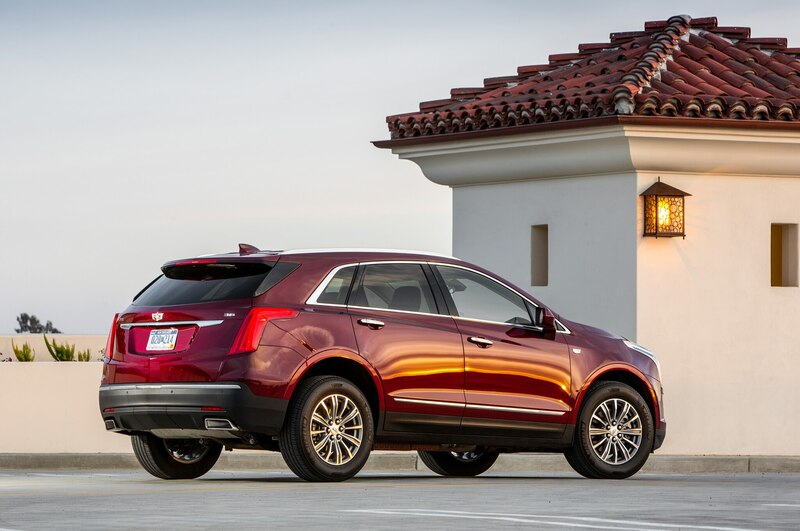 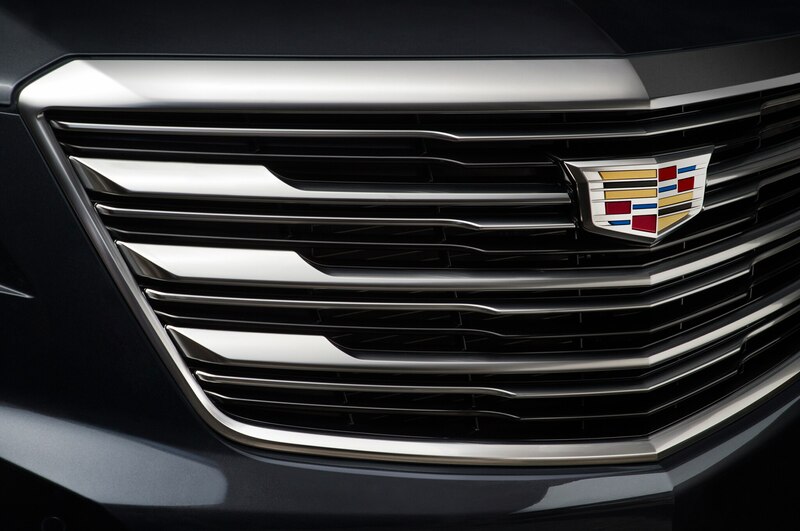 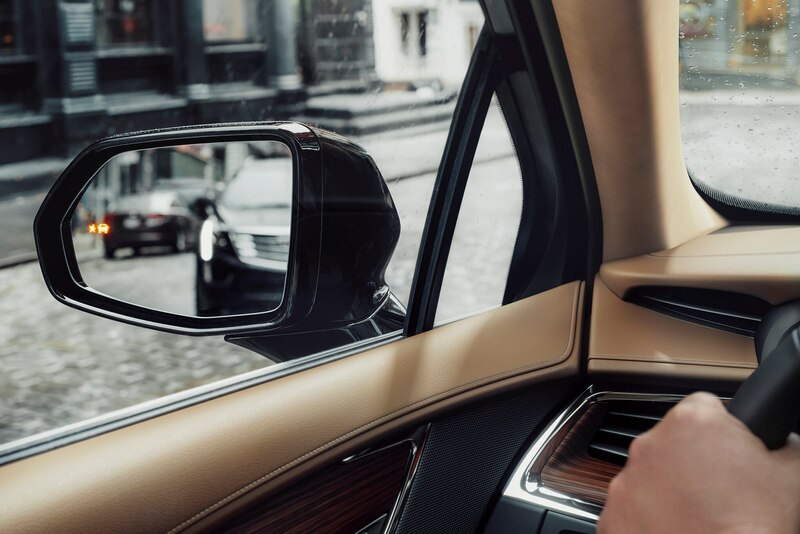 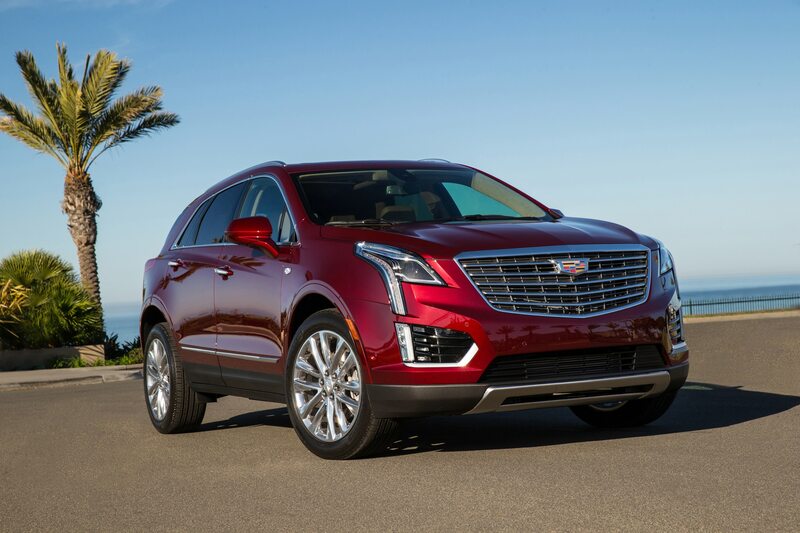 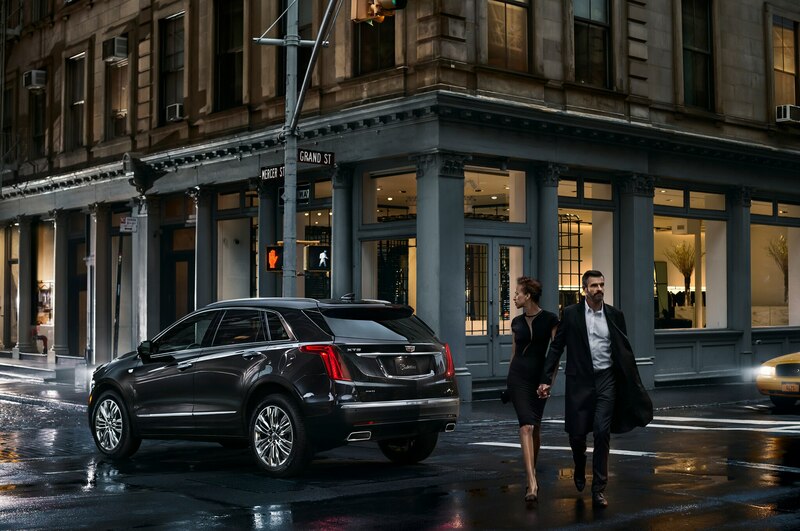 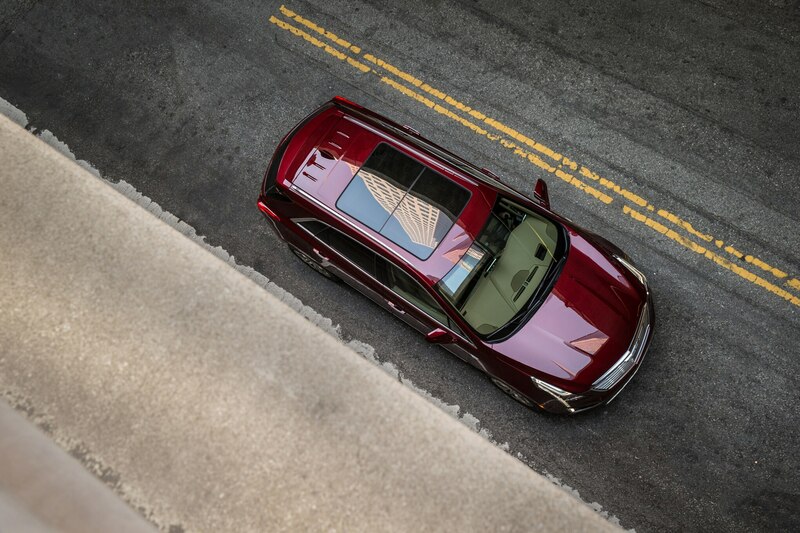 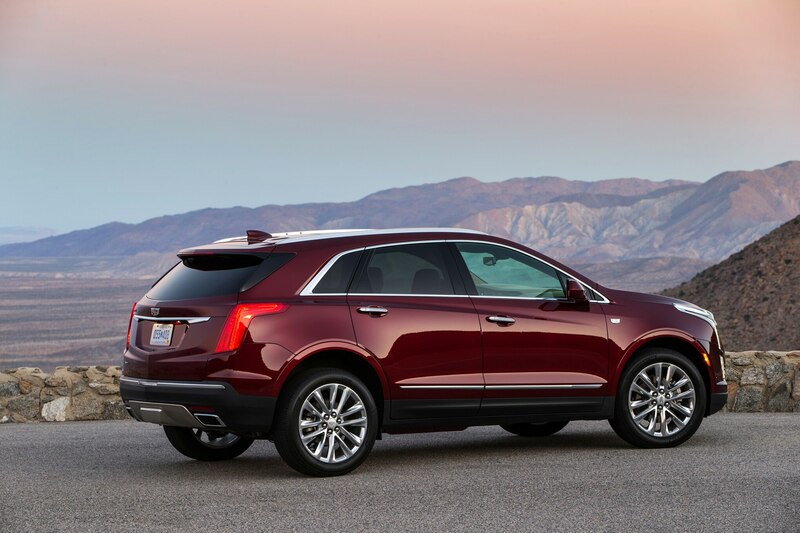 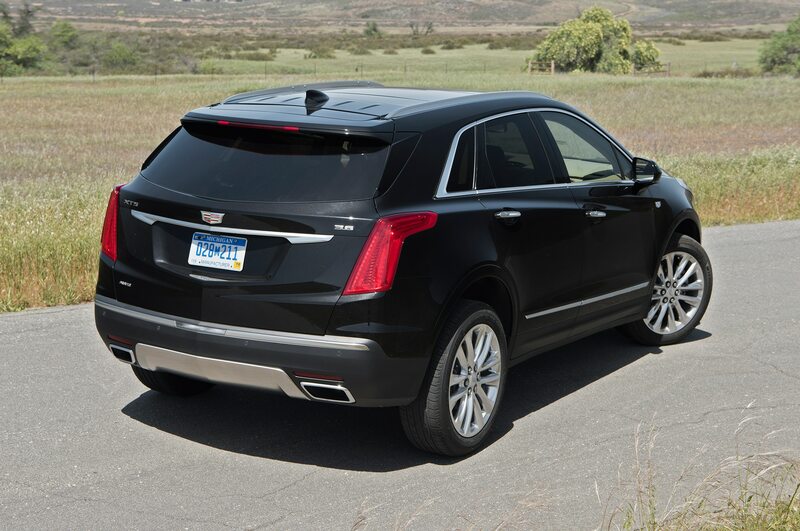 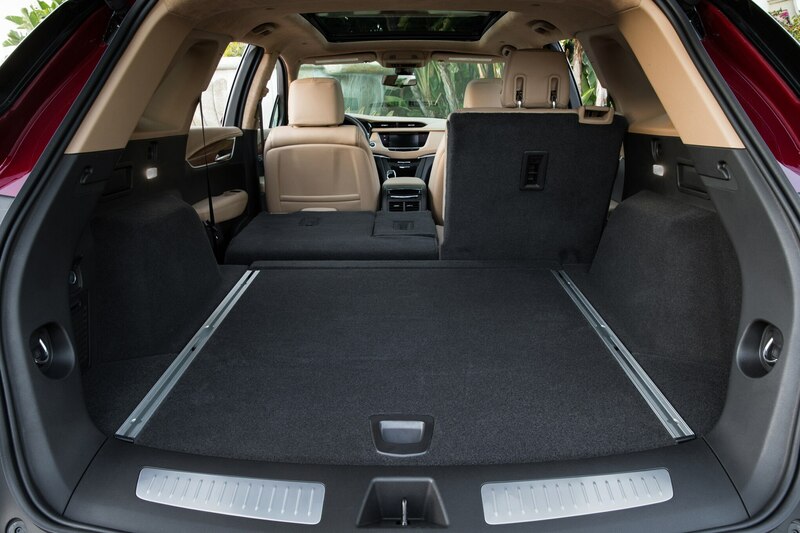 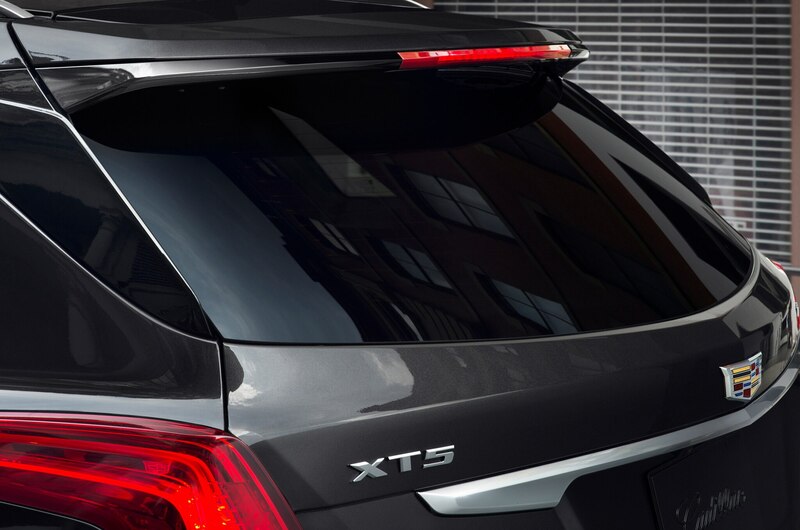 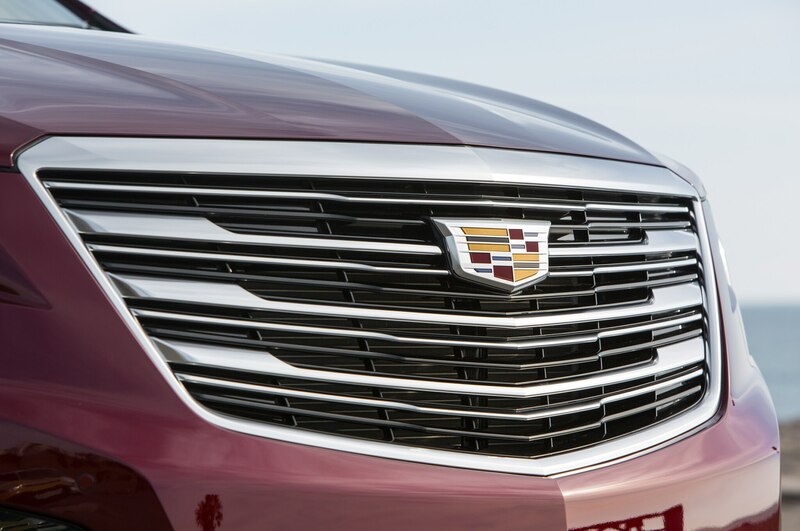 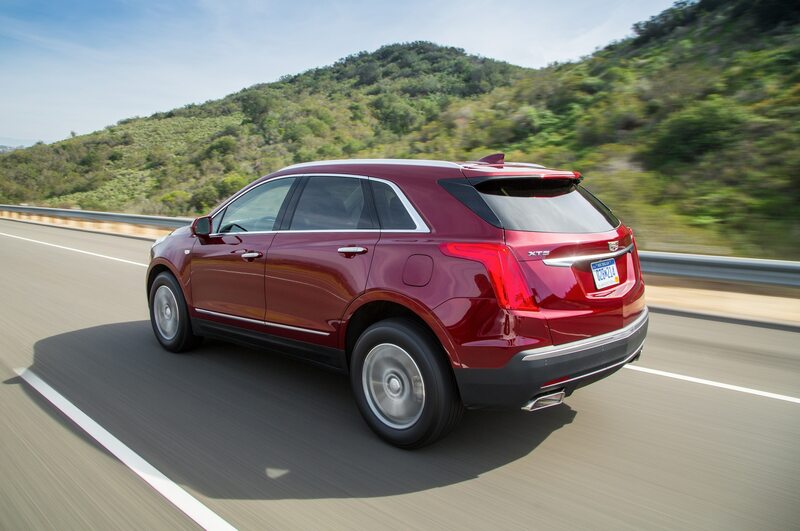 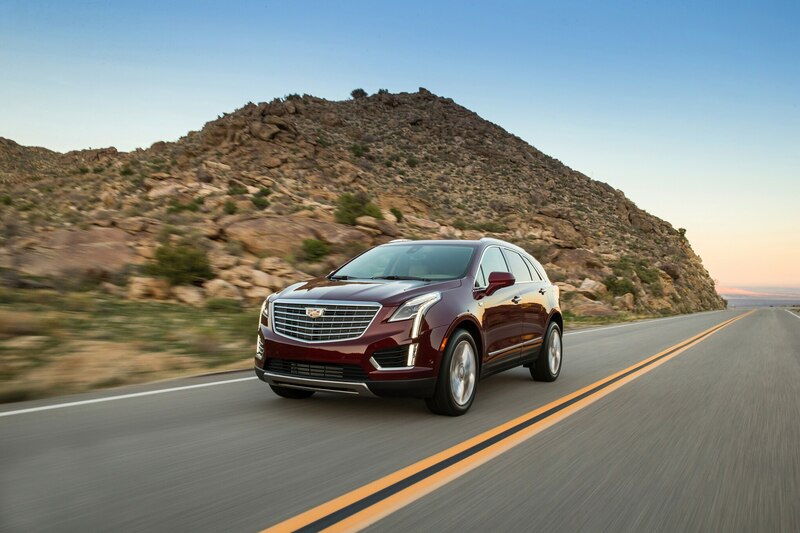 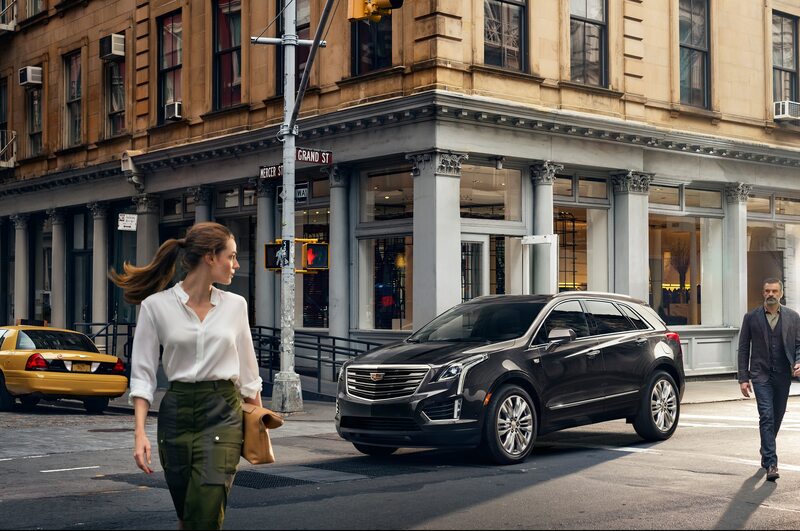 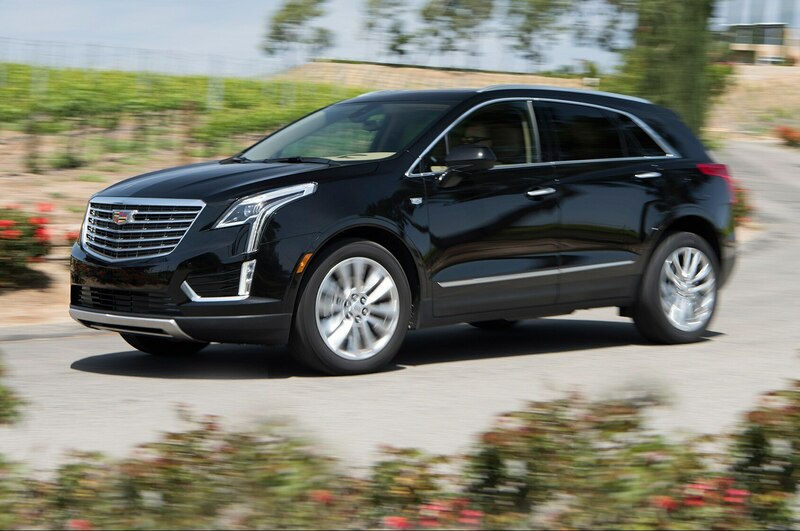 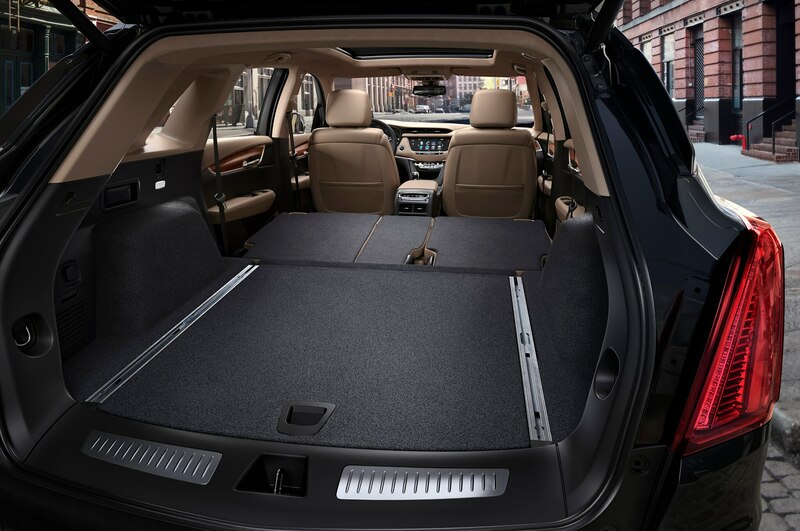 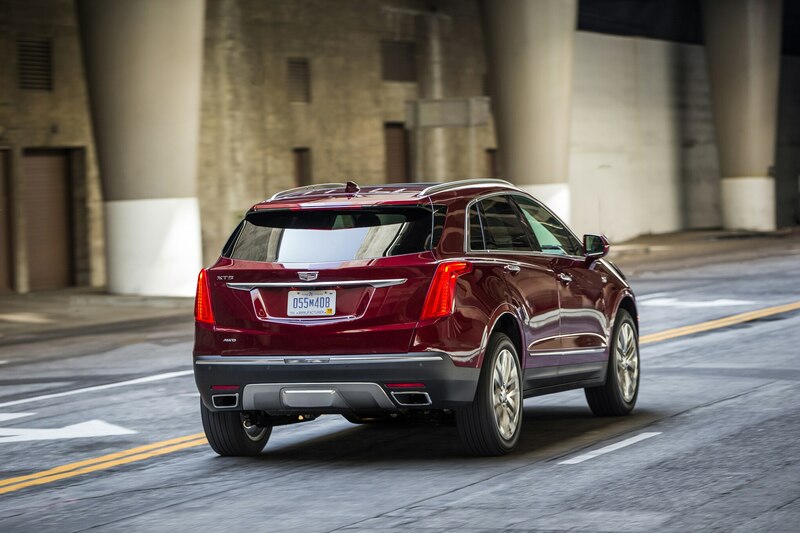 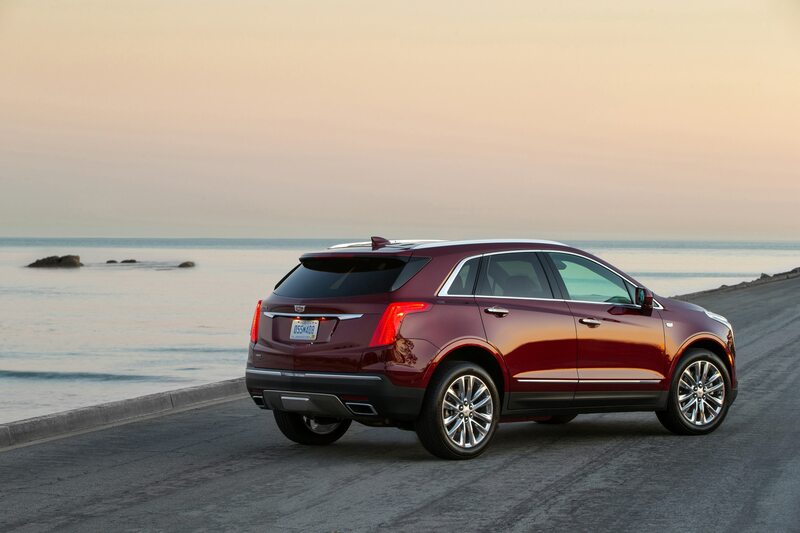 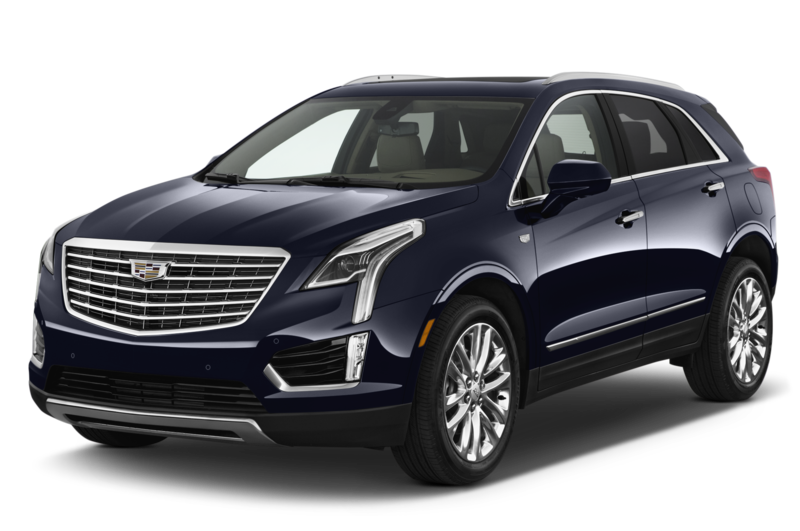 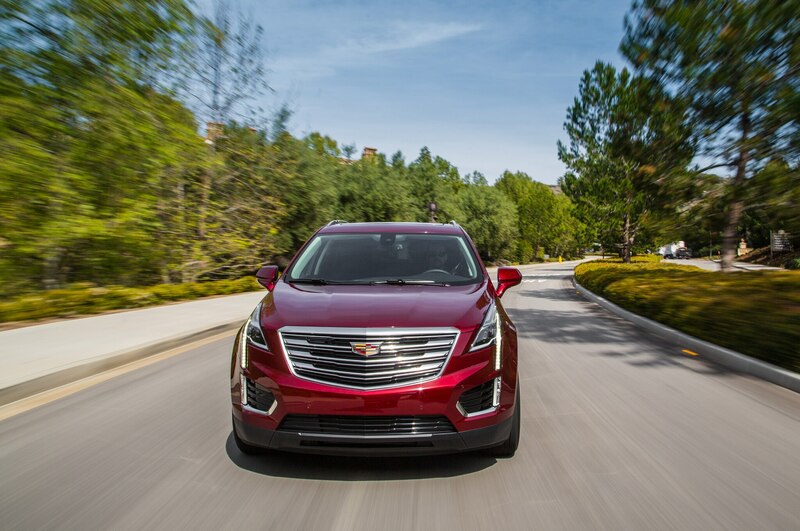 The Cadillac XT5 is a vehicle with real style, not only in the way it looks but also in the way it drives. 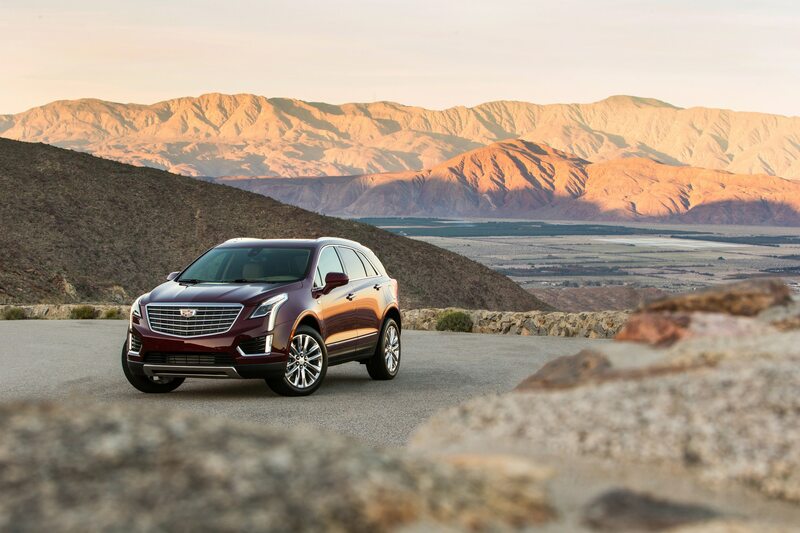 Sure, it has the daily utility you can find in soccer-mom crossovers, yet we like it because it has the potential for grand touring that makes you want to drive to distant places and stay at fancy resorts. 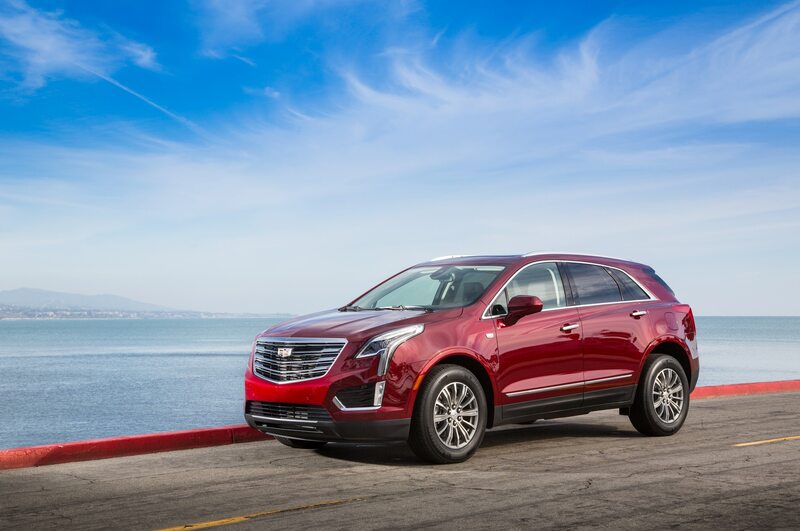 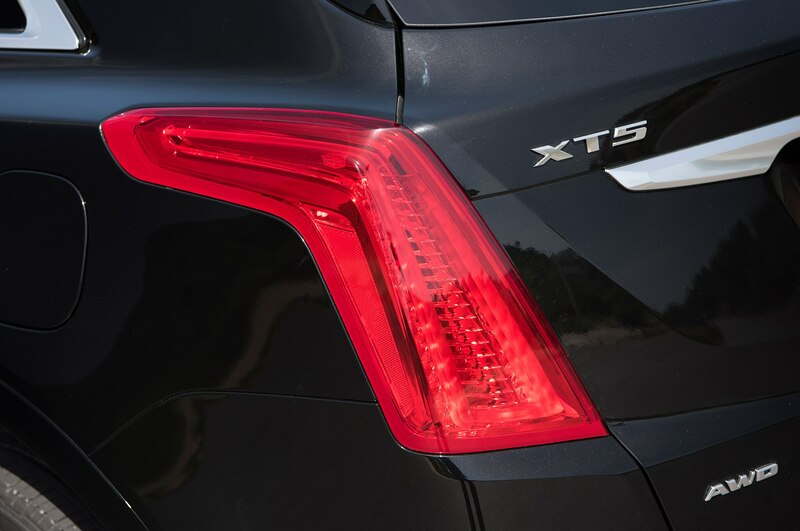 Cadillac keeps telling us the brand has a bright future, and the XT5 proves to us that it is making good speed in the right direction.